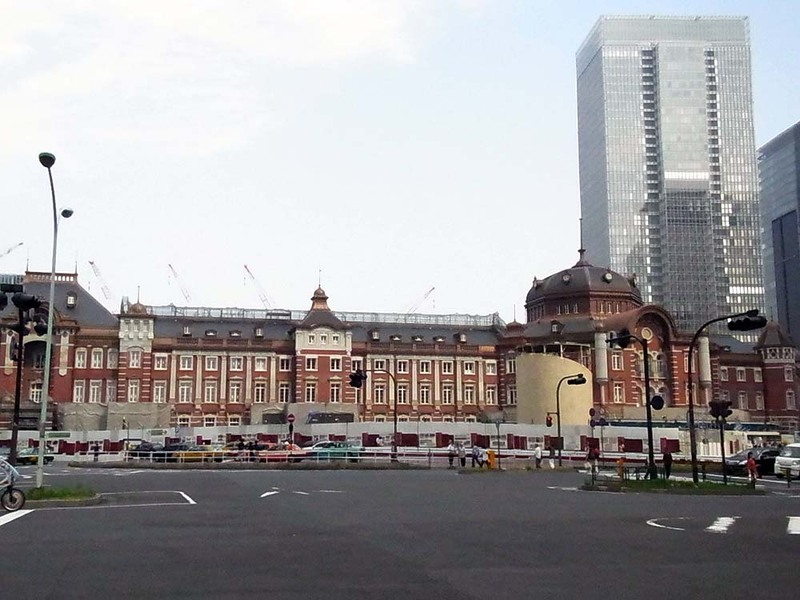 Tokyo Station building is a historic building of red bricks. 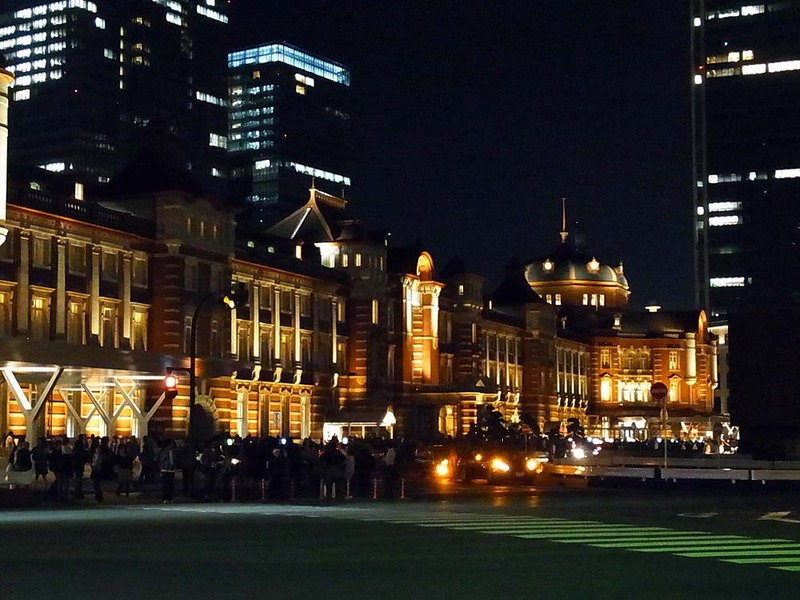 A scenery in front of the west side exit of Tokyo Station. 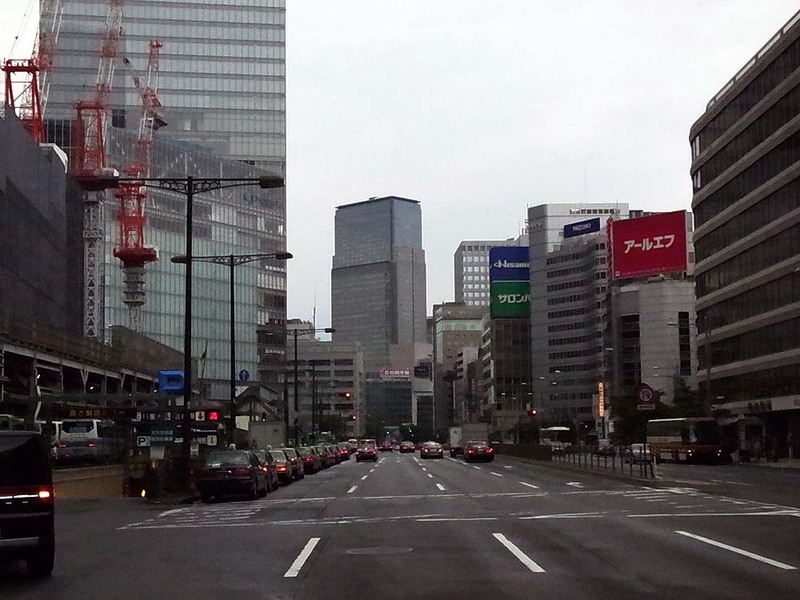 The main street to the west direction from Tokyo Station. 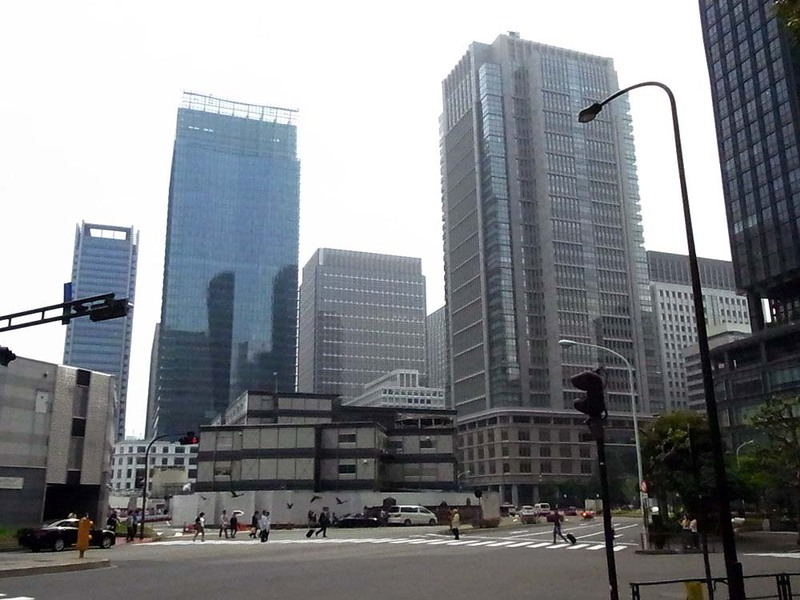 Marunouchi and Ootemachi area, the west side of the station, is a business district. 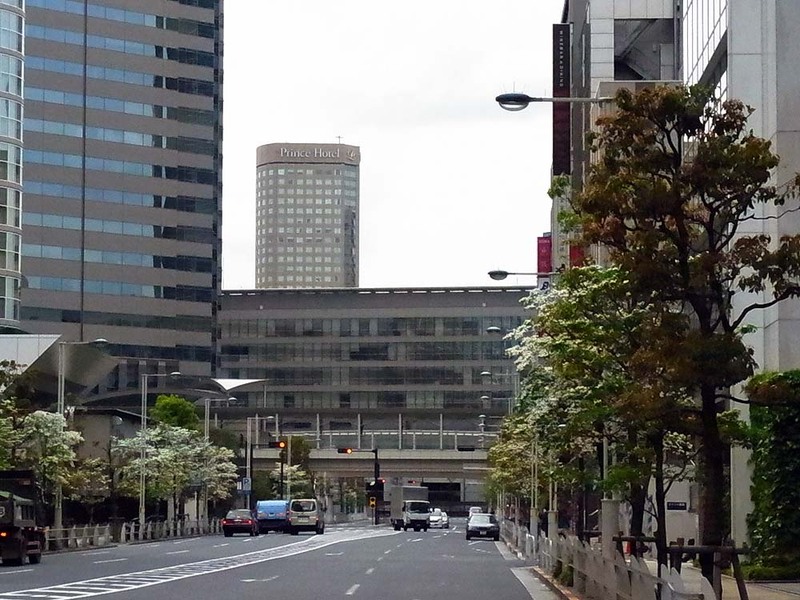 Marunouchi direction from the front of the station. 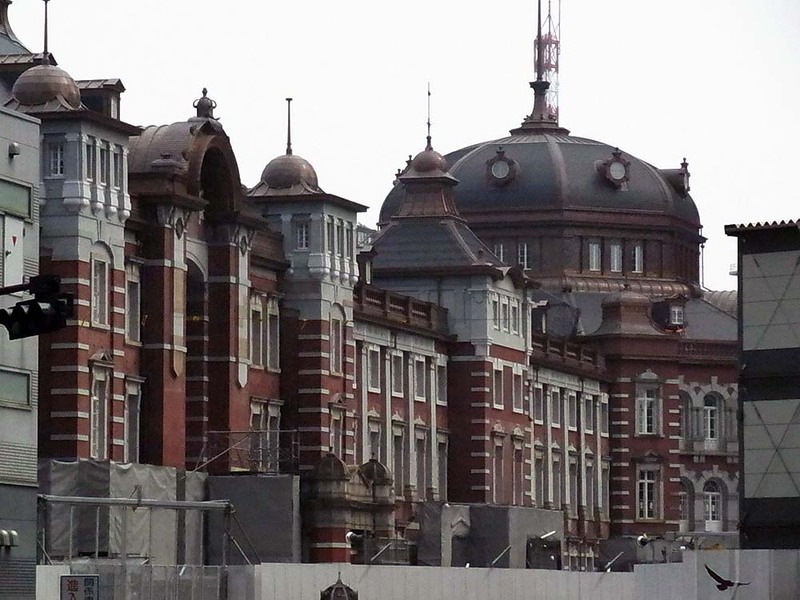 The east side of Tokyo Station. The main street in the east side of the station. 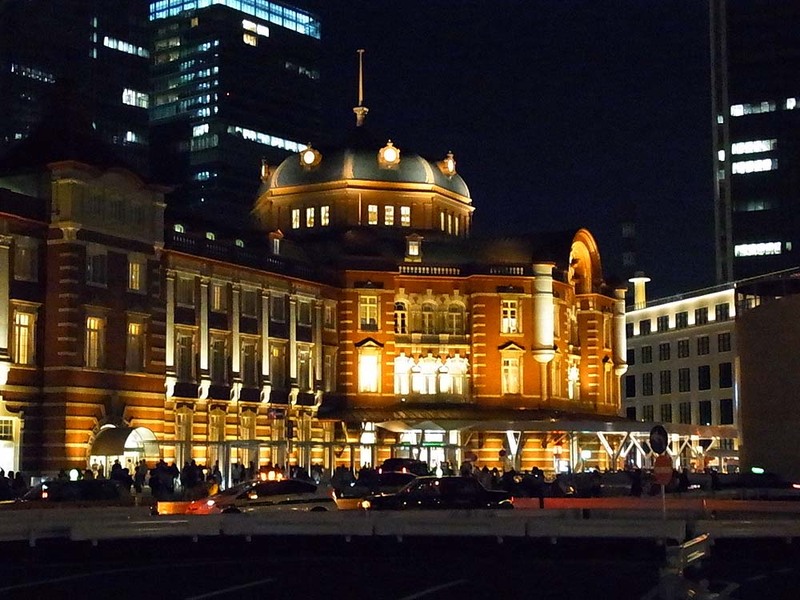 A night view of Tokyo Station. 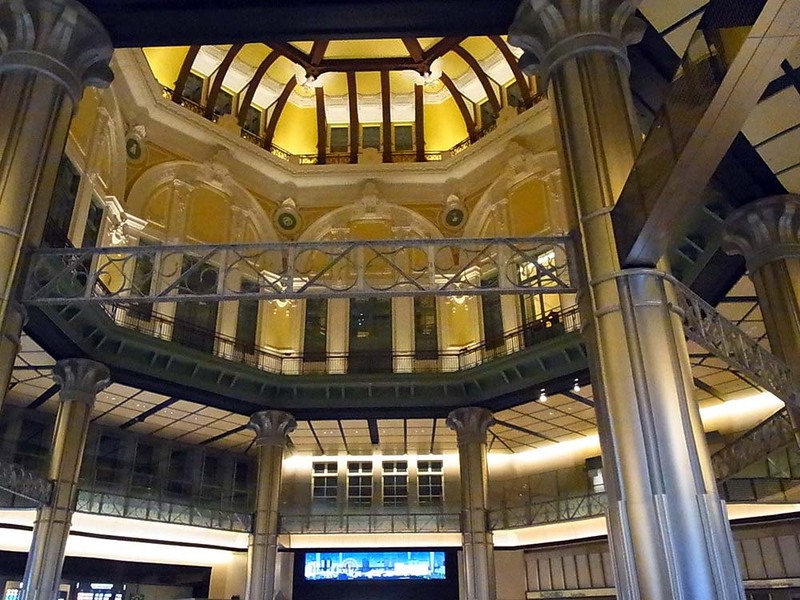 The inside of Tokyo Station building. 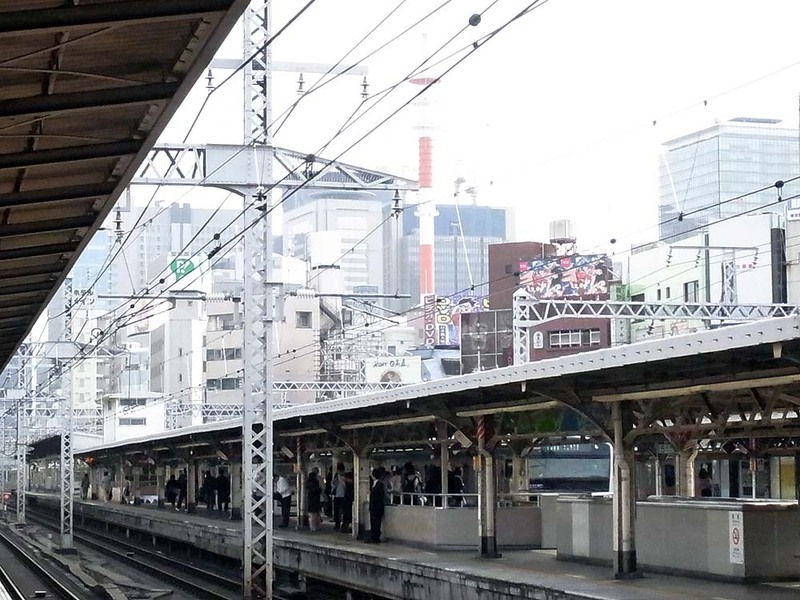 Yurakucho Station. 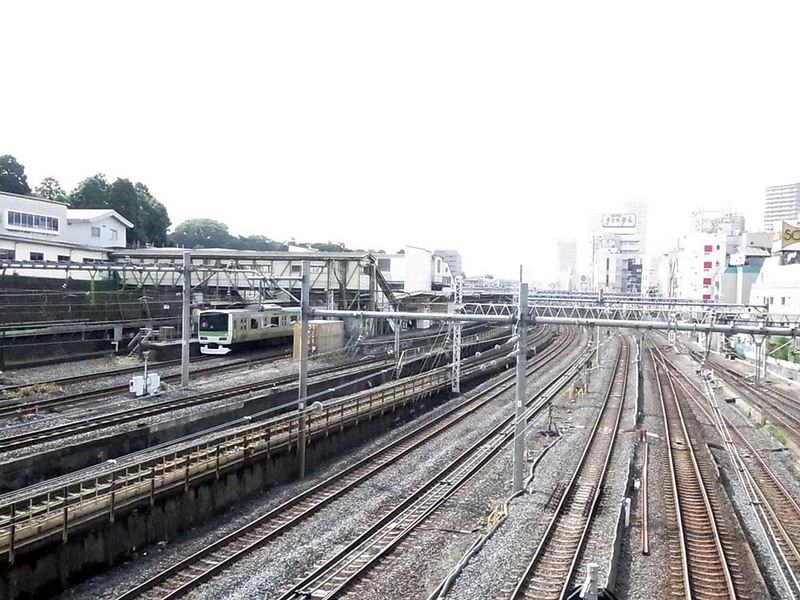 It is a old station. 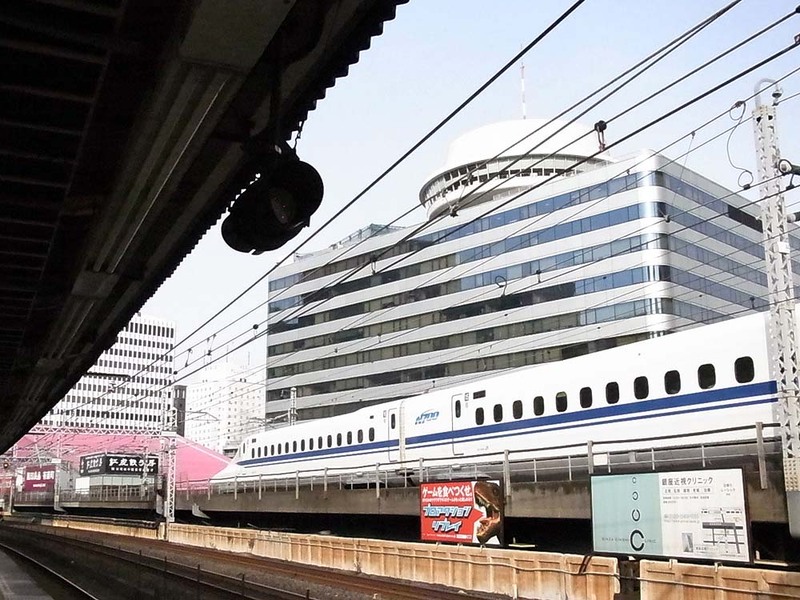 Shinkansen from the view of Yurakucho Station. 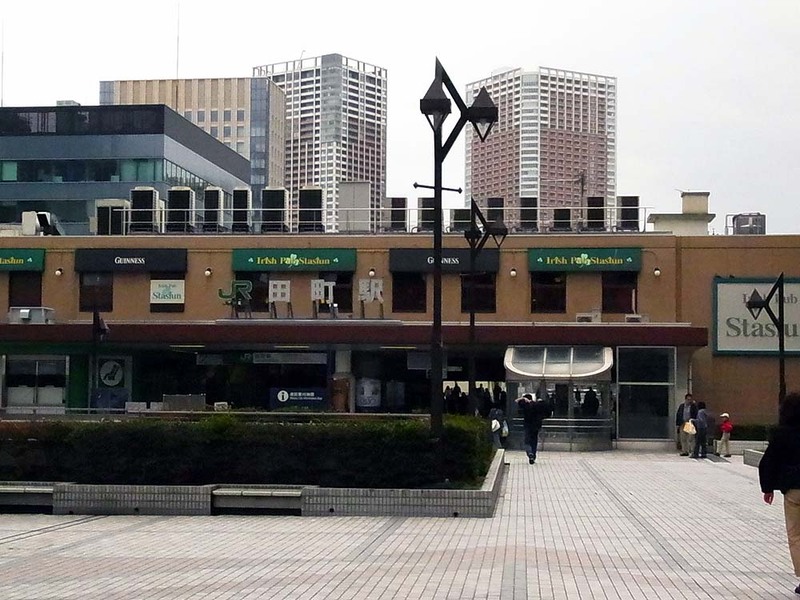 The east side of the station is the gateway to Ginza. 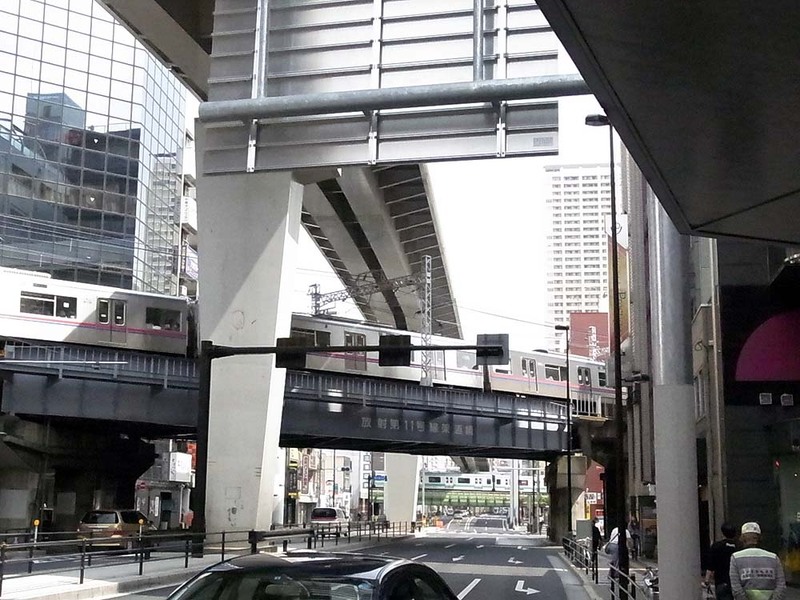 Passage under the guard of the railroad line near Yurakucho Station. 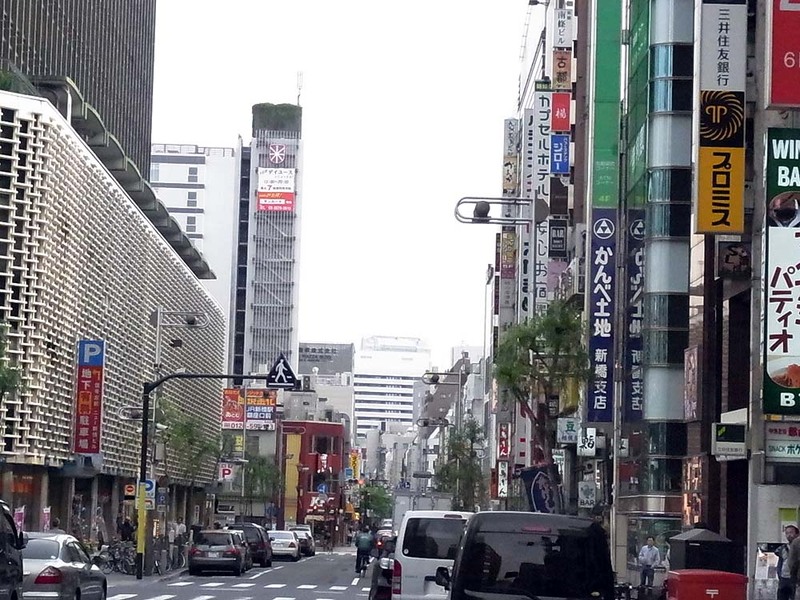 Ginza district seen from the south of the station. 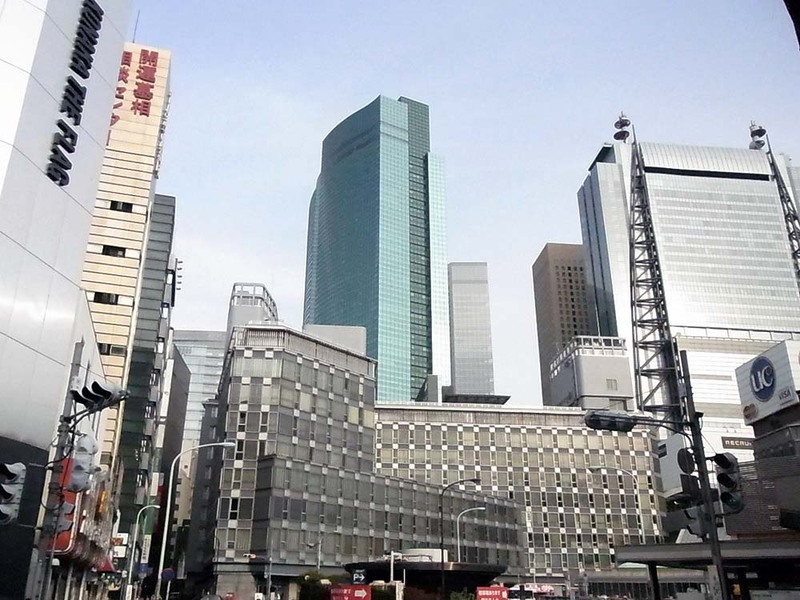 Skyscrapers seen from the east side of Shinbashi Station. 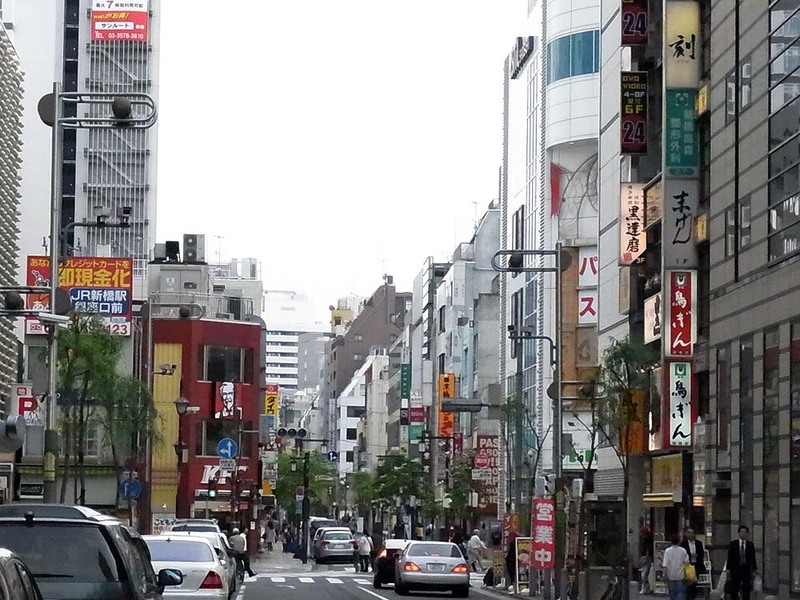 A street scene around Shinbashi Station. 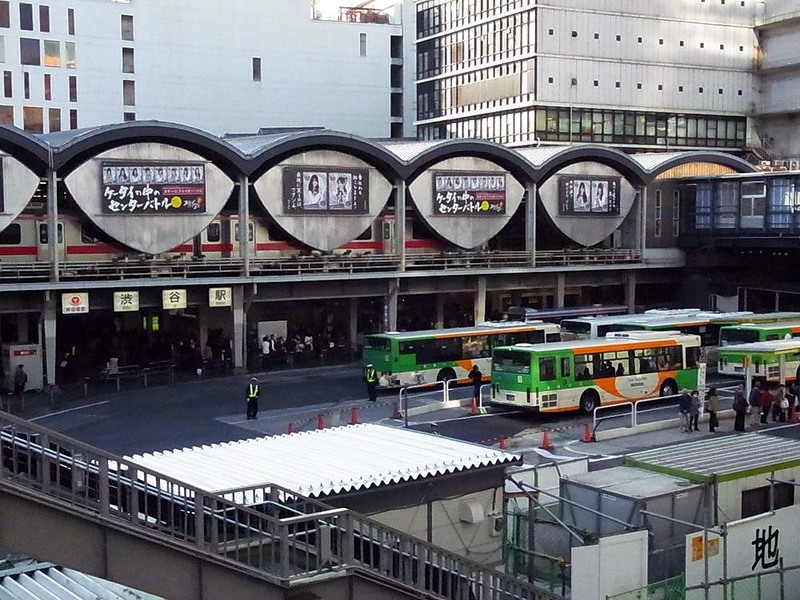 The entrance of Shinbashi Station. The color and shape makes us feel the old days. Station square in the west side of the station. 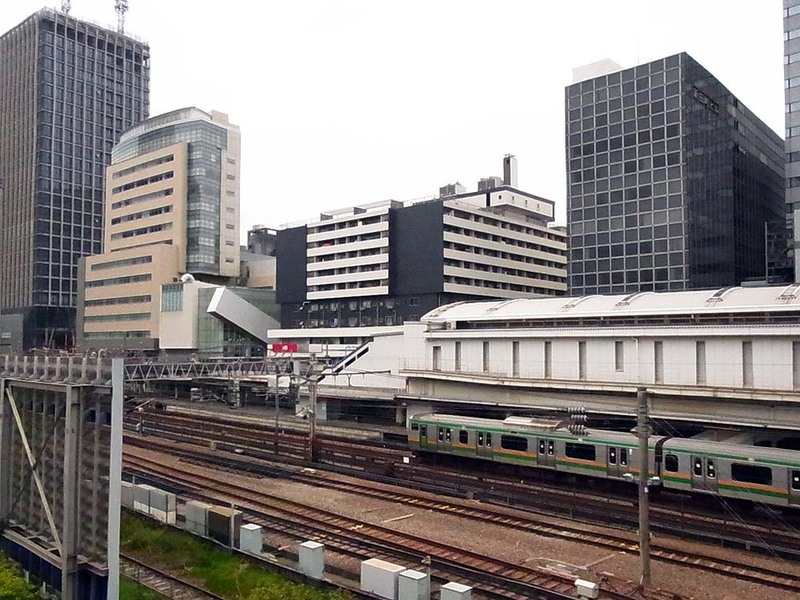 Shinbashi Station was the terminal station of Japan's first railway. 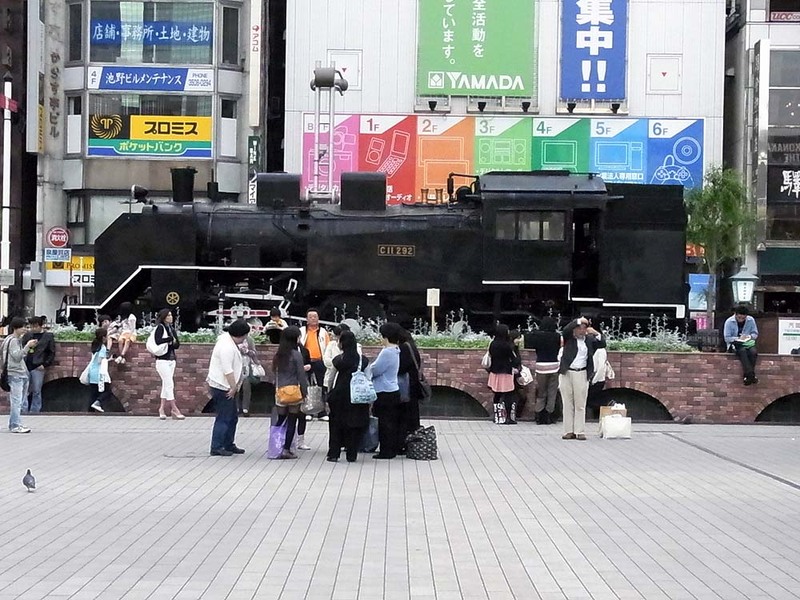 The steam locomotive used at that time is on display. 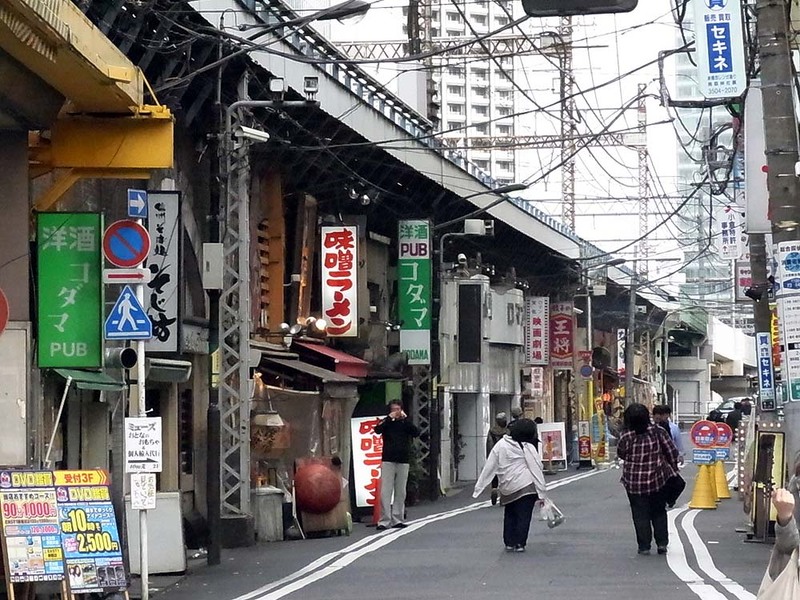 A street scene along Yamanote Line near Shinbashi Station. 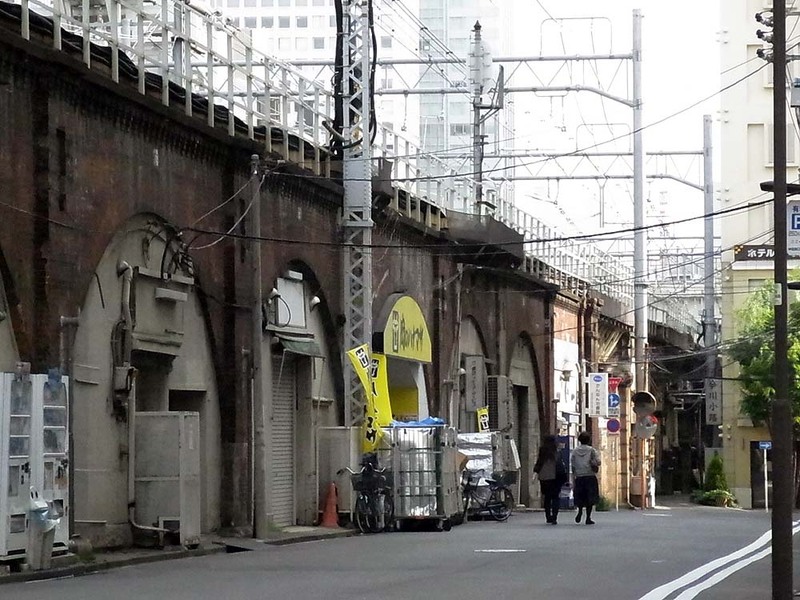 There are many old-fashioned restaurants under the railroad line. 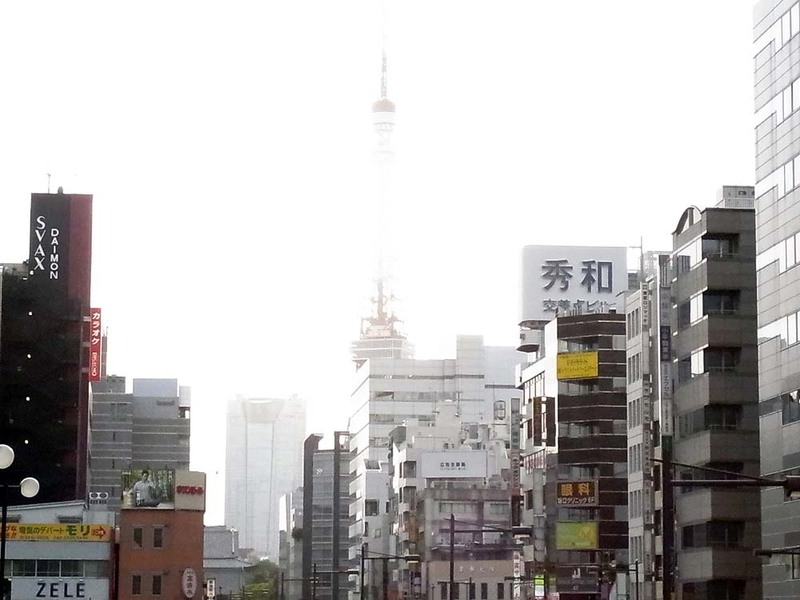 Tokyo Tower seen from Hamamatsucho. 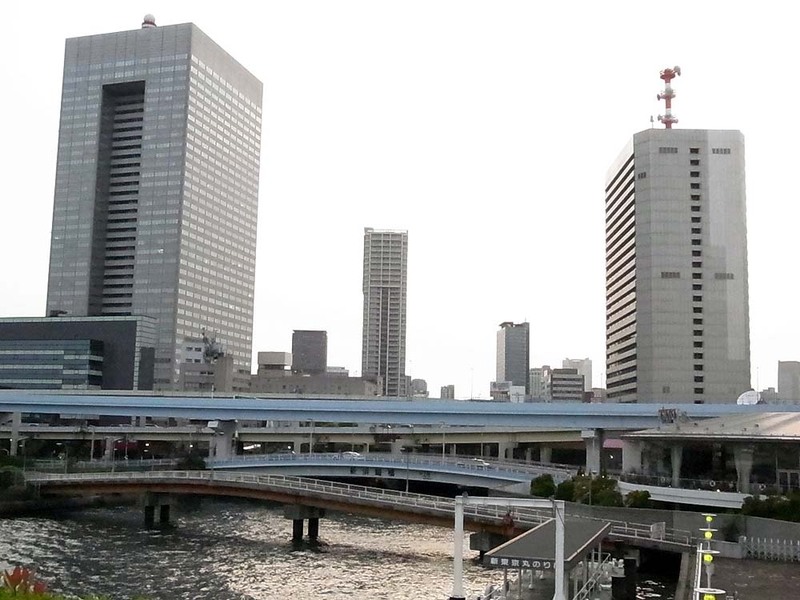 A scenery toward Hamamatsucho seen from Takebashi ferry pier facing Tokyo Bay. 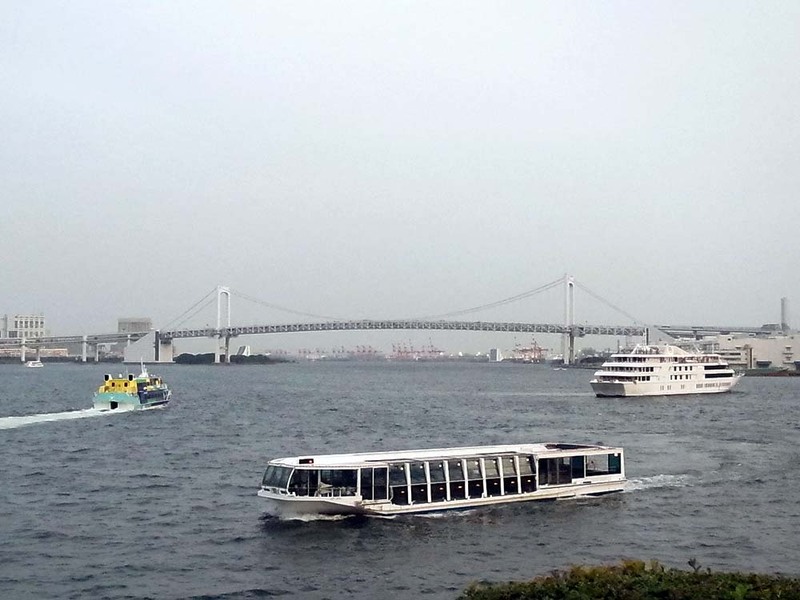 Tokyo Bay and Yokohama Bay Bridge seen from Takebashi ferry pier. 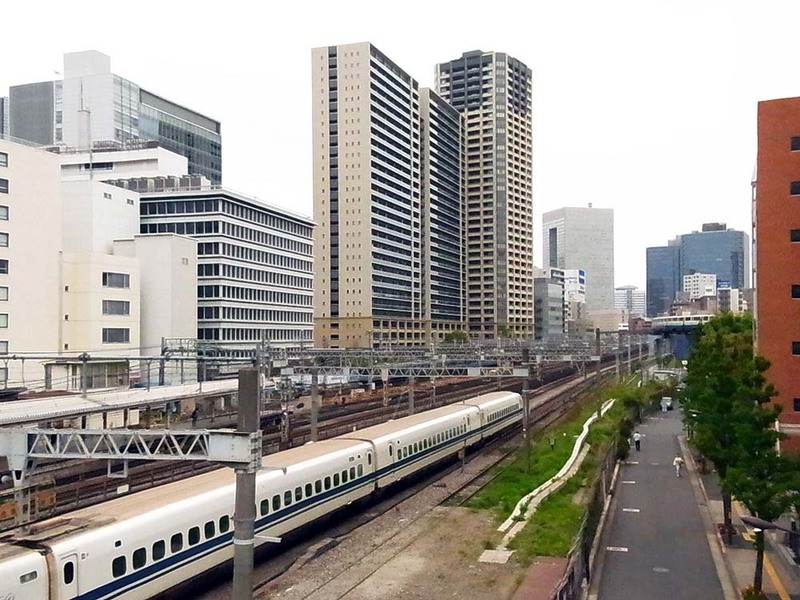 A landscape of Tamachi with Shinkansen. 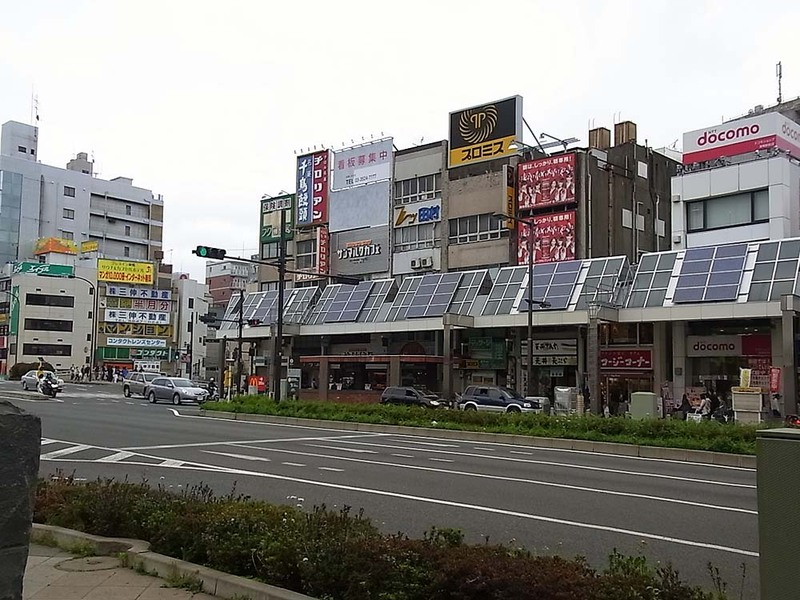 The south side of Tamachi Station. It is the direction toward Tokyo Bay. The main street in the south side of the station. The Route 1 boulevard in the north side of the station. Along the Route 1 are lined up large office buildings. 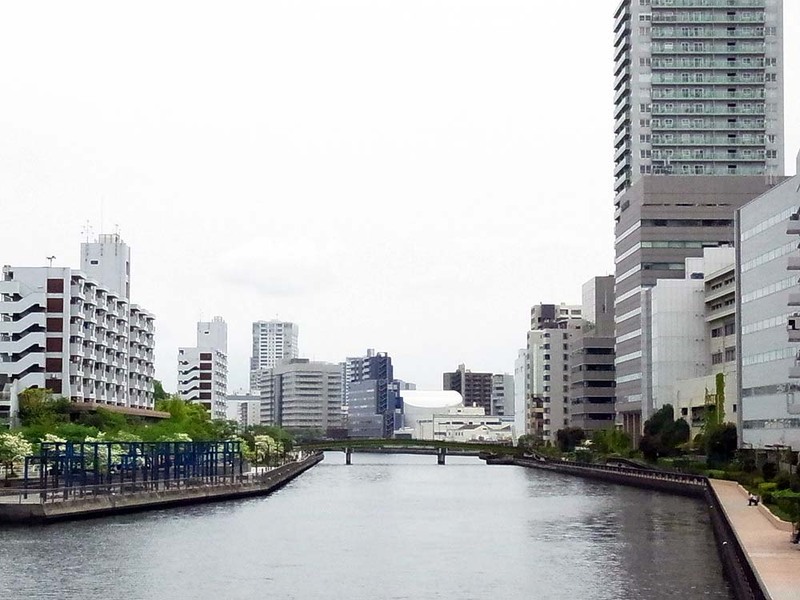 There is a canal near Shinagawa Station. Buildings and apartment houses are built on the both sides of the canal. It is close to Tokyo Bay. 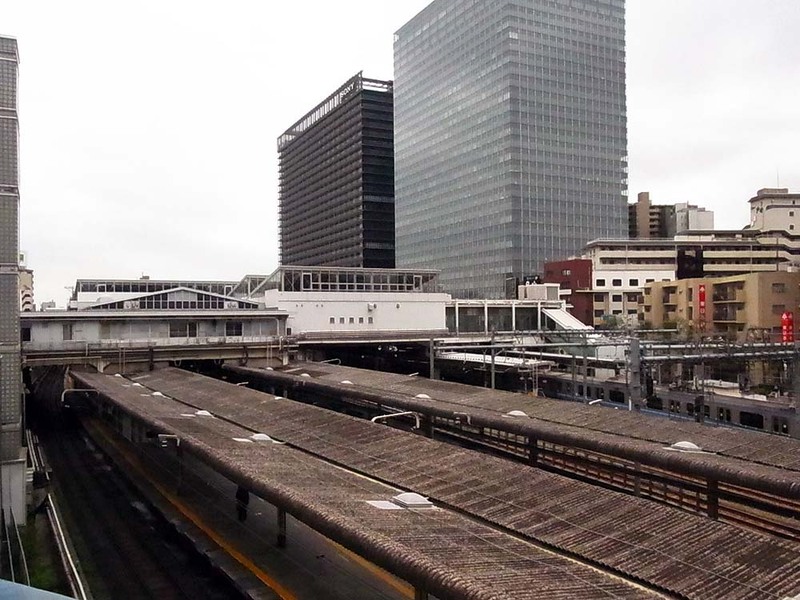 Shinagawa Station seen from the south side of the station. The south exit of the station. 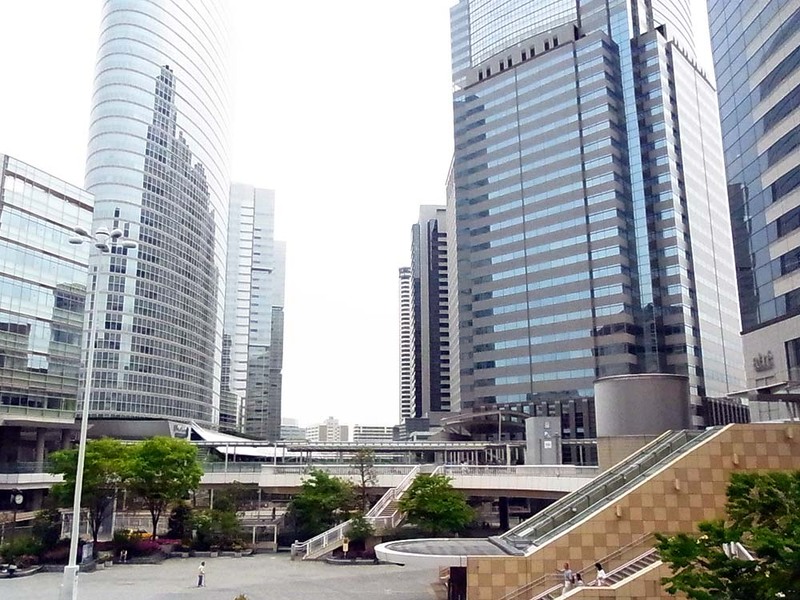 Now modern high-rise buildings are built around the station. The landscape was also changed significantly. 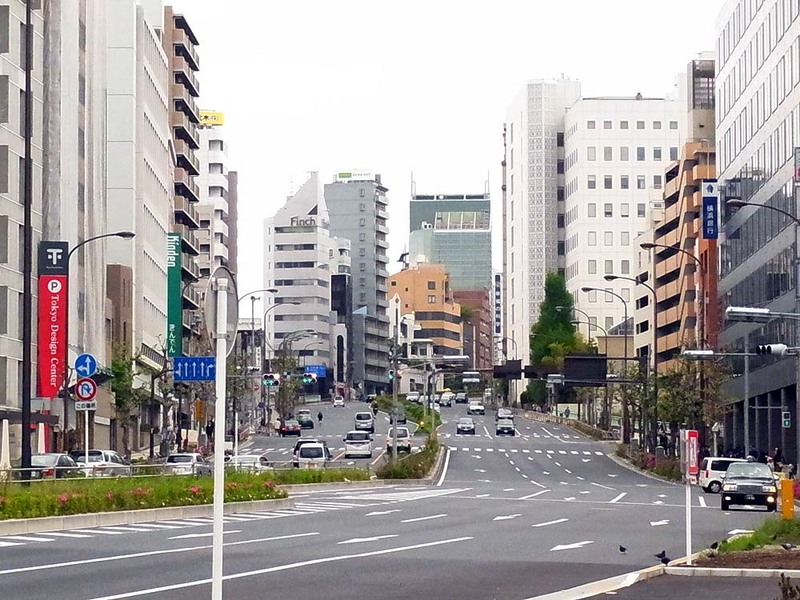 The main boulevard called Daiichi-keihin that runs in front of the station north exit. 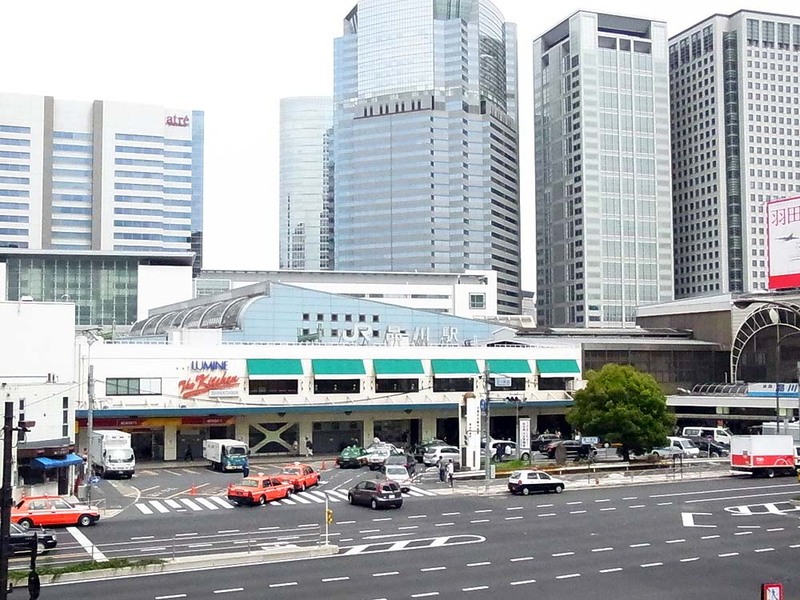 The north exit of Shinagawa Station. 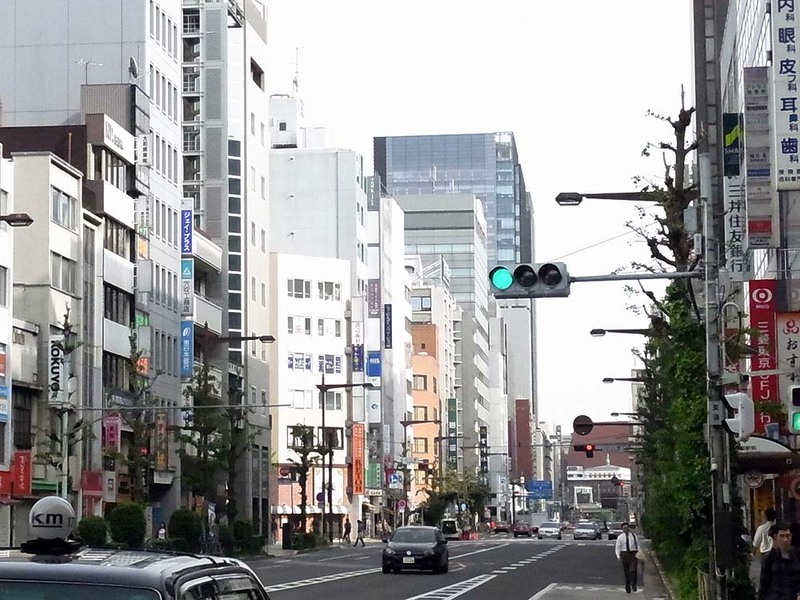 The street toward Takanawa district in the north side of Shinagawa. 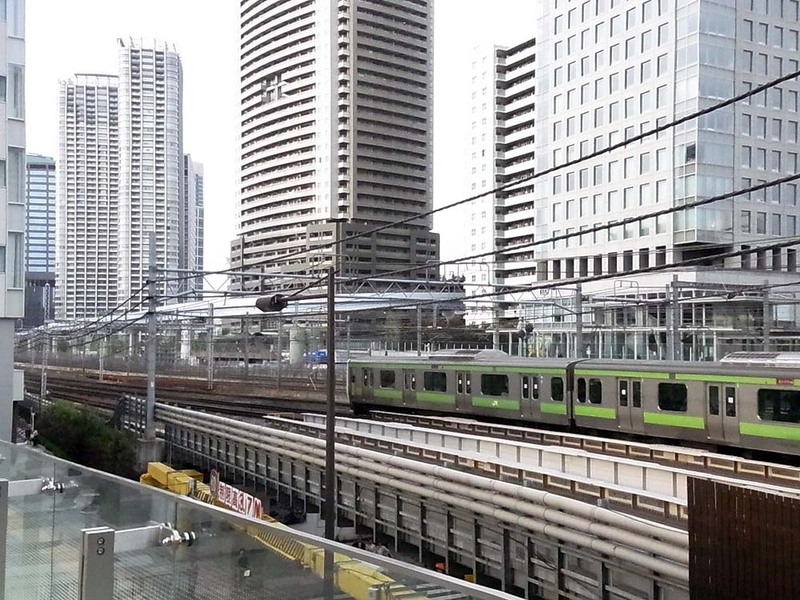 A scenery seen from Shinagawa Station platform. 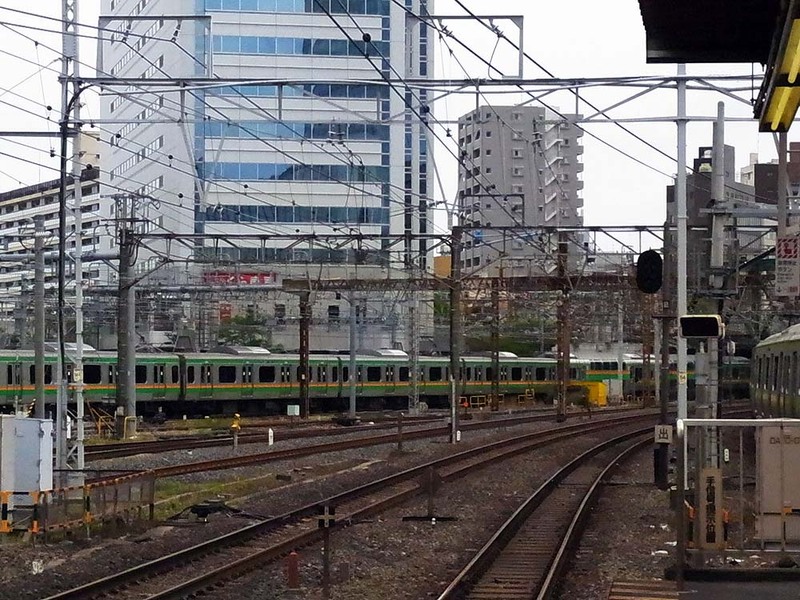 The platform of Osaki Station. 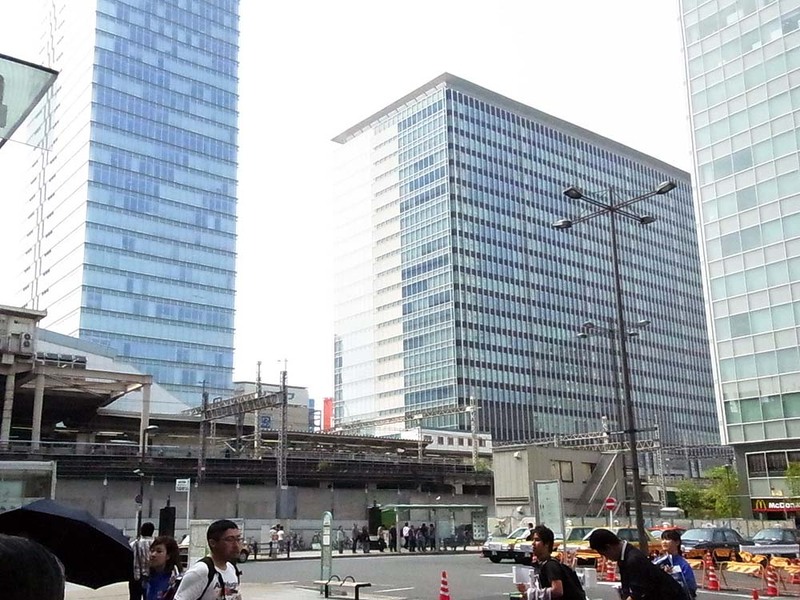 The station is an old one, but new high-rise buildings are built around the station. 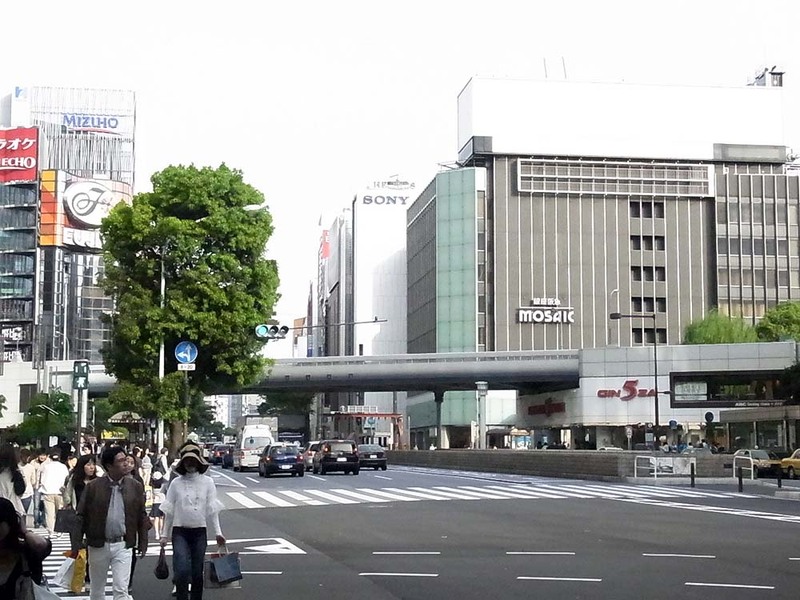 A view around Osaki Station. 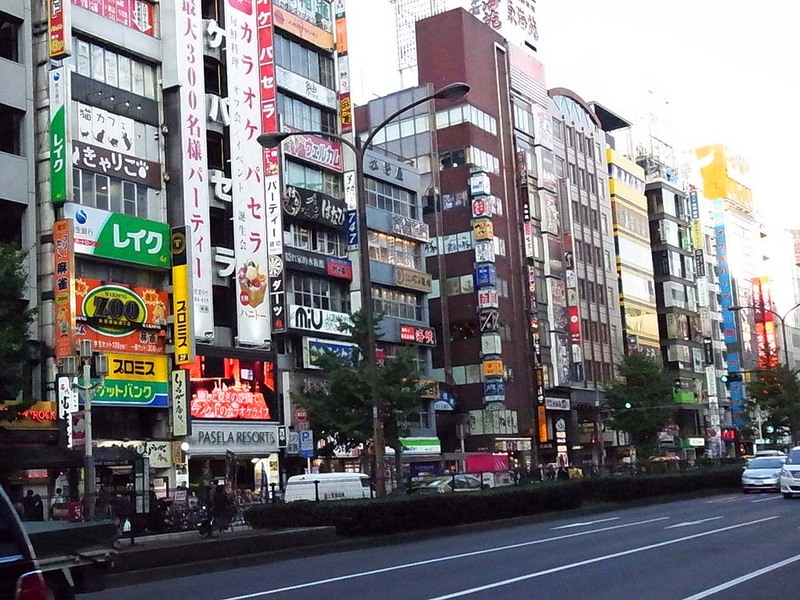 There are many large apartments here. 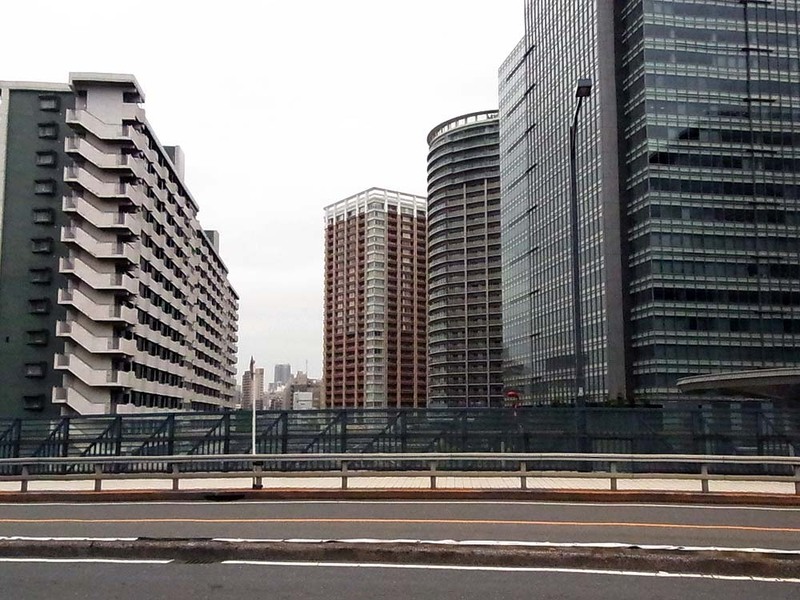 New large buildings show that Osaki is a region that has made great transformation recently. 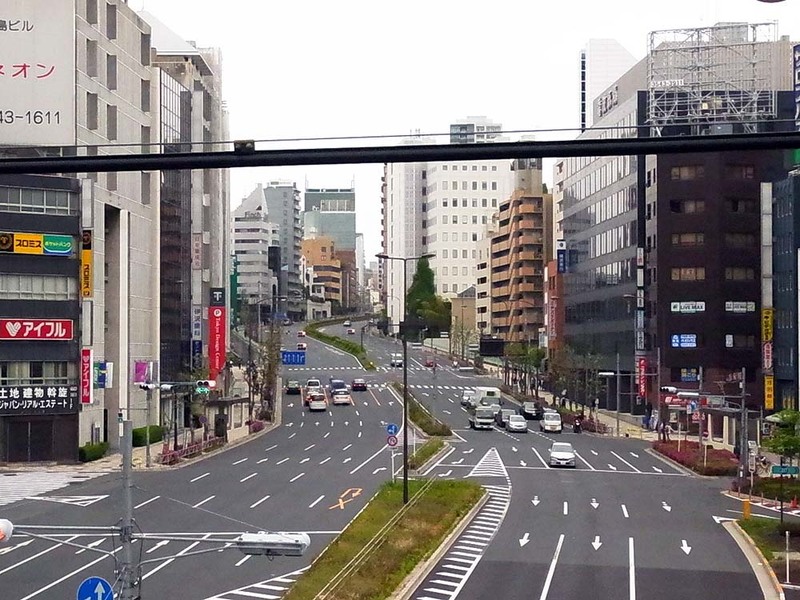 The Route 1 boulevard seen from the platform of Gotanda Station. 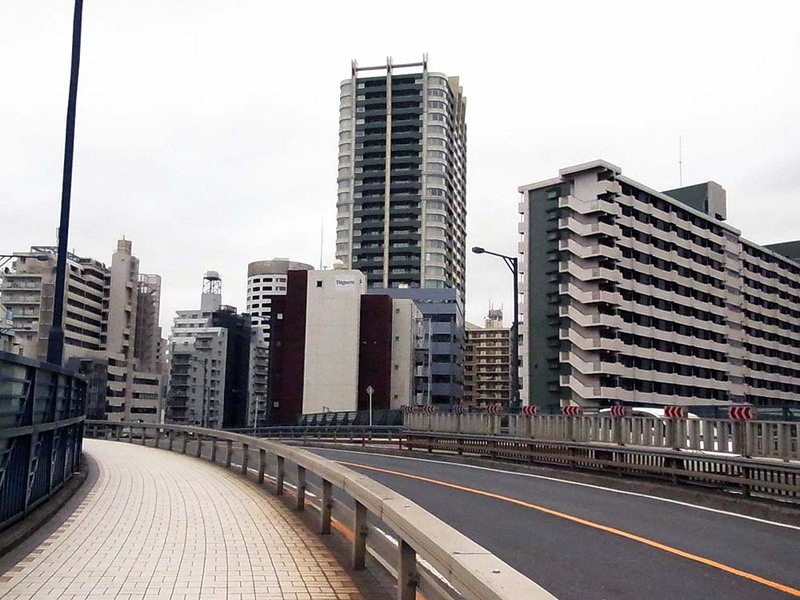 The Route 1 boulevard seen from the east side of the station. 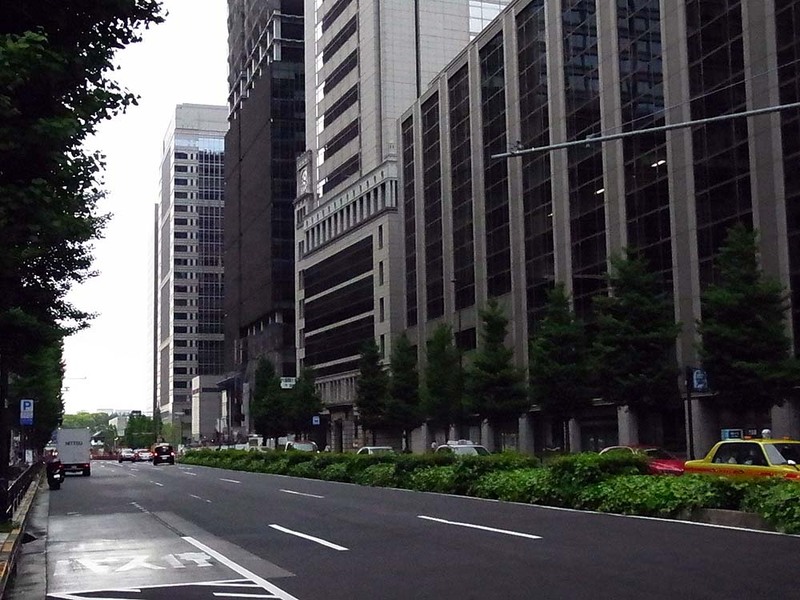 Office buildings are lined up on the both sides of the boulevard. The west side of the station seen from the platform. The boulevard in front of the station. The main street in the west side of the station. 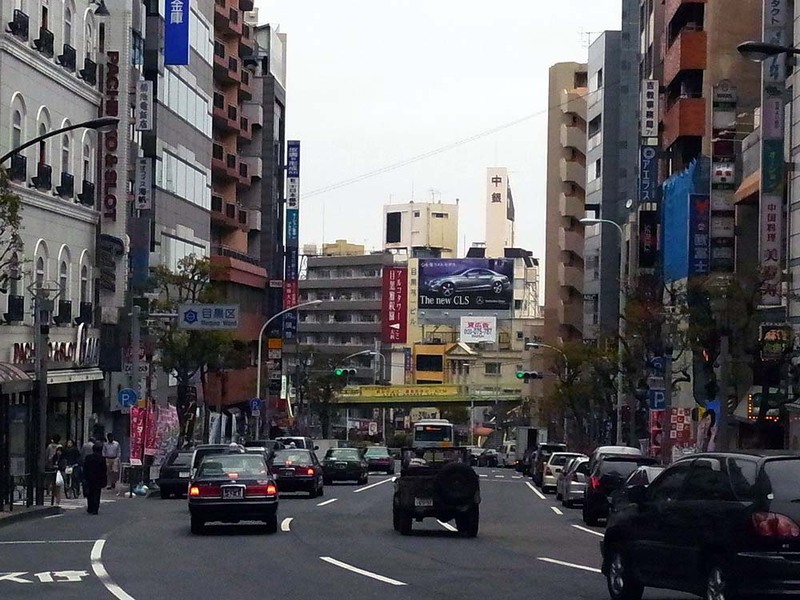 If you go one block inside from the main street, it is a quiet upscale residential area. 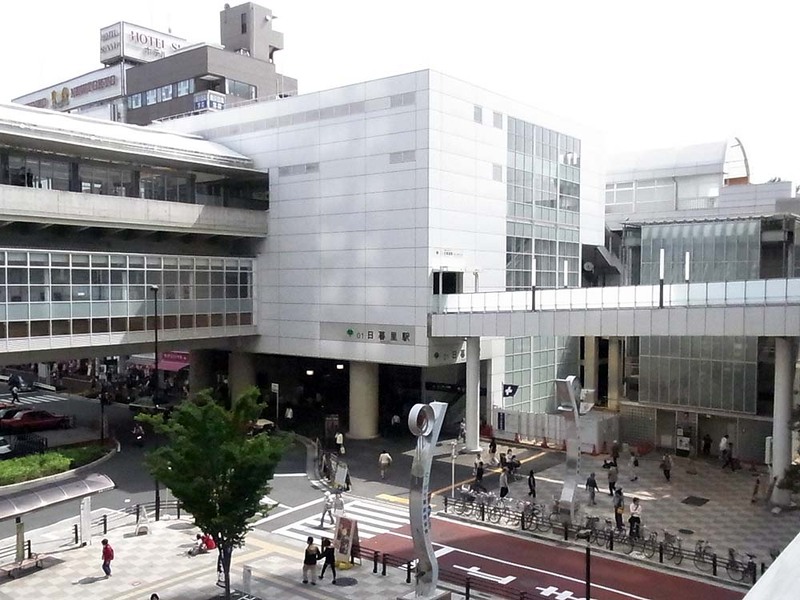 The east side of Ebisu Station. 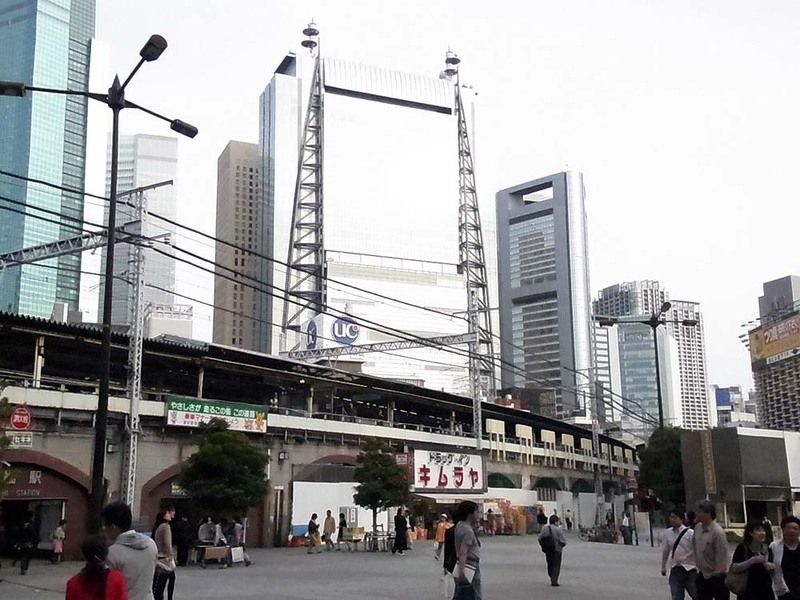 A scenery in the east direction from the station. 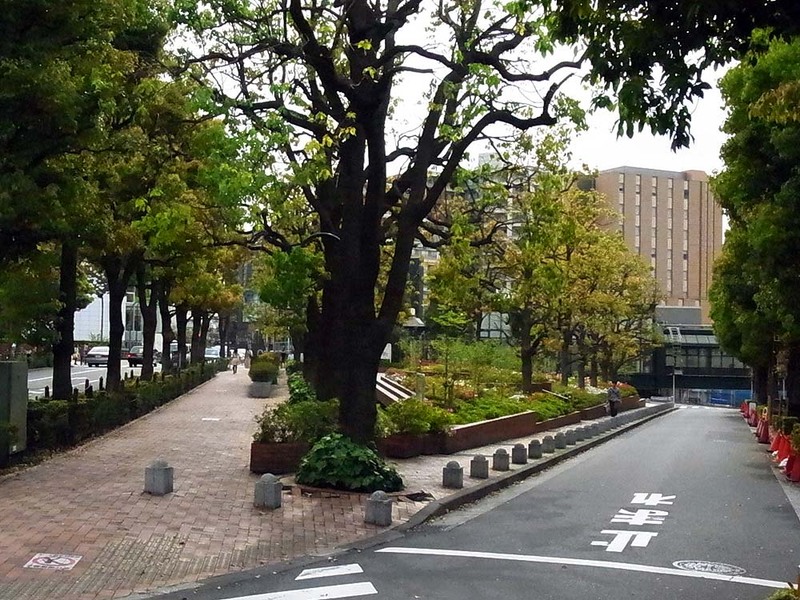 If you walk about 300m to the south from the station, you find Ebisu Garden Place. 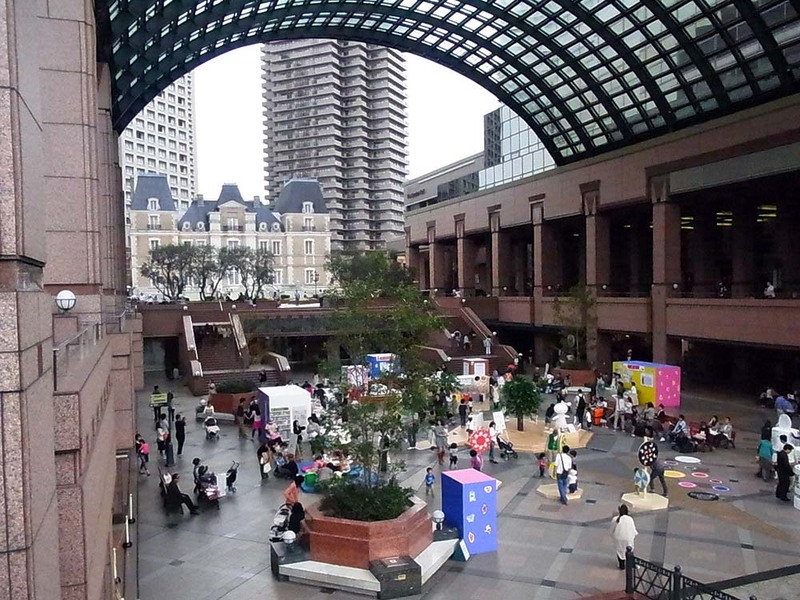 The square in the center of Ebisu Garden Place. 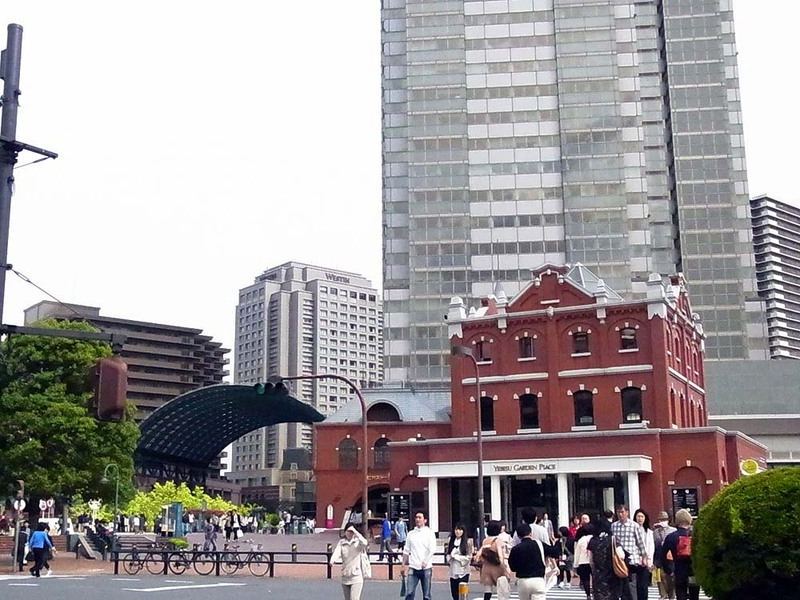 A scenery around Ebisu Garden Place. 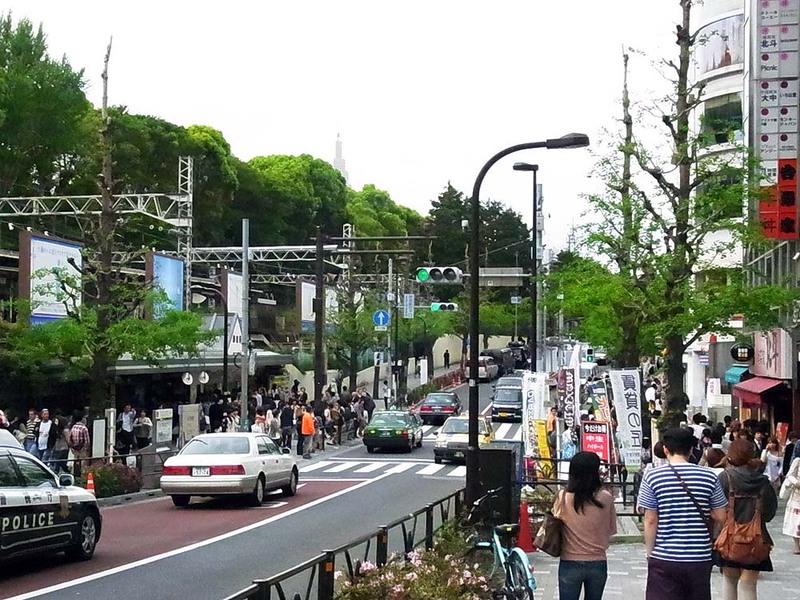 Another photo taken around Ebisu Garden Place. 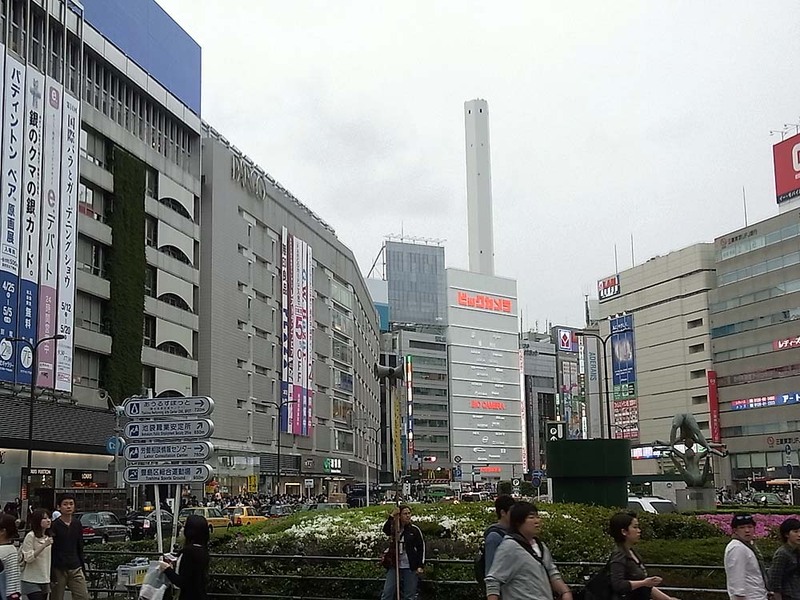 The east exit of Shibuya Station. 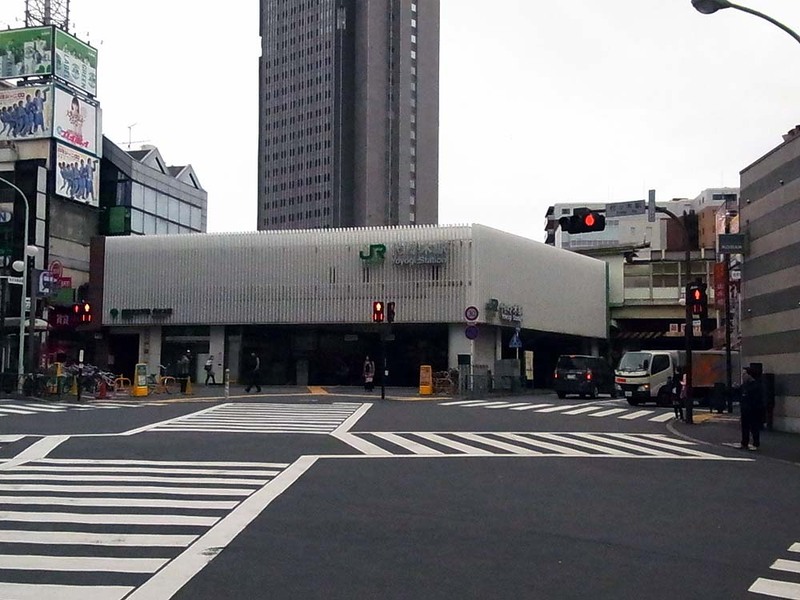 There is a square in front of the east exit of the station. 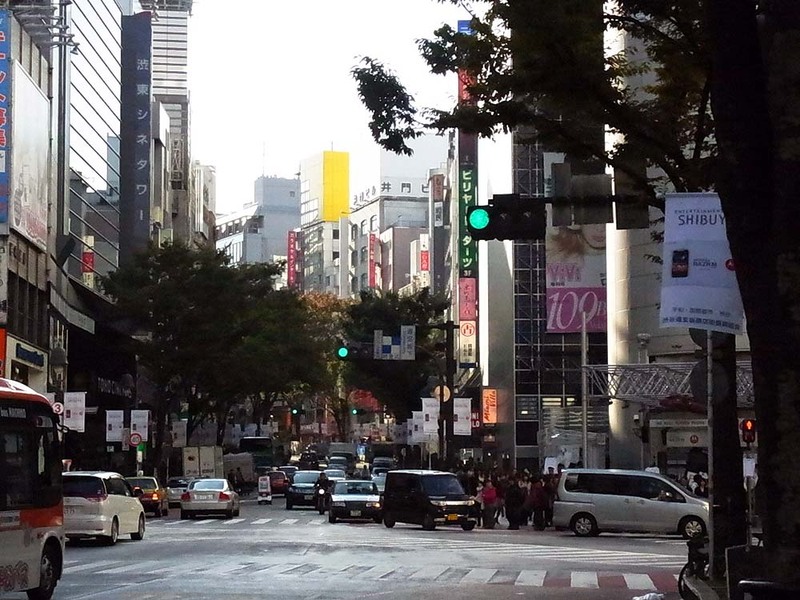 This scenery is a typical one about Shibuya. 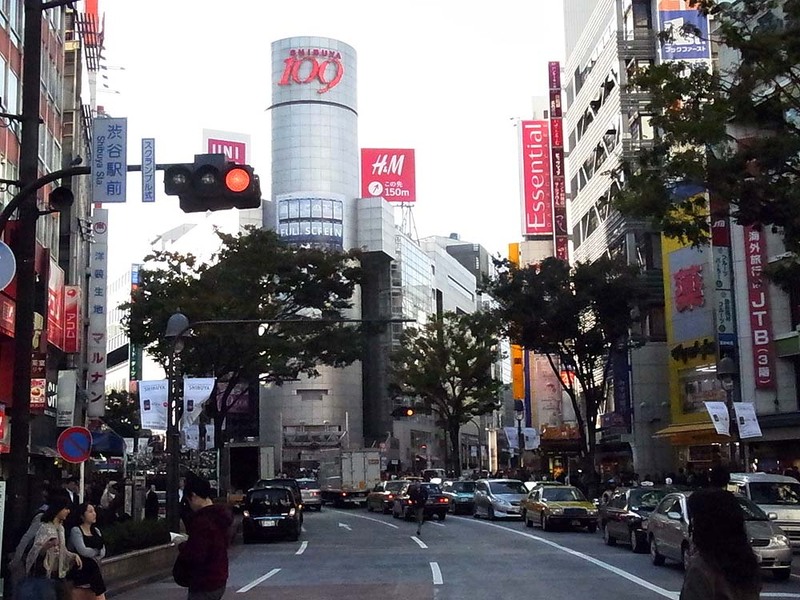 The main boulevard in front of Shibuya Station. 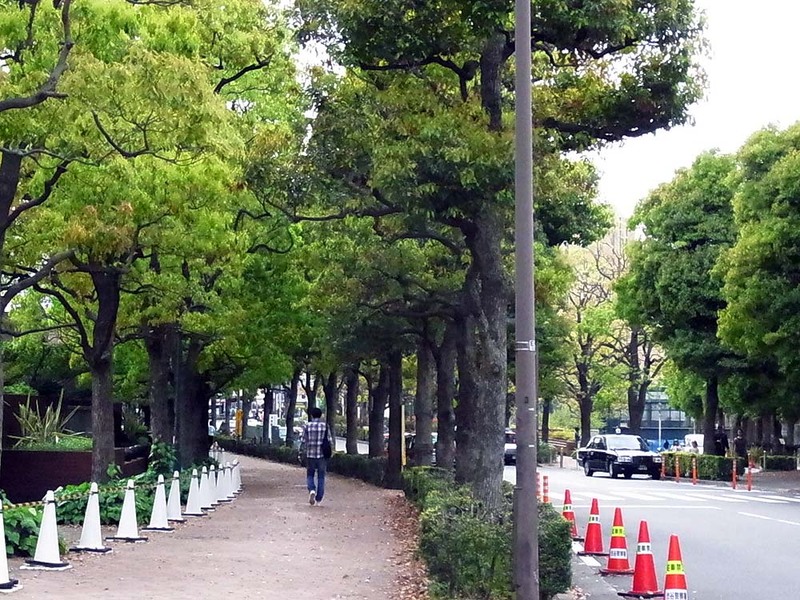 Also, a scenery of the boulevard. 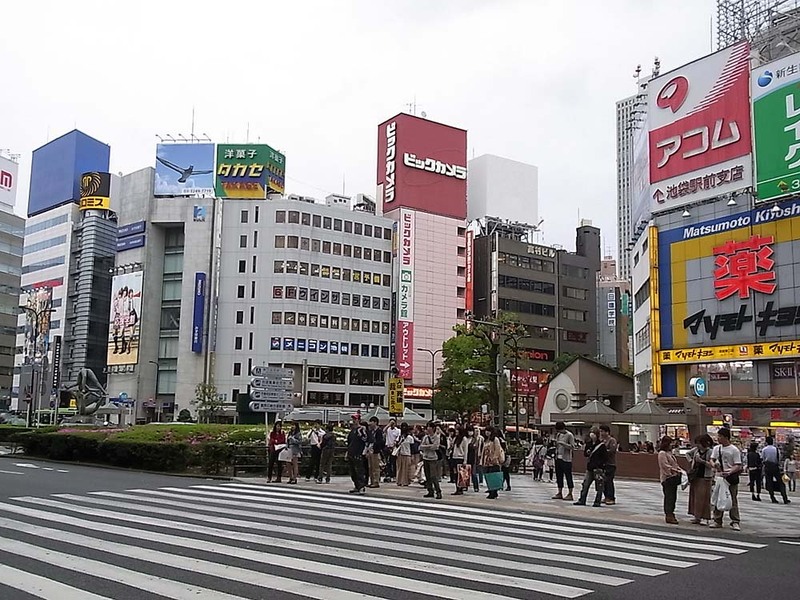 This is Shibuya Center-gai, the main street of Shibuya. 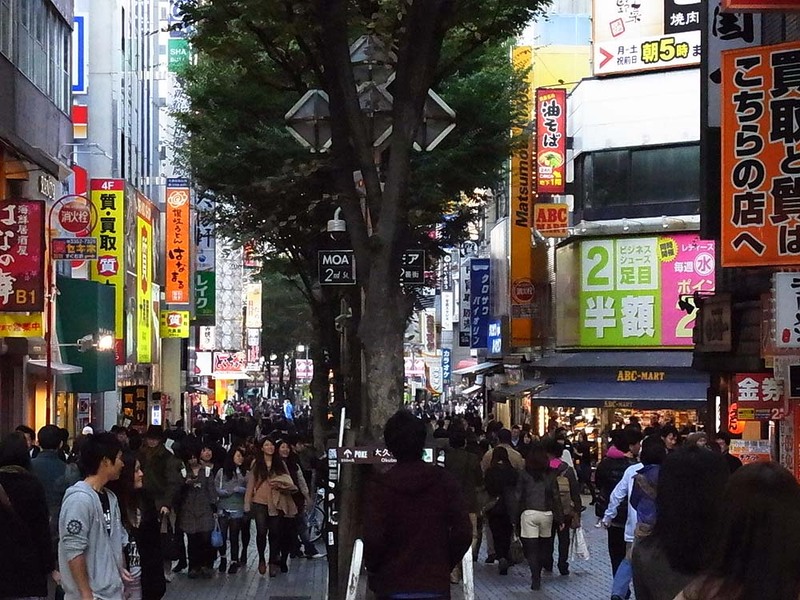 It is always crowded with people. 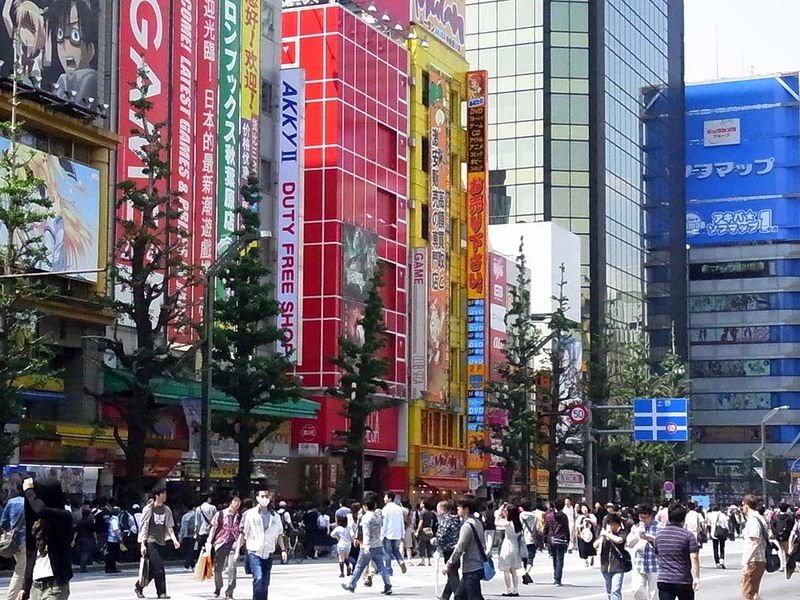 In Shibuya Center-gai, relatively small sized fashion clothing, general merchandise, food, and beverage outlets are arranged around. 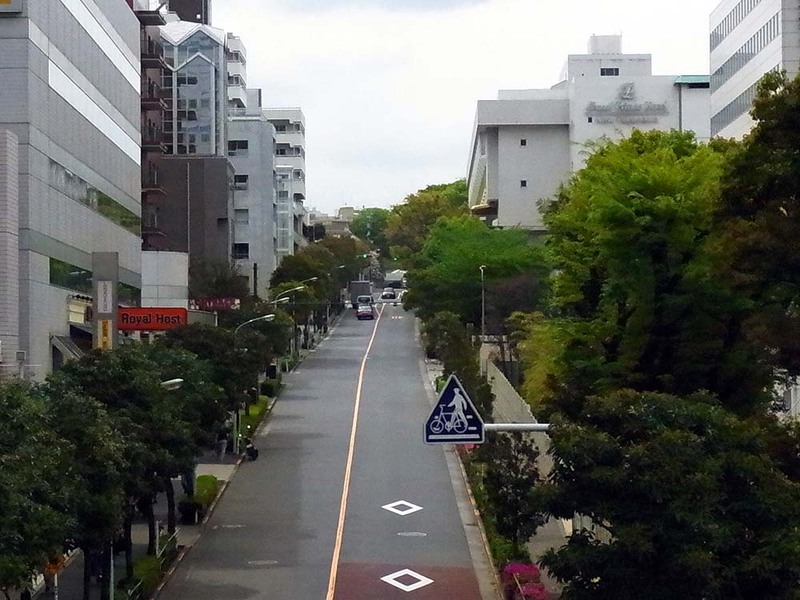 Spein-zaka street. 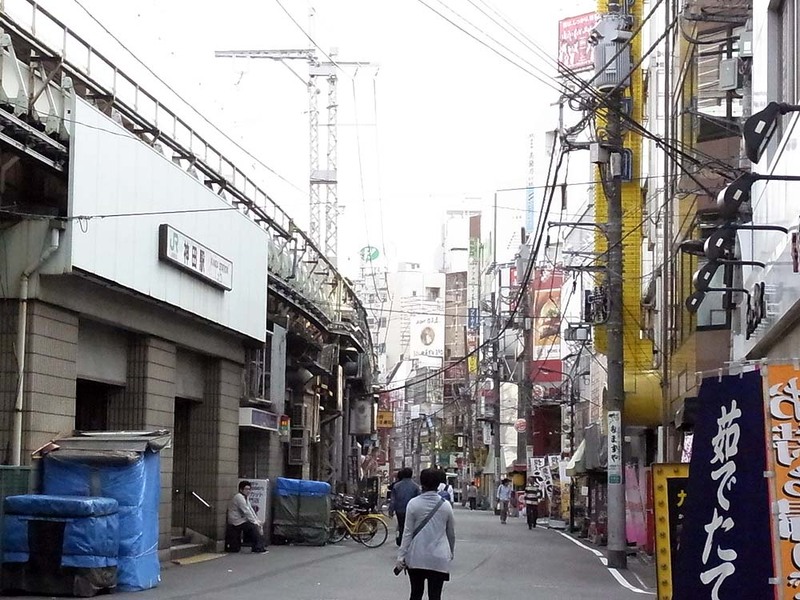 It is a narrow street. 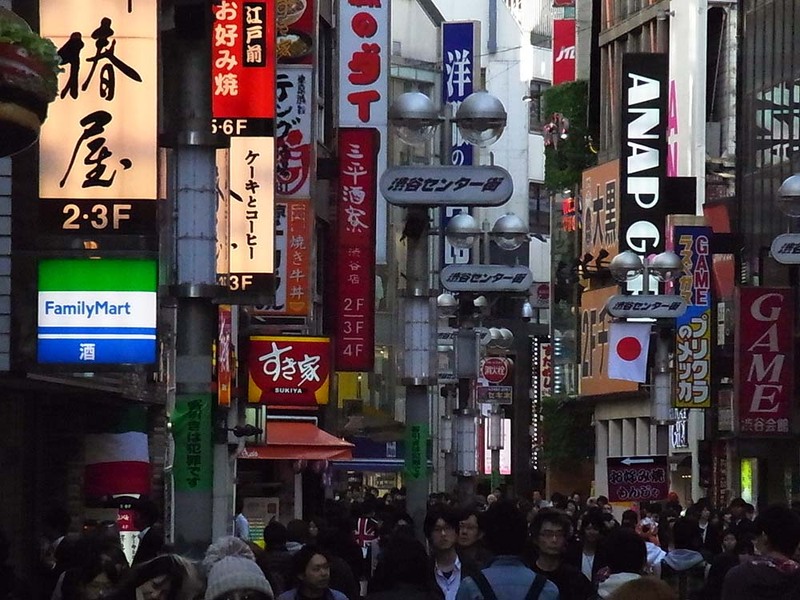 Fashionable shops of clothing and food are lined on the both sides of the street. 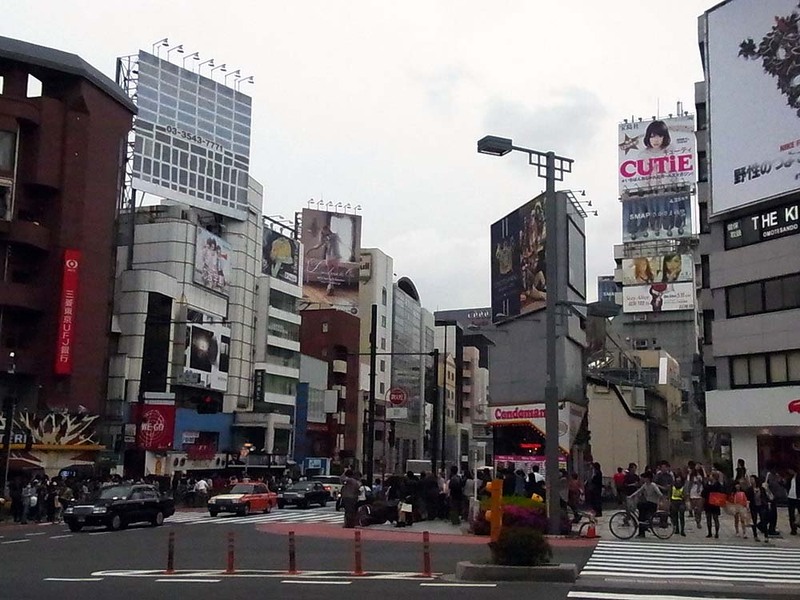 A scenery of the south side of Shibuya Station. There is a bus terminal. 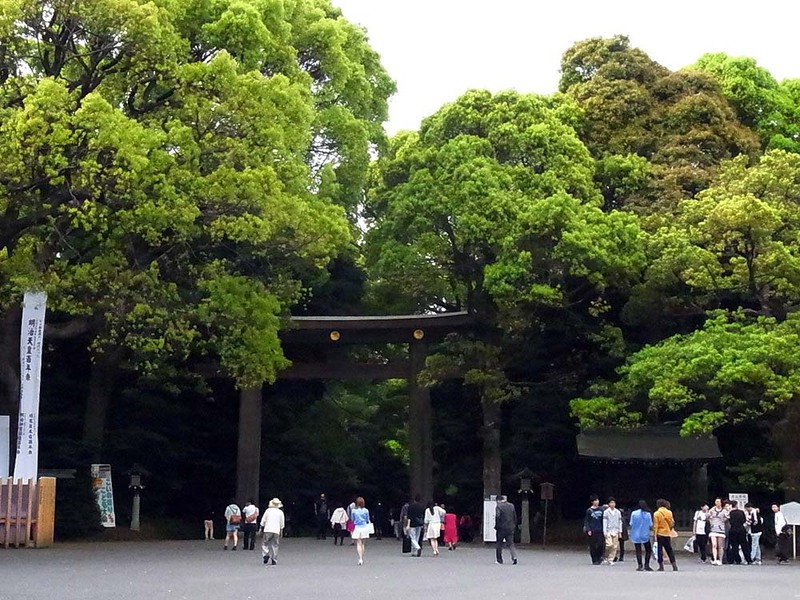 Meiji Jingu Shrine is in the west of Harajyuku Station. 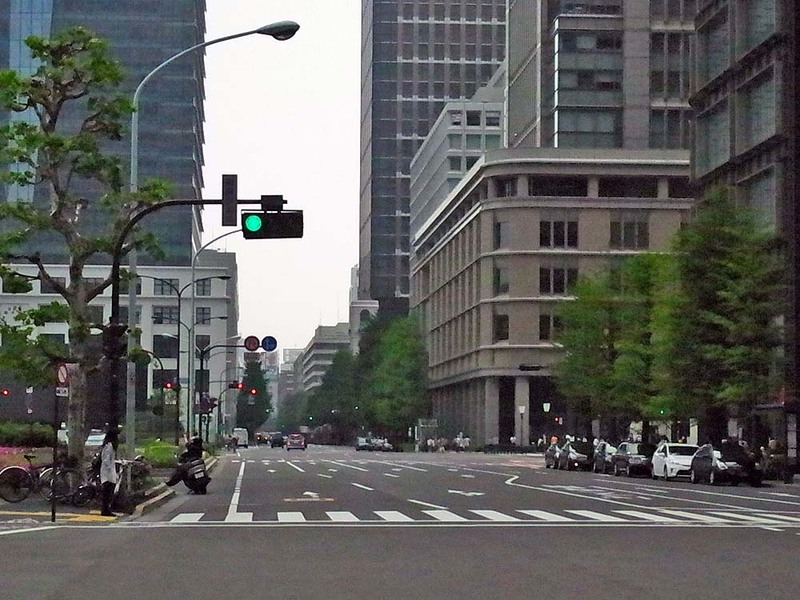 In the left side of the street on this photo is Meiji Jingu Shrine. 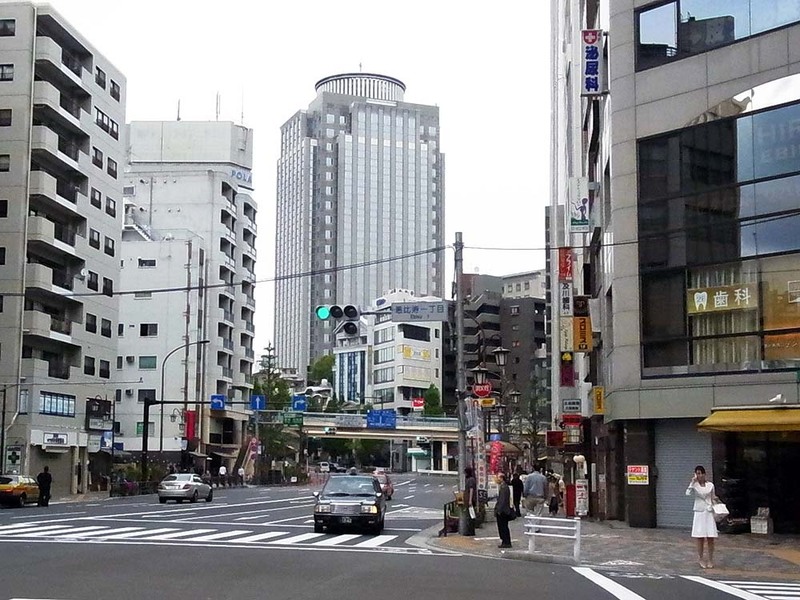 In the right side on the photo are modern fashion buildings. 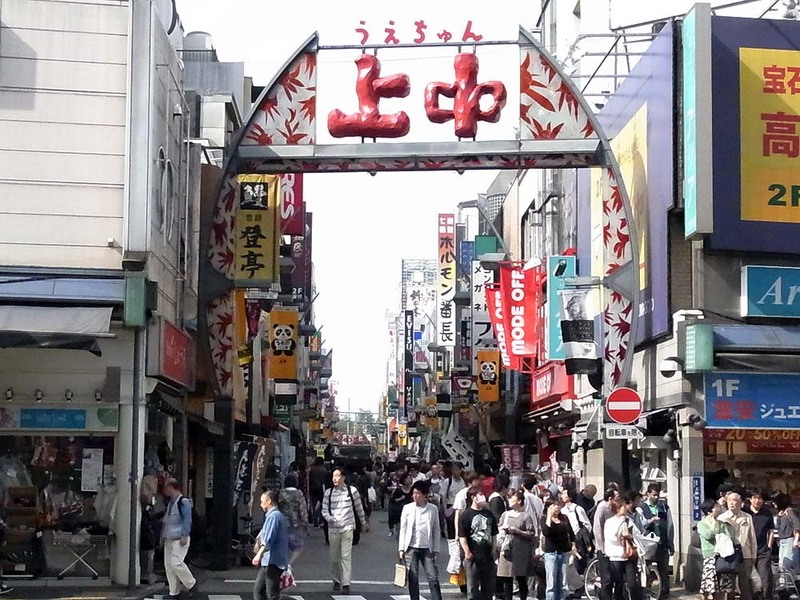 The entrance of Takeshita Street. 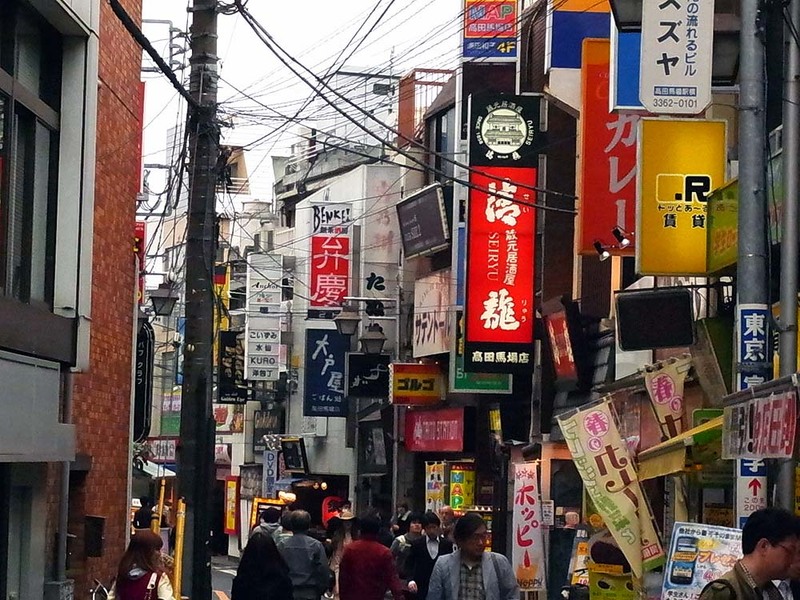 They are many small-scale shops of fashion clothing along the street. 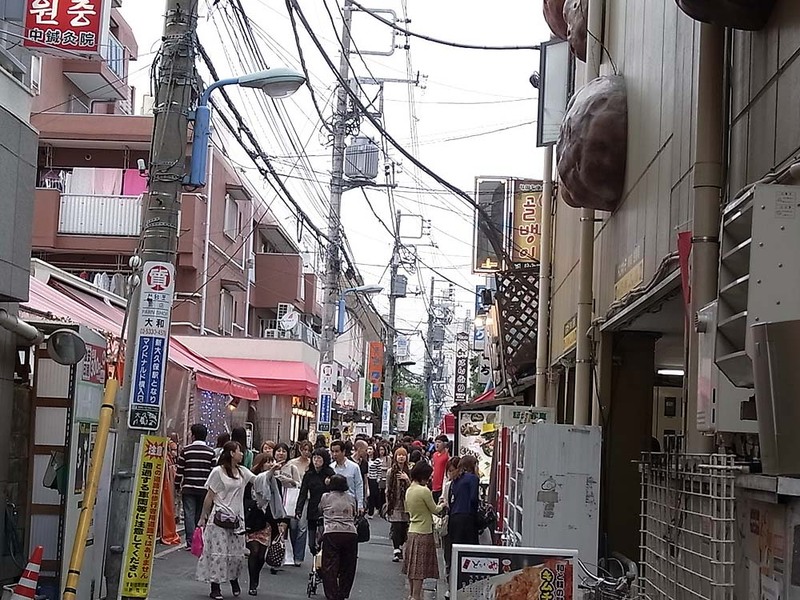 Takeshita Street is so narrow that it is always crowded with people. 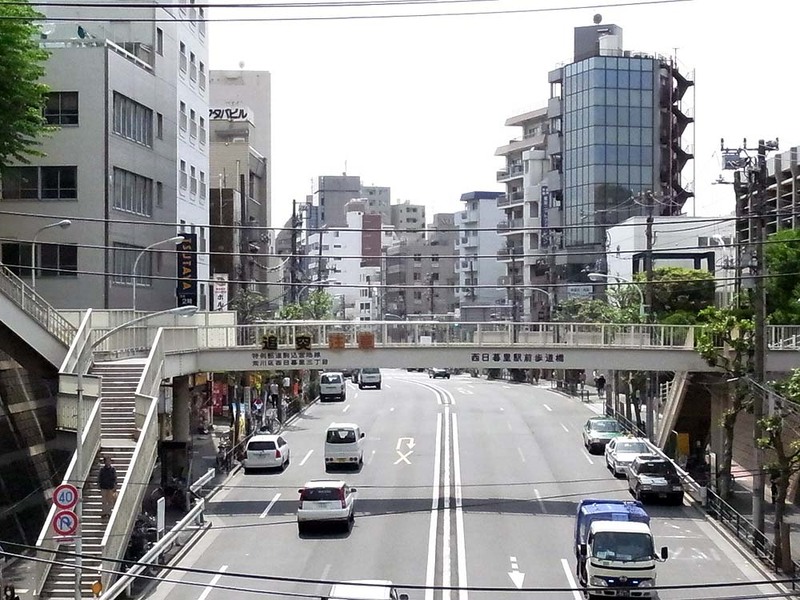 A landscape of the station, street, and buildings in Harajyuku from the view of the footbridge in fron of the station. 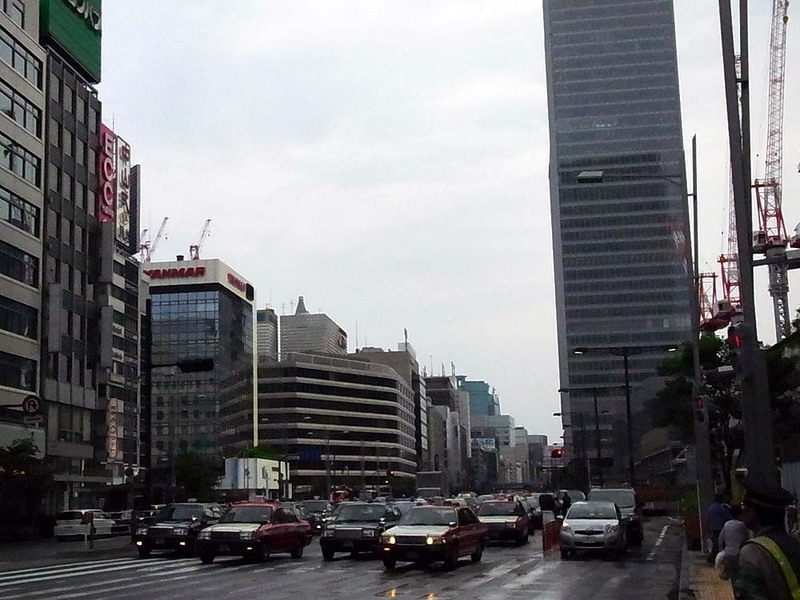 A large intersection near Harajyuku. 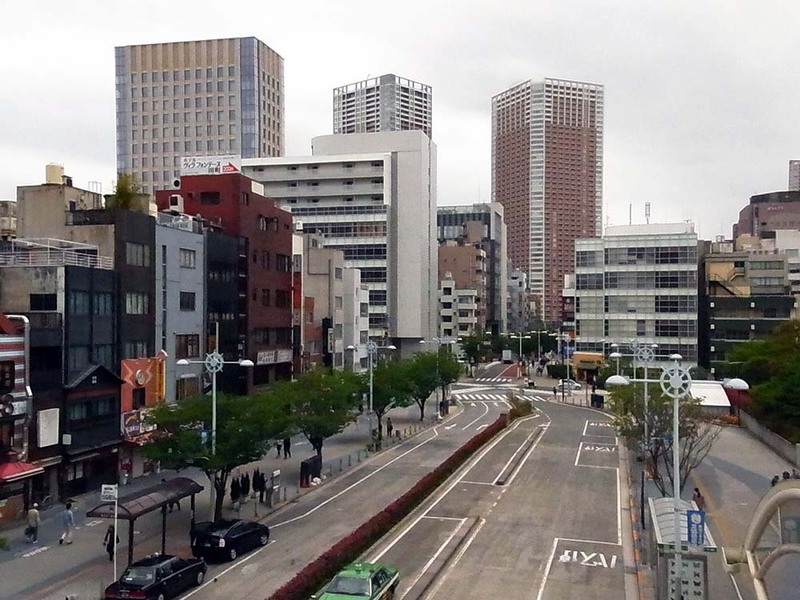 Here is a region where large fashion buildings are lined. 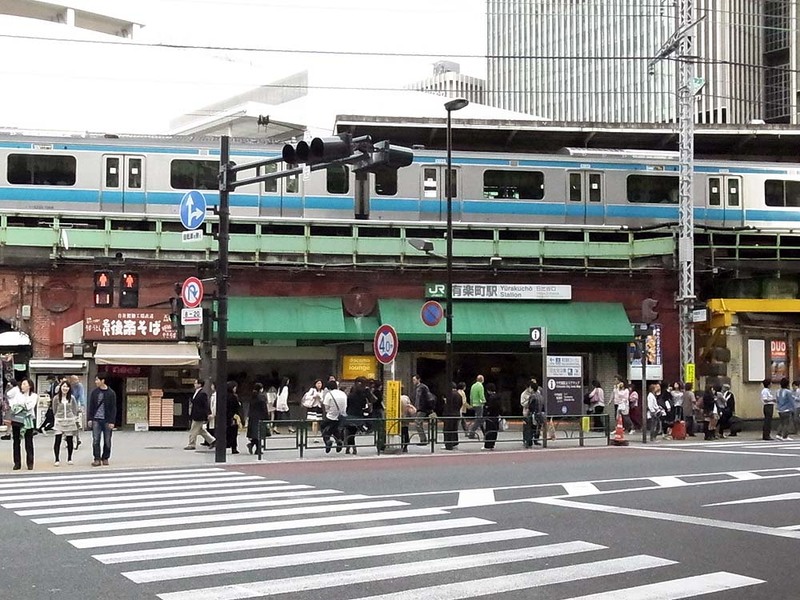 Appearance of Yoyogi Station. Its shape is unique. 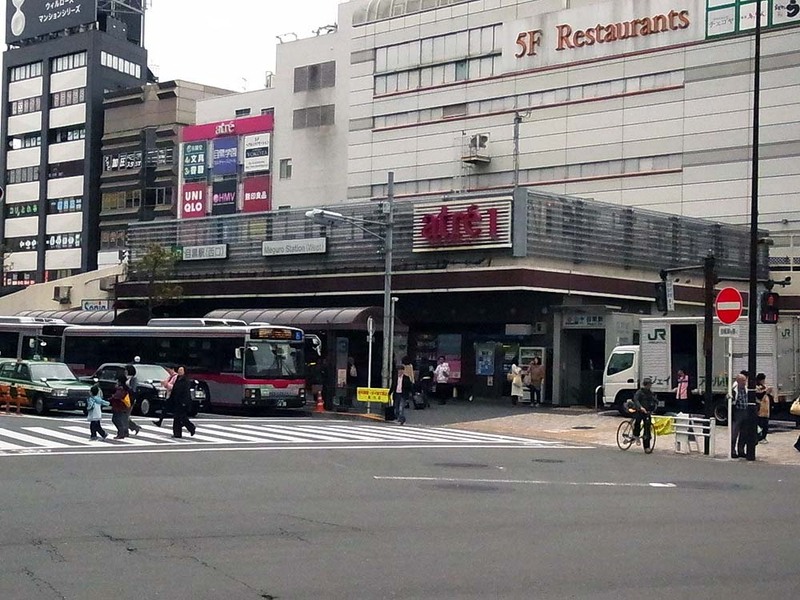 There is a scramble intersection that has five directions in front of the station. 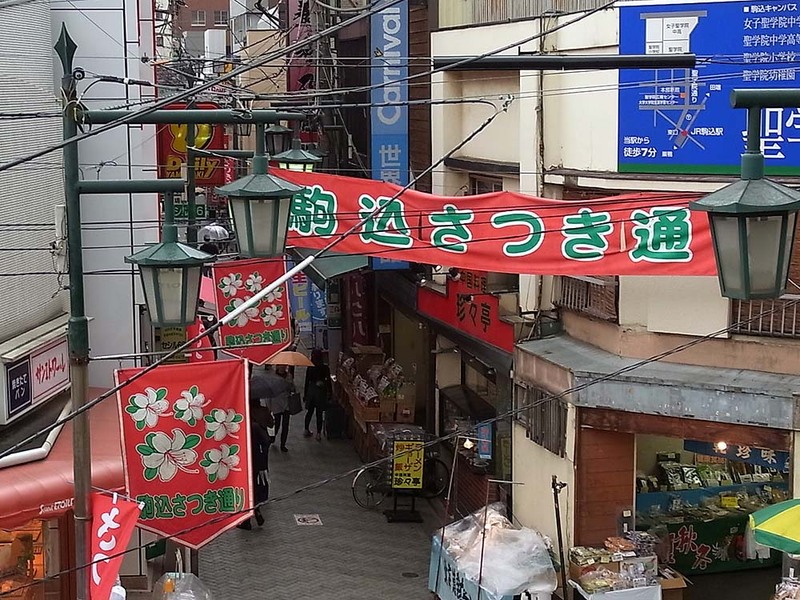 A small street near the station. 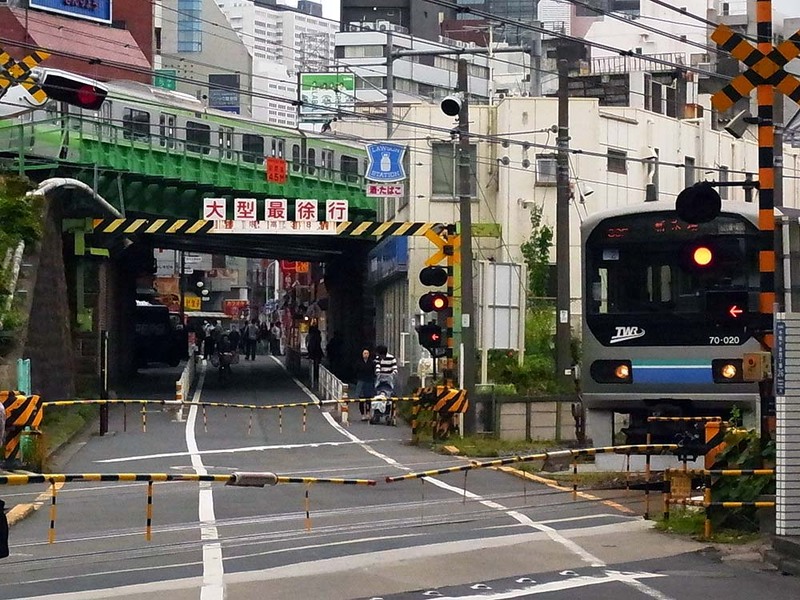 The railroad crossing in Yoyogi. 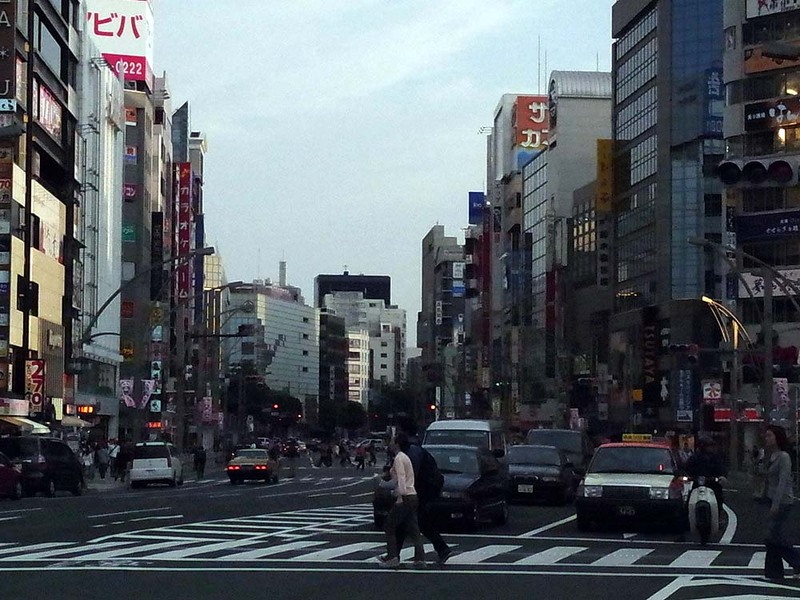 It is rare in the center of Tokyo. 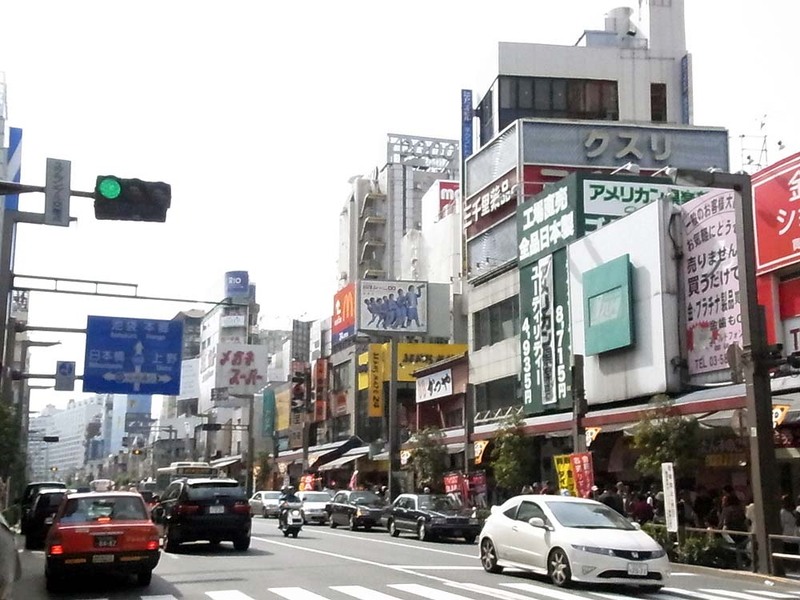 Yoyogi is next to Shinjuku, a large downtown area in Tokyo. 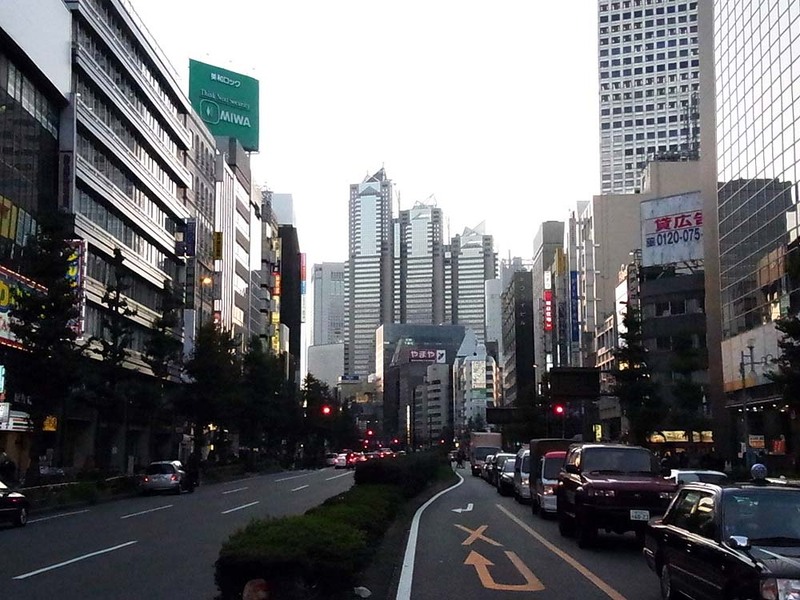 If you draw a little perspective, skyscrapers of Shinjuku is found in your view. 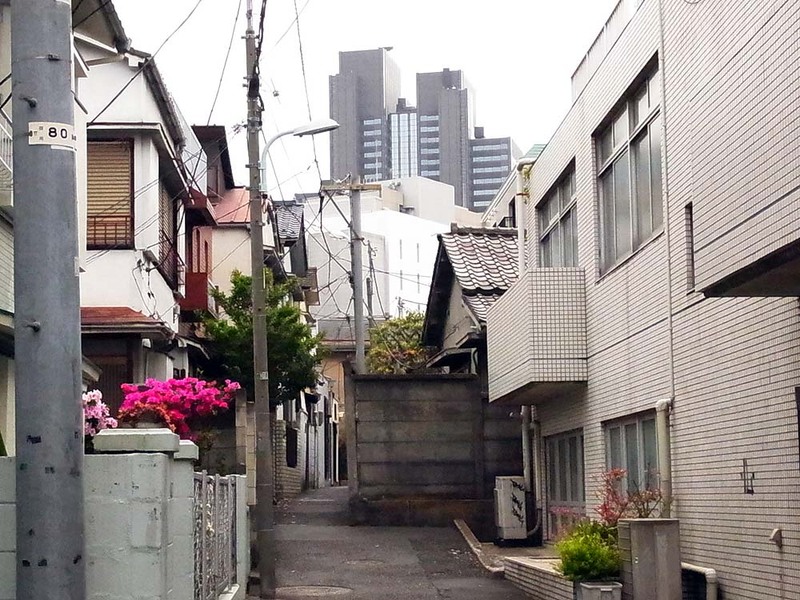 In a back alley in Yoyogi district. 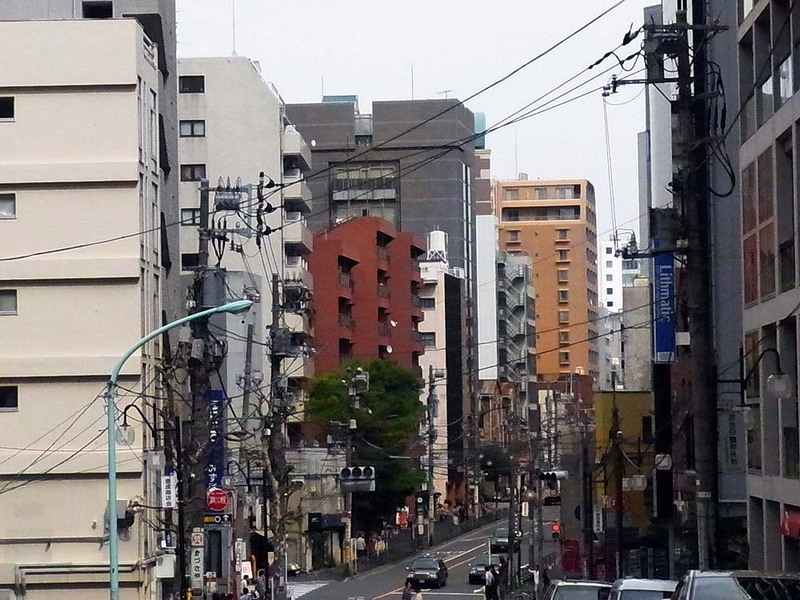 Narrow streets and old private houses are overlapped with Shinjuku skyscrapers. The combination is impressive. 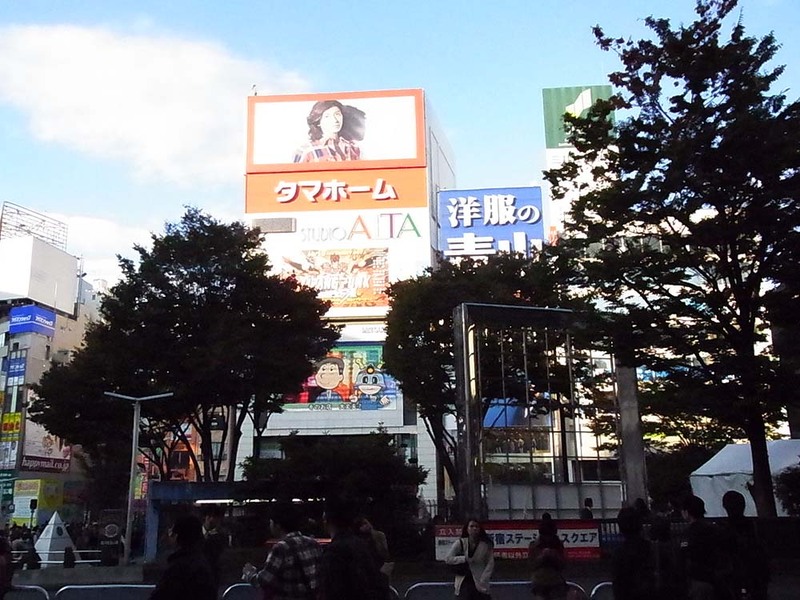 A scenery of the square in front of Shinjuku Station east exit. The main street in the east side of the station. 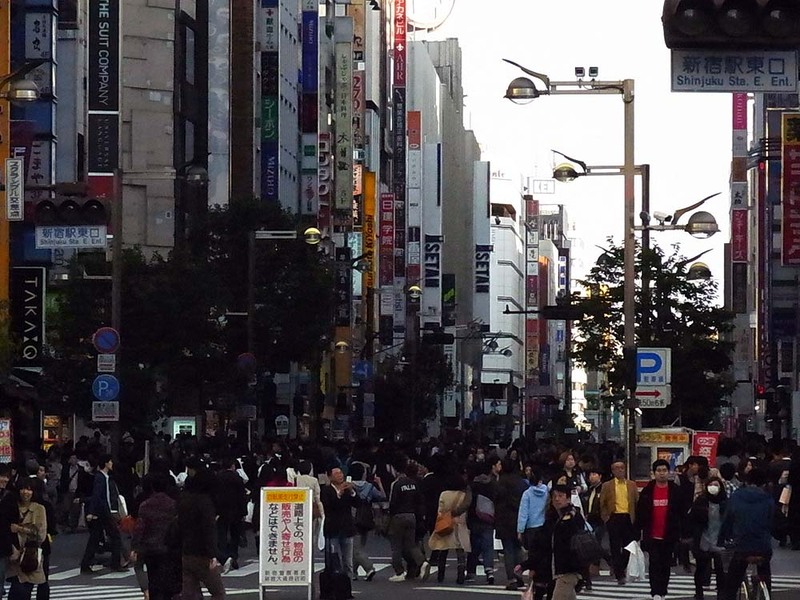 The street was a pedestrian paradise on the day. 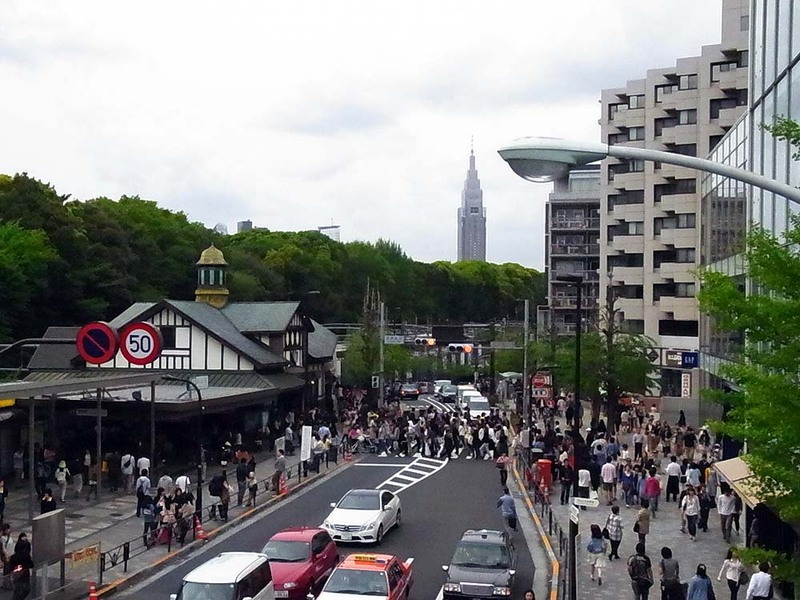 A busy street in the east side of the station. 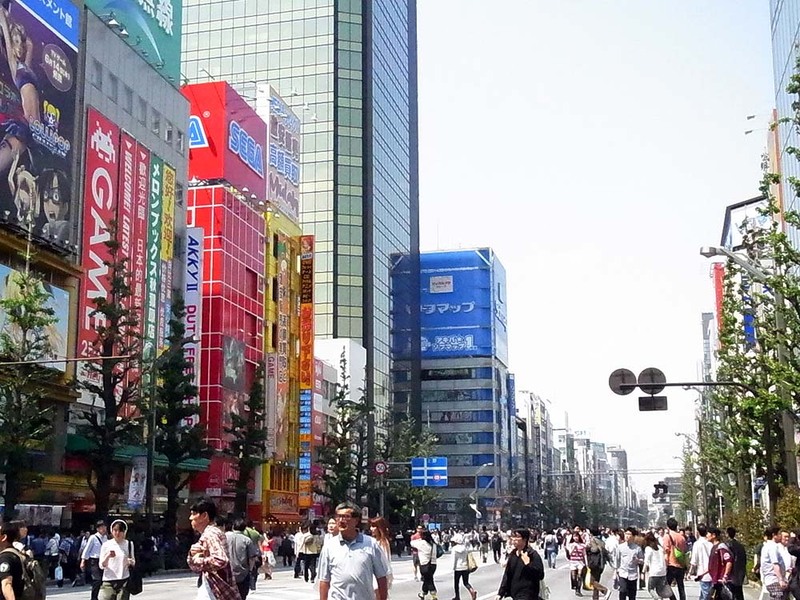 Multi-tenant buildings are lined up in Shinjyuku shopping district. 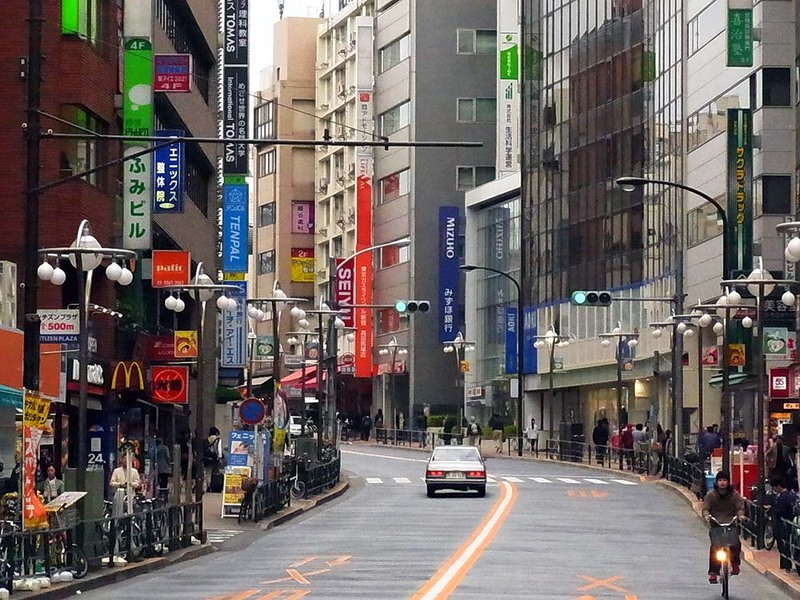 Kabuki-cho, an entertainment district in Shinjyuku. 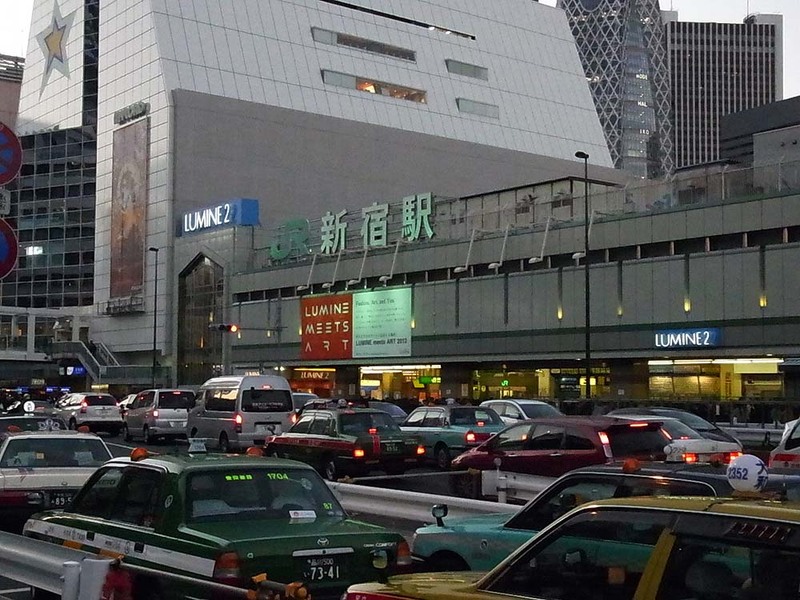 The west side of Shinjuku Station. 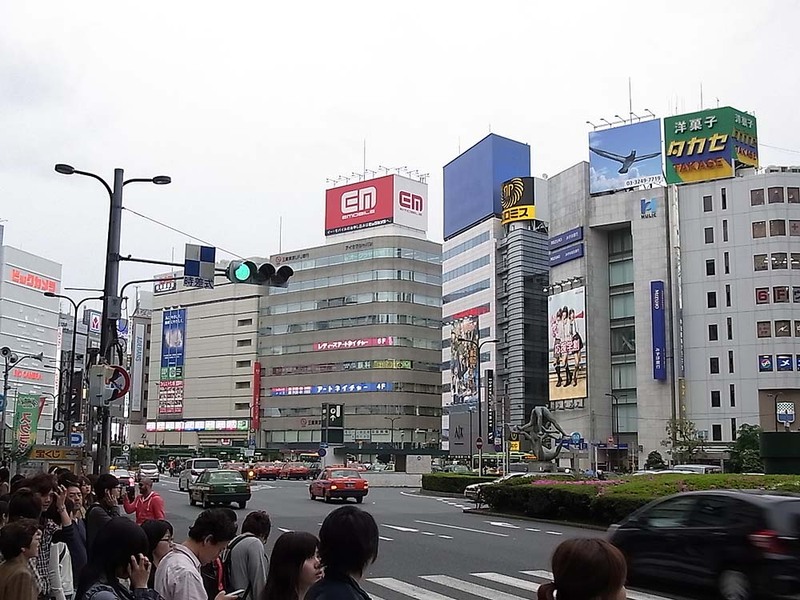 Large department stores stand here. The main street in the west side of the station. 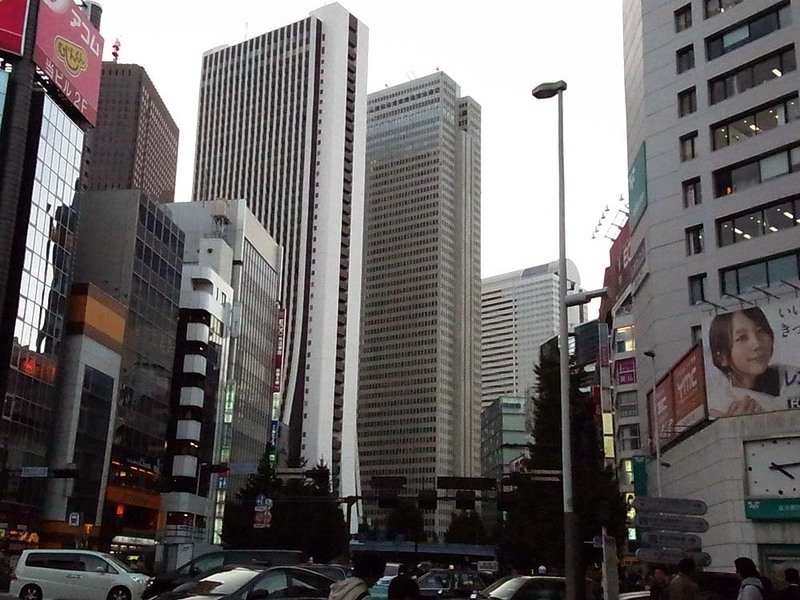 Unlike the east side, there are many office buildings. 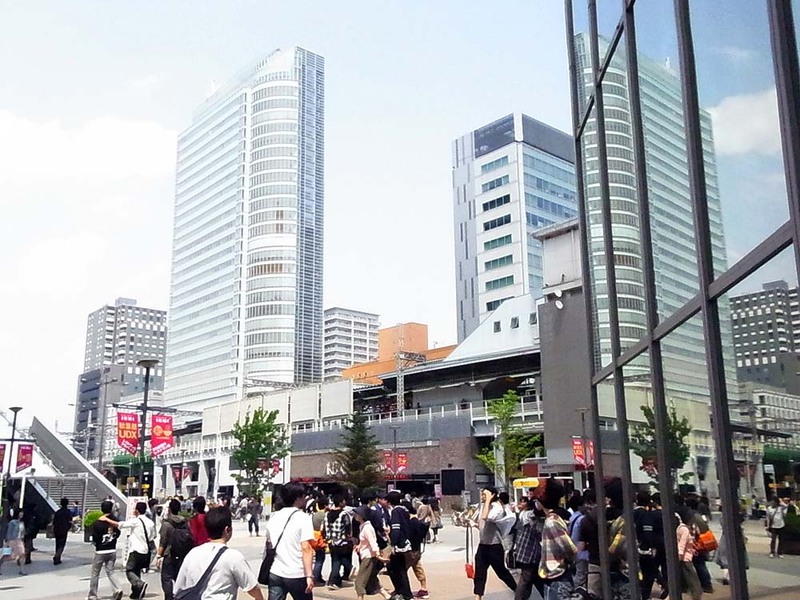 The west exit of the station is the gateway to Shinjyuku high-rise buildings. Old-fashioned bar district near the west exit. 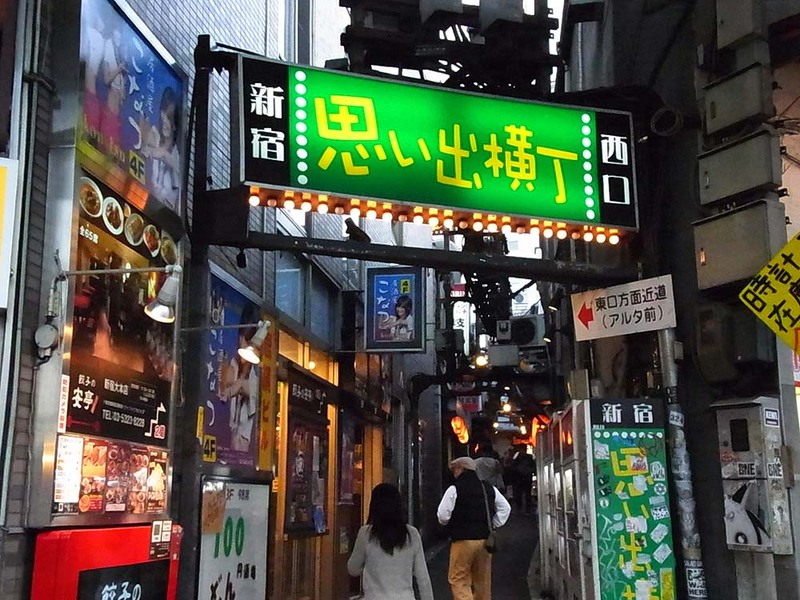 There are many small-sized bar in the narrow street. 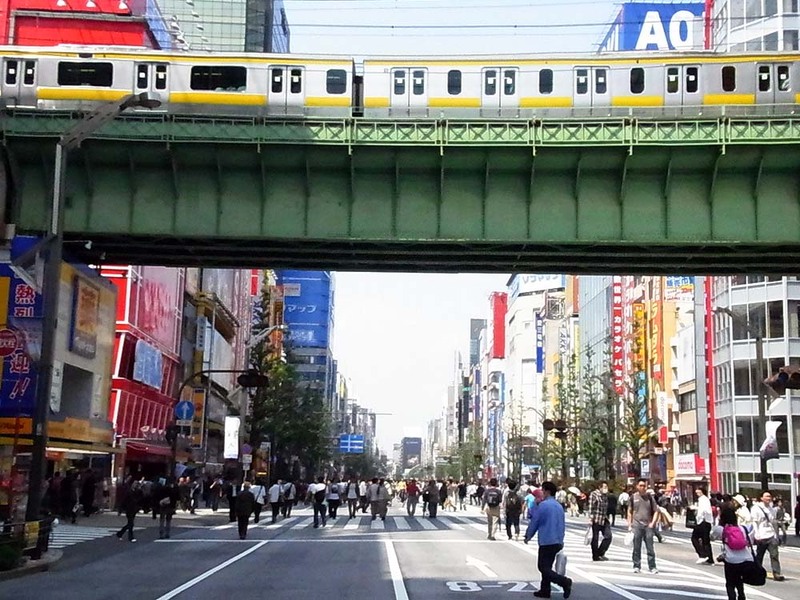 The south exit of Shinjuku Station. 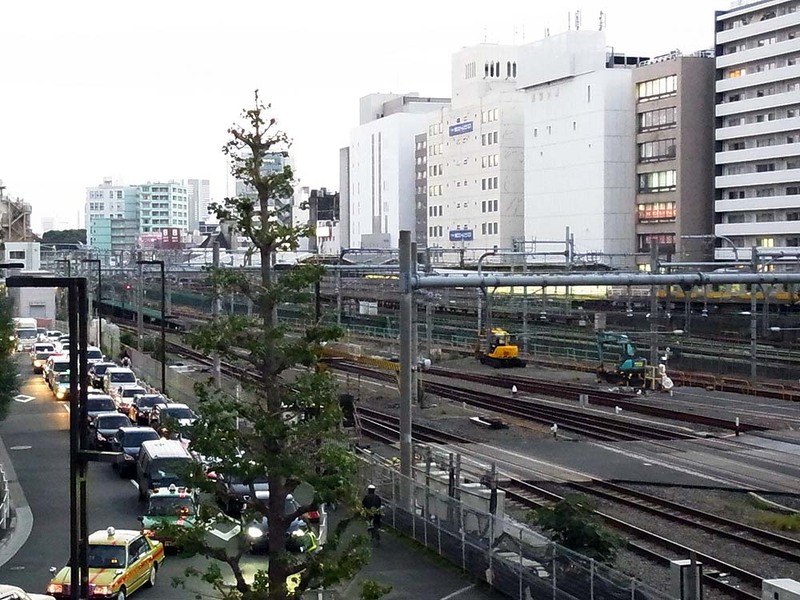 A landscape of the south side of Shinjuku Station. 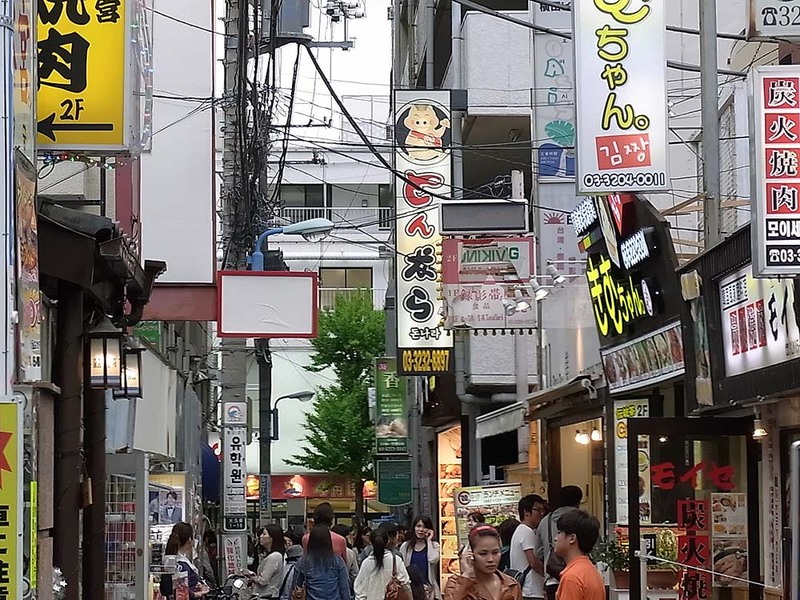 When you enter in one block from the main street in Shin-okubo, you find old apartments and houses on the both sides of the narrow street. 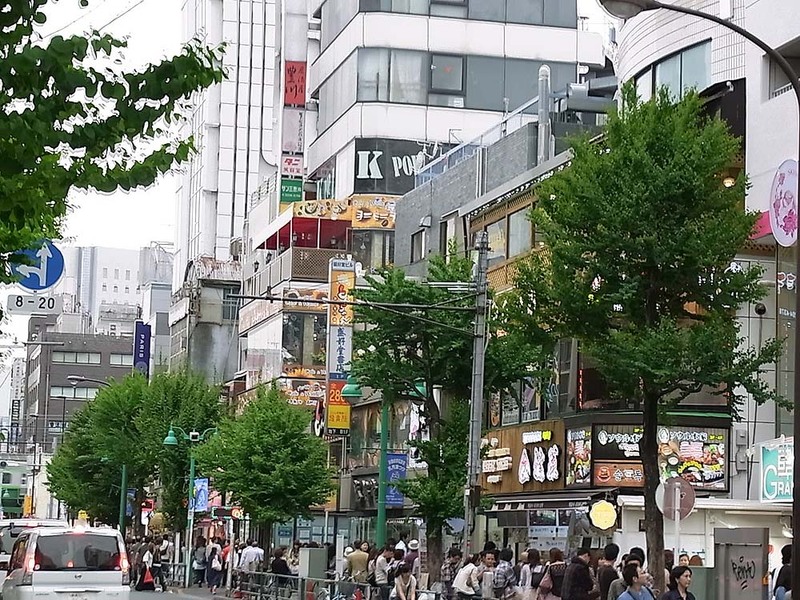 There is a region where many Korean shops and restaurants are lined along narrow streets. 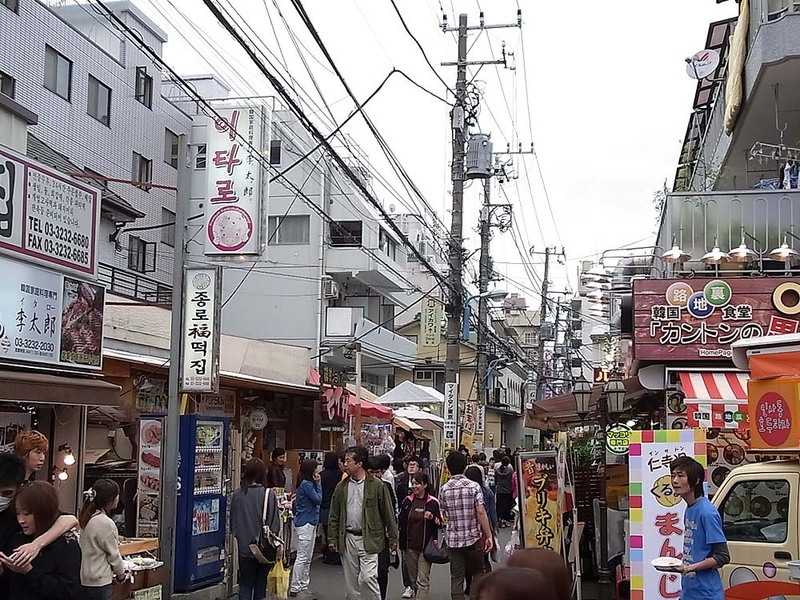 Korean shops and restaurants are in narrow back streets. 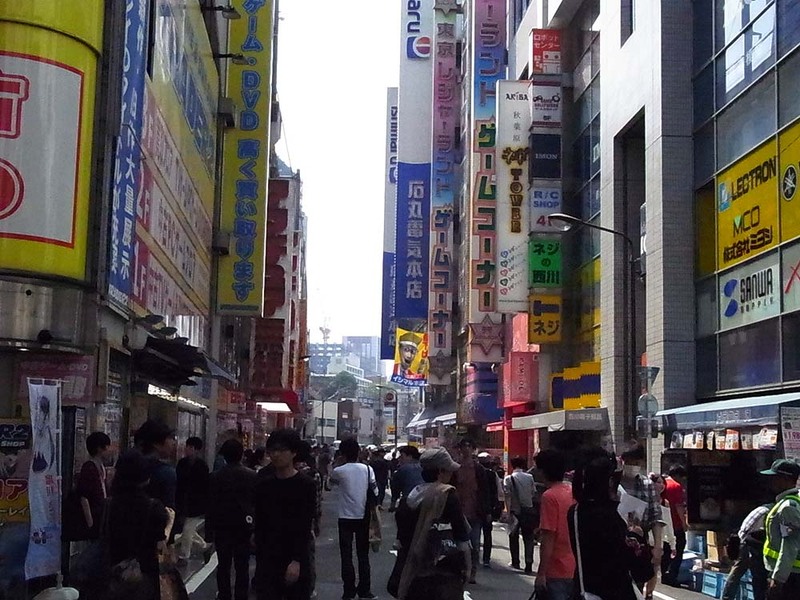 A scenery of the main street in Shin-okubo. 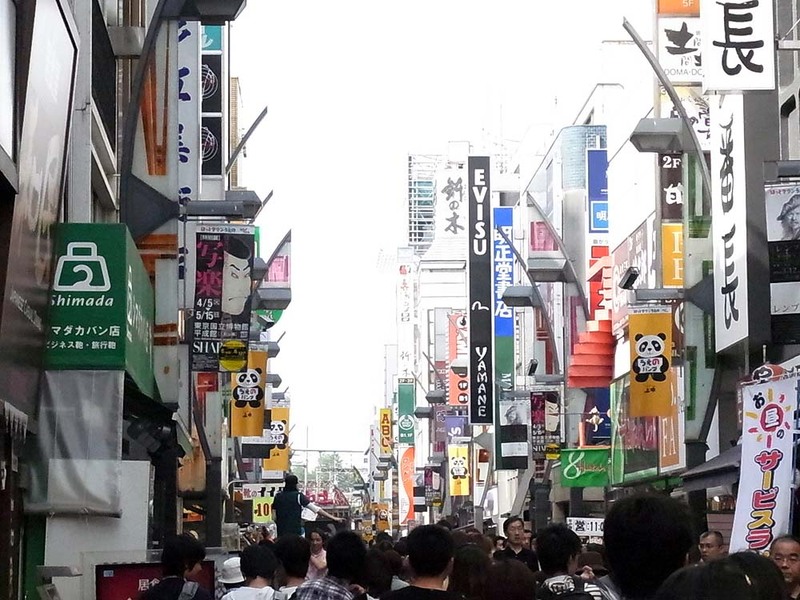 A scenery of the main street in Shin-okubo. 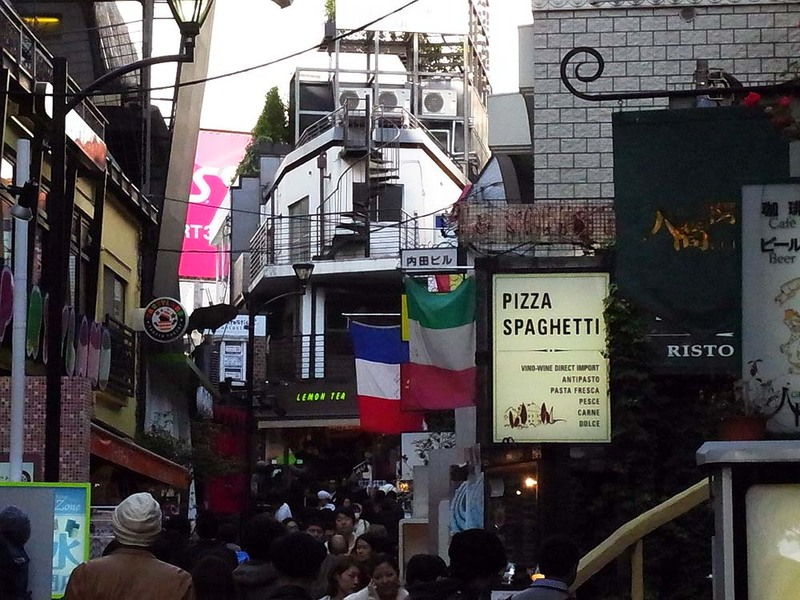 Narrow sidewalks are full of shoppers for Korean food and specialties. 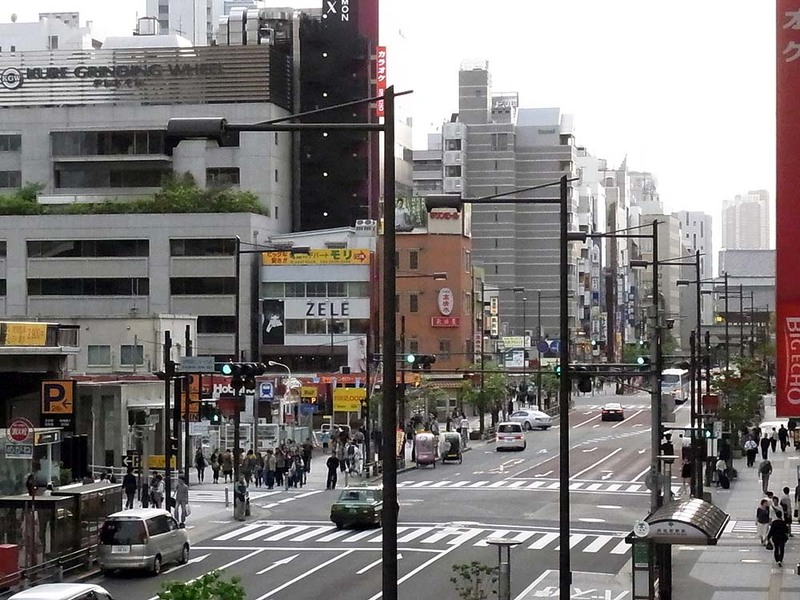 Overlooking the main street from the platform of Shin-okubo Station. 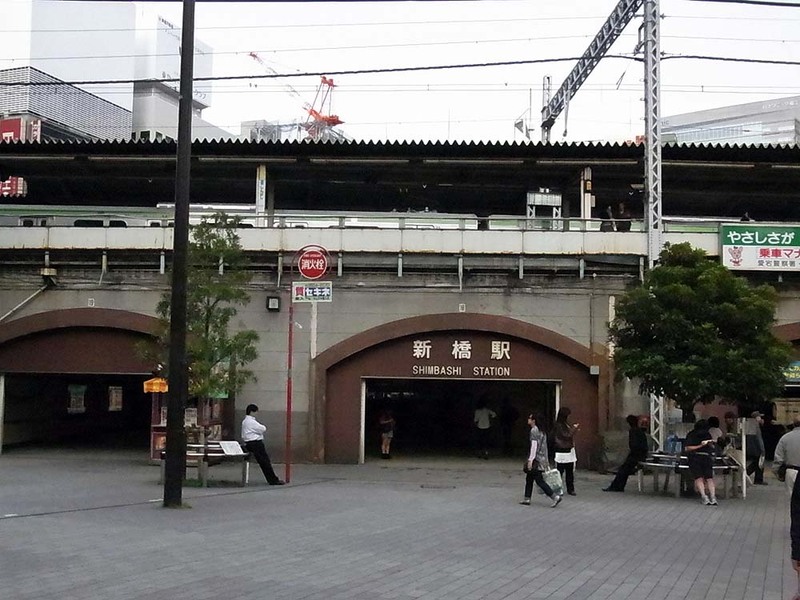 The enterance of Takadanobaba Station. 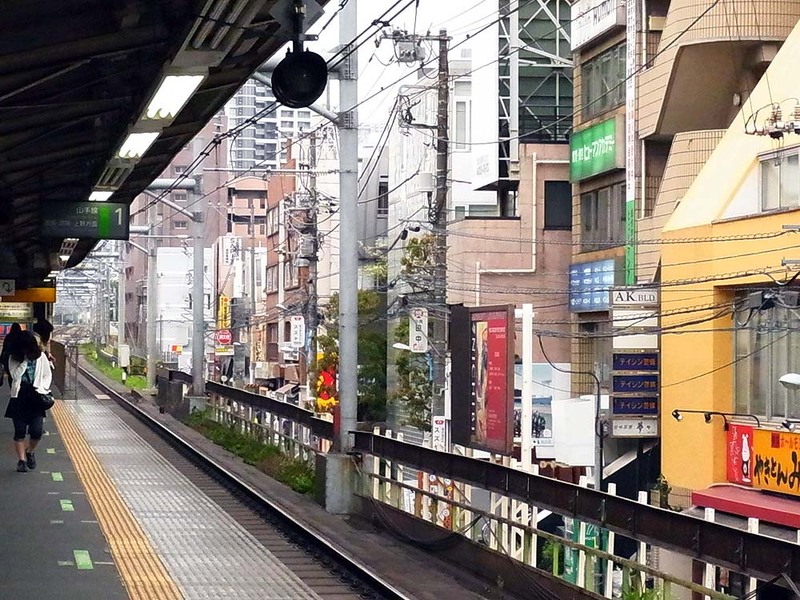 The platform of Takadanobaba Station. 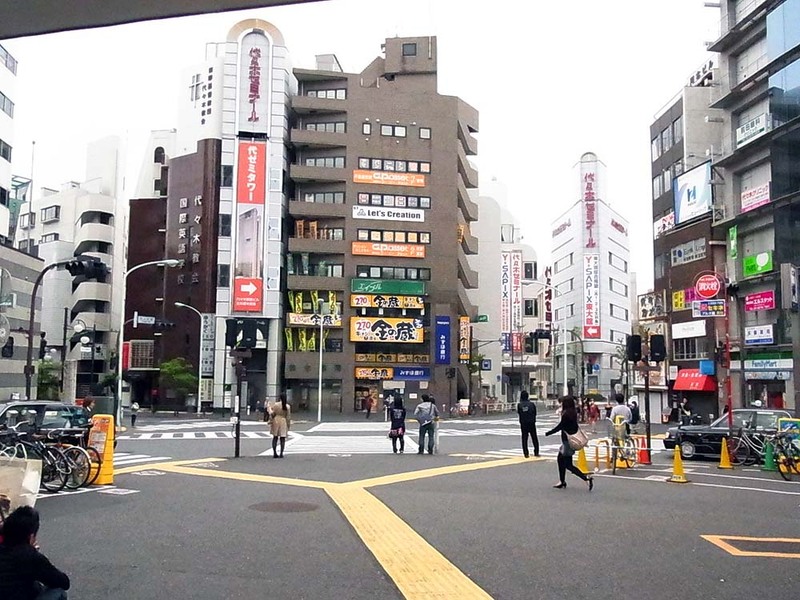 The main intersection in front of Takadanobaba Staion. 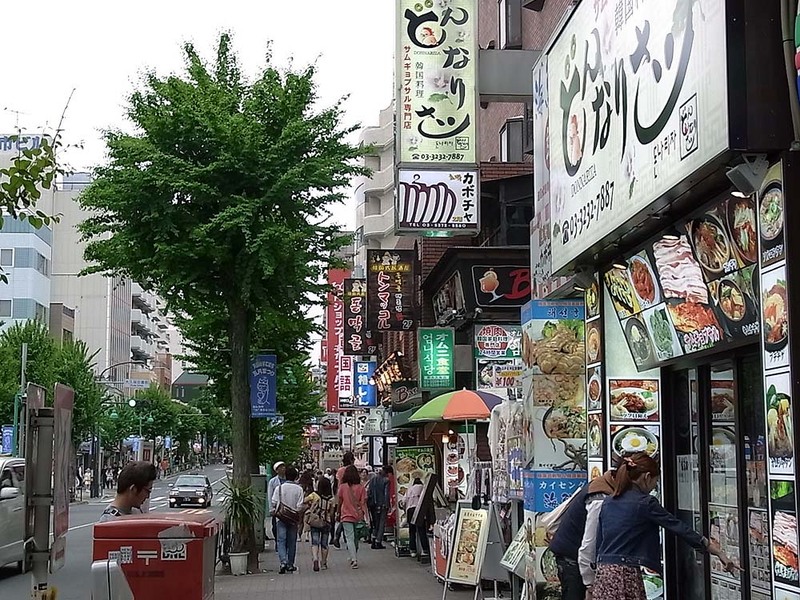 A scenery of the main street in the east side of the station. The entrance of the shopping district in the west side of the station. 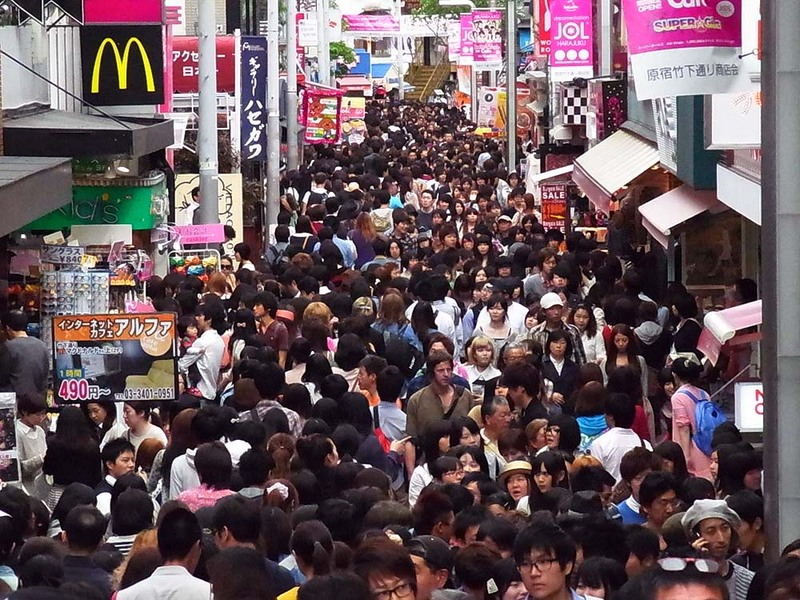 The narrow shopping street is full of people. 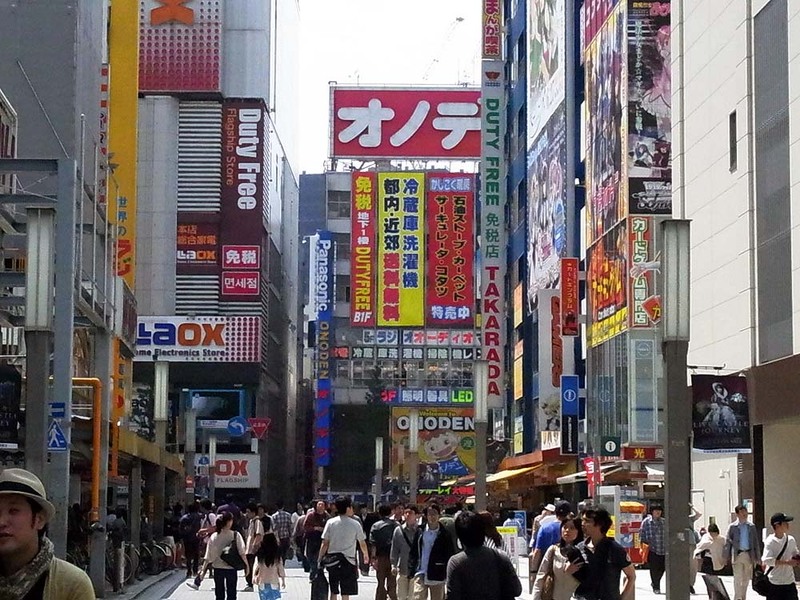 Since the heights of the buildings are aligned, the signboards are in harmony. 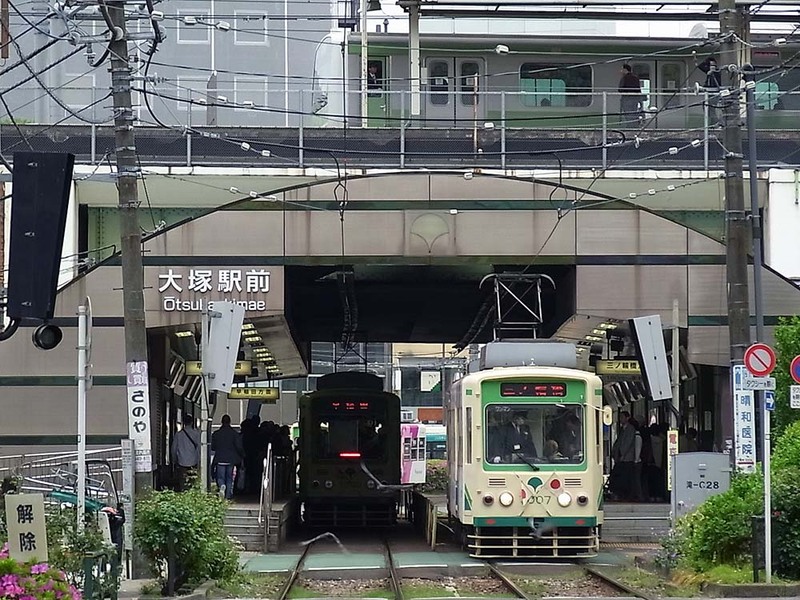 Mejiro Station. The shape of the roof and the window frame is characteristic. The railroad seen from the main street in front of the station. Utility poles appear to overlap far. 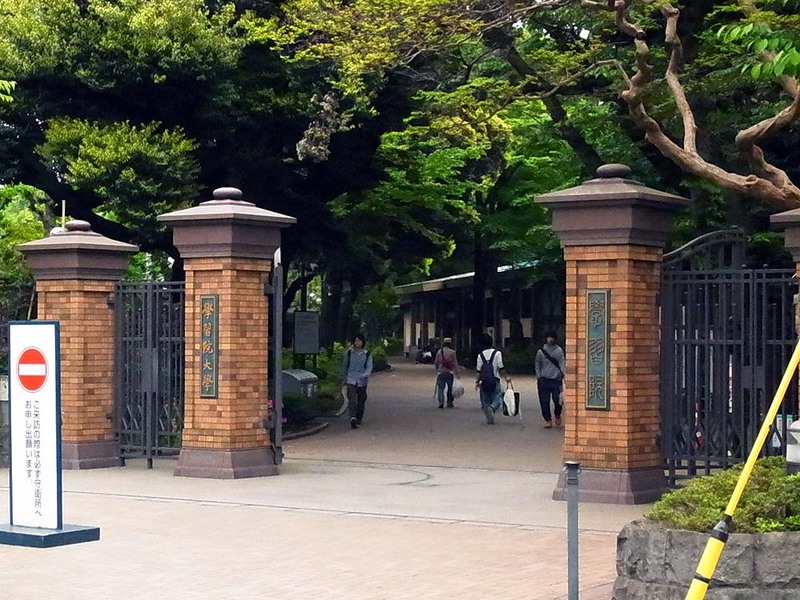 The entrance of Gakushuin University. 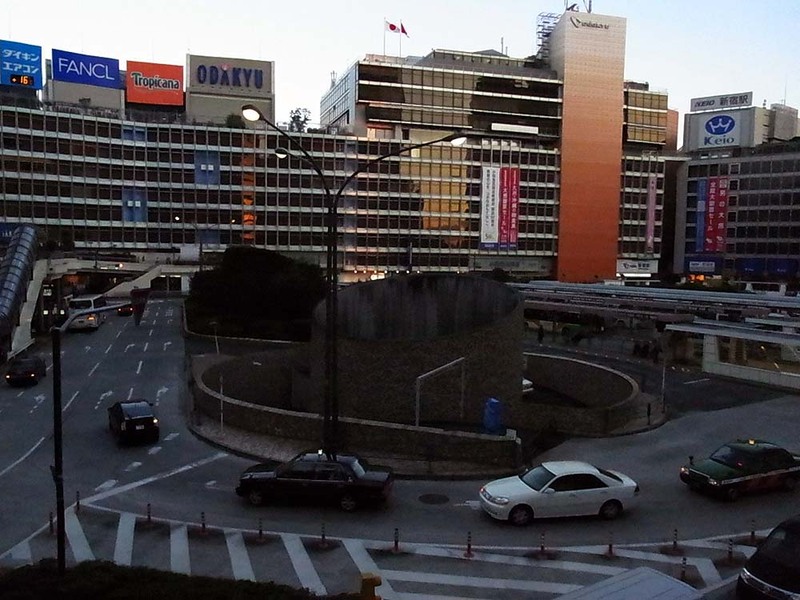 The campus is located in front of the station. 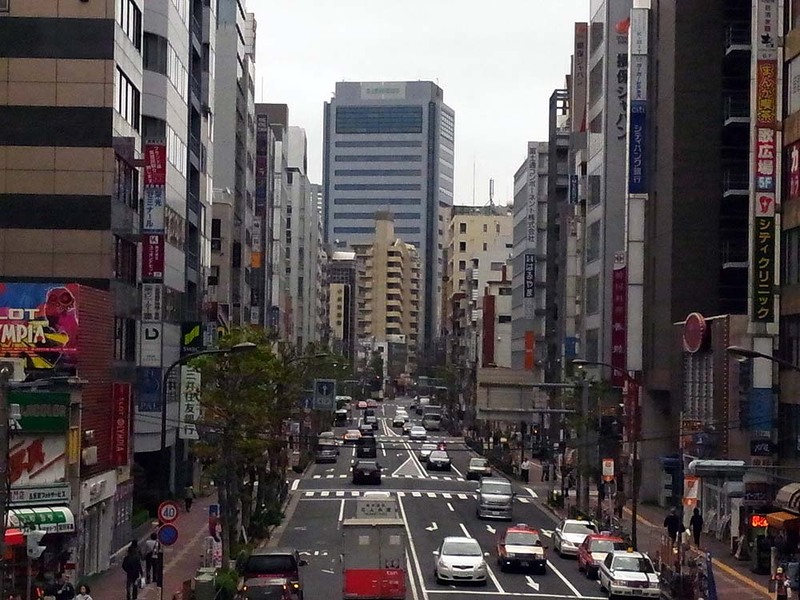 A small street near the station. 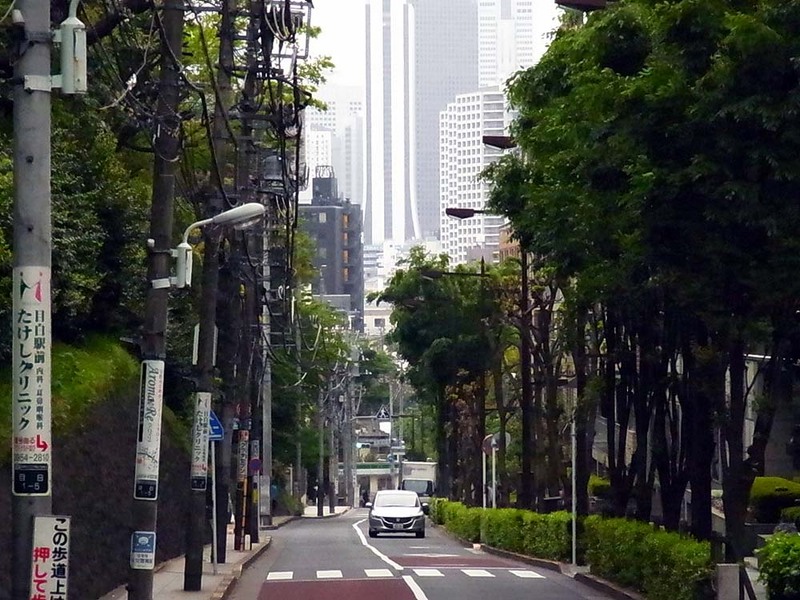 You can see Shinjuku high-rise buildings far away. 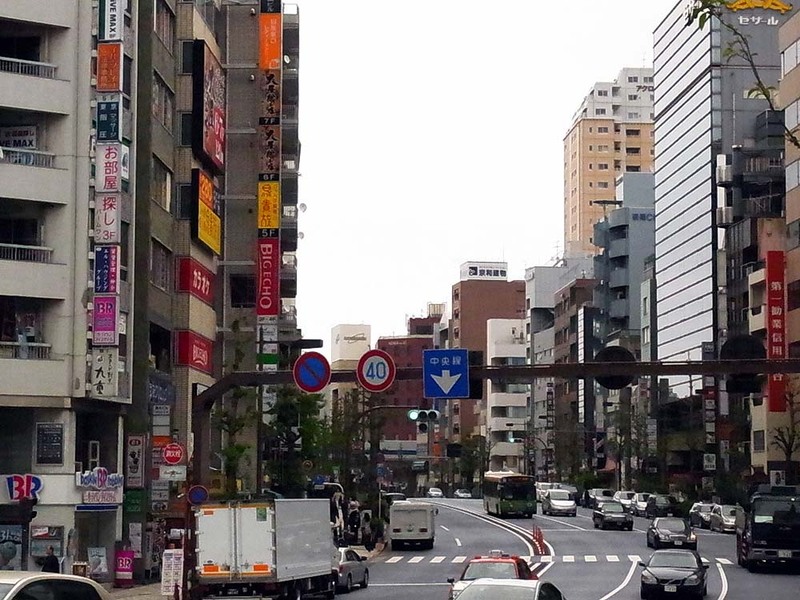 A scenery of the area just west of Mejiro Station. 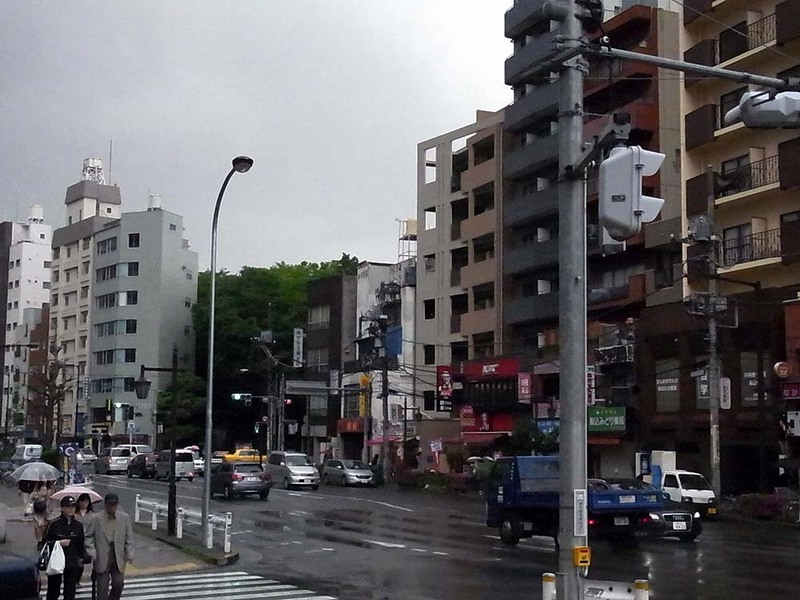 It is a quiet residential area. 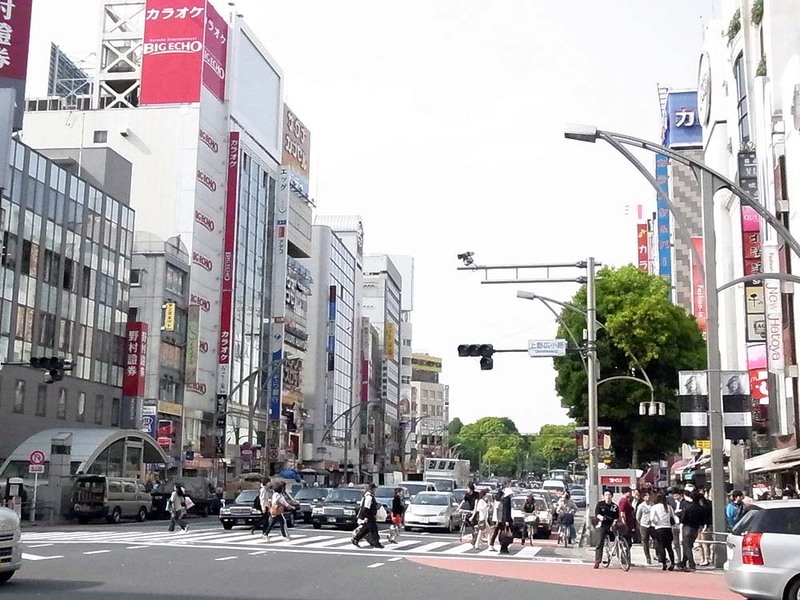 The main intersection in front of Ikebukuro Station. The space is very large, so the visibility is open. 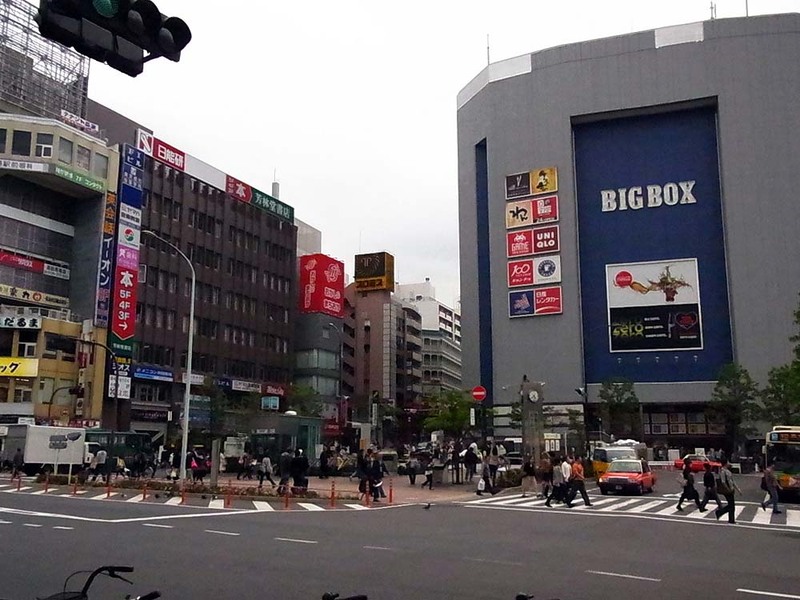 Also, the main intersection in front of the station. 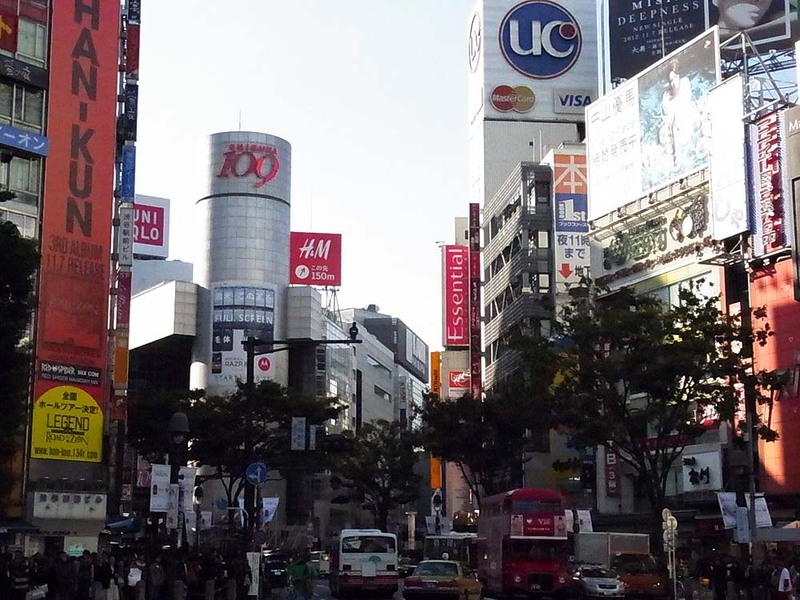 There is a very large department store in the left side. 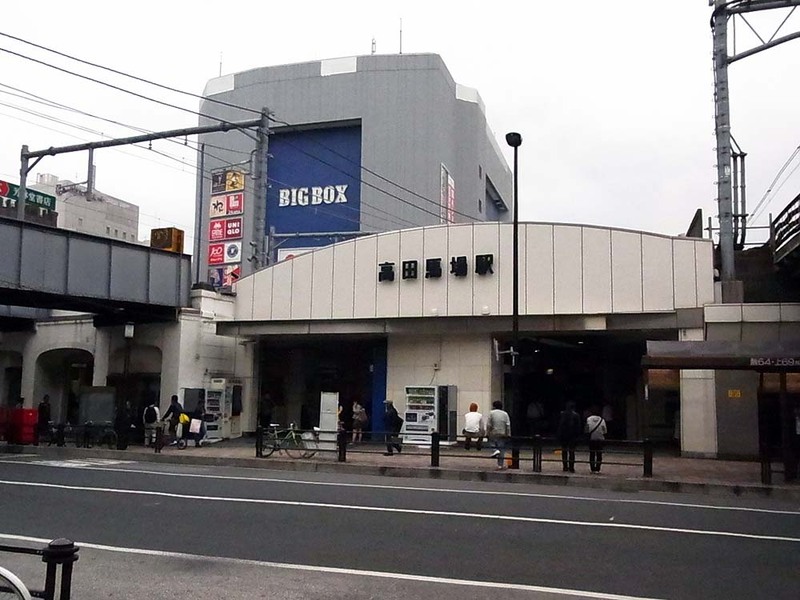 The east exit of Ikebukuro Station. 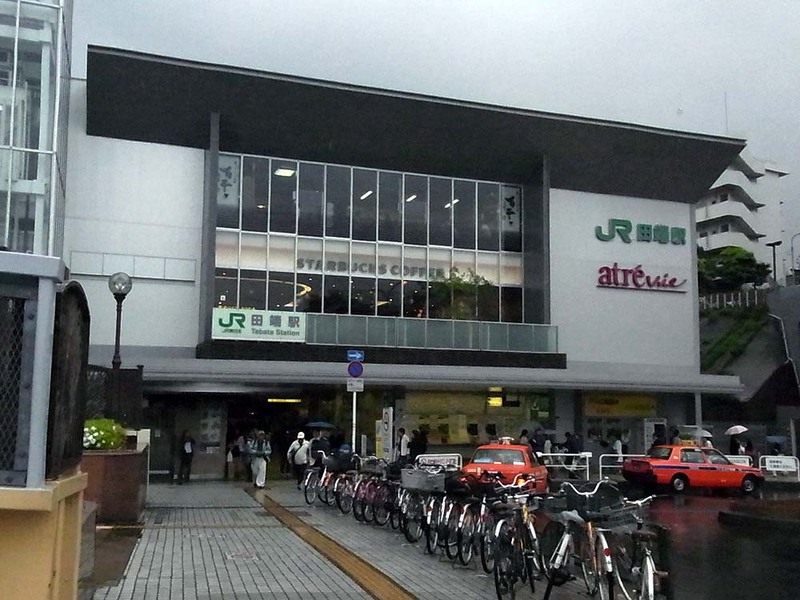 The station building is a department store. 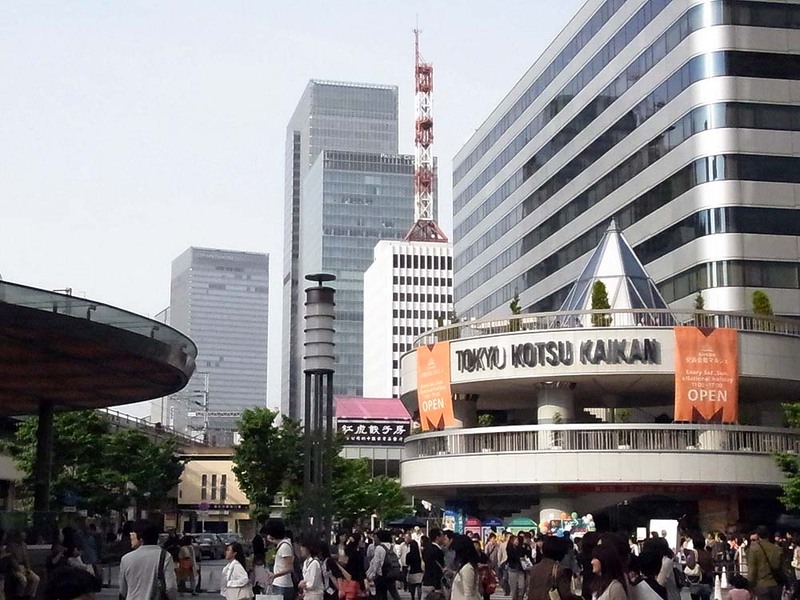 A scenery of the west side of Ikebukuro Station. The boulevard across the front of the station. Many apartments are lined. 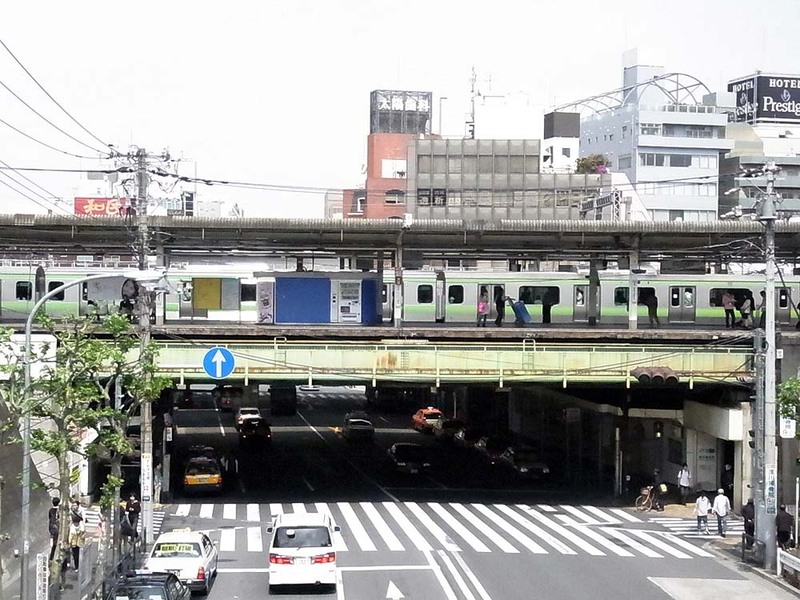 There is a tram station under Otsuka Station platform. 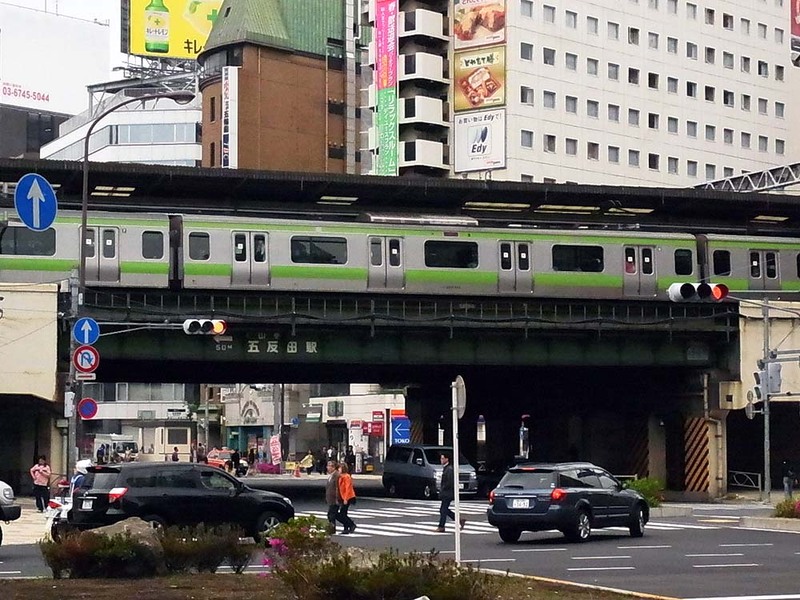 It intersects at a right angle to Yamanote-line. The streetcar looks a classic appearance. 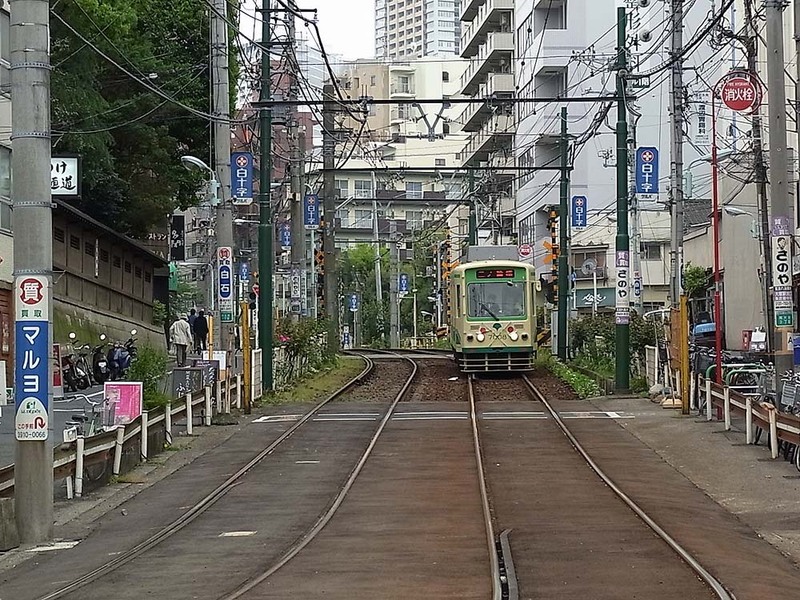 The tram running downhill toward Otsuka Station. 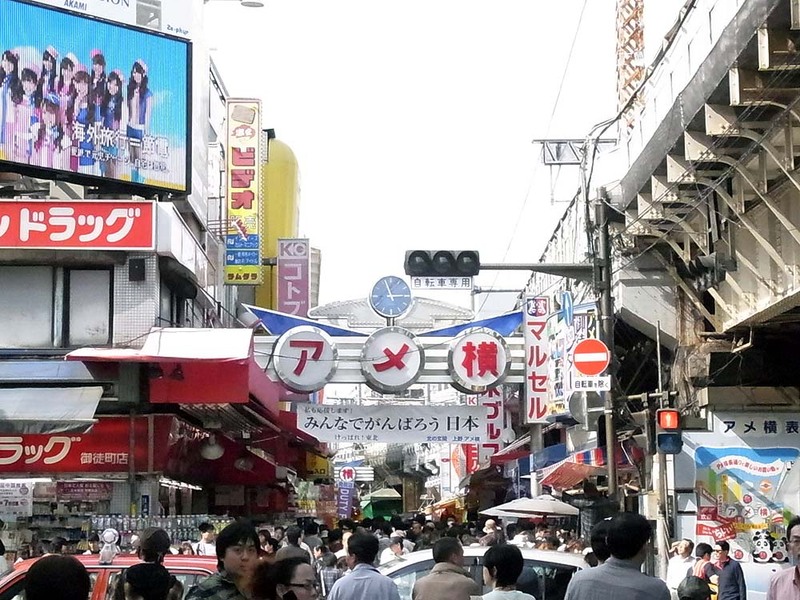 The shopping district along the main street across Sugamo Station. The arcade has solar cells. 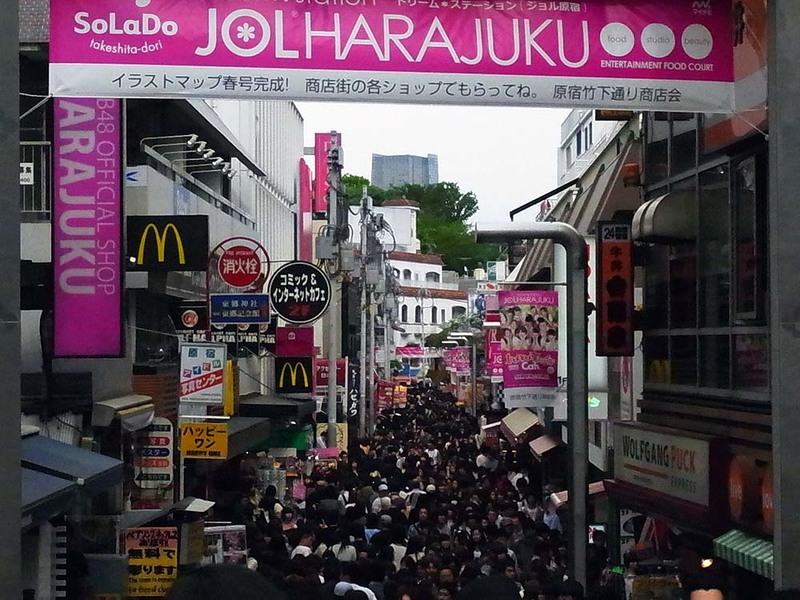 There are huge people walking for shopping in Sugamo Jizo street mall. 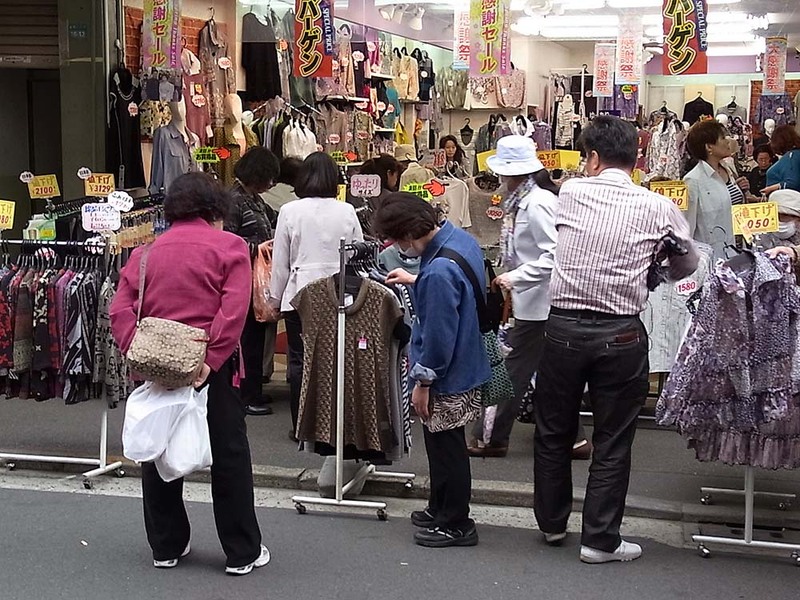 Clothing, footwear, household goods, sweets, and the like are sold in the mall, mainly for the elderly. There is a temple in the middle of the mall. 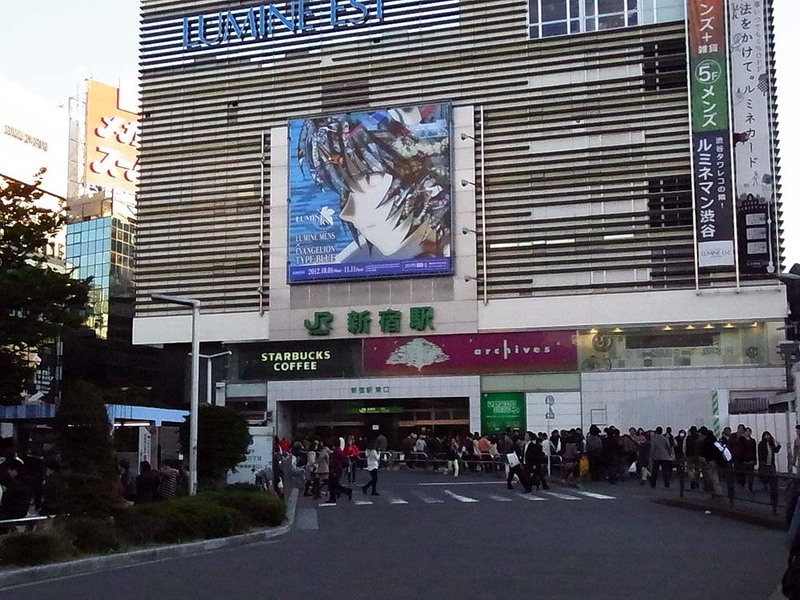 A scene in front of a shop in the mall. 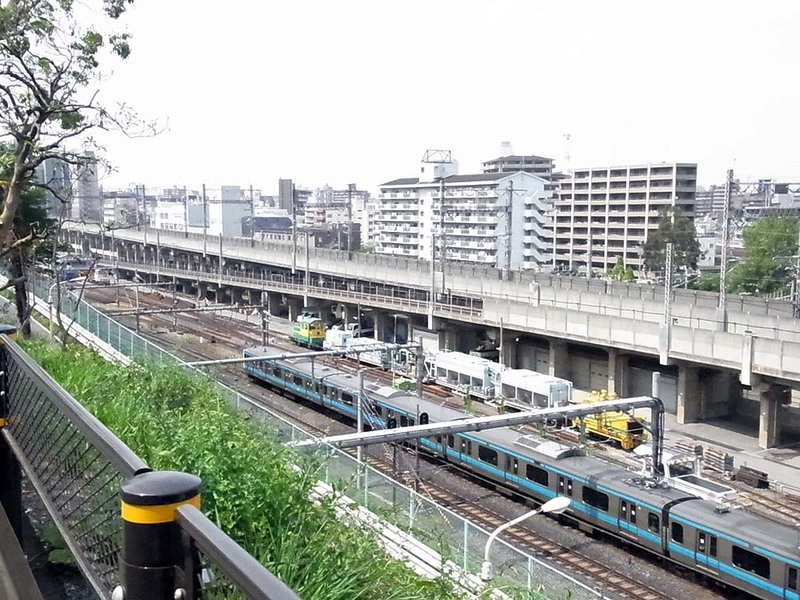 A landscape seen from Komagome Station building. 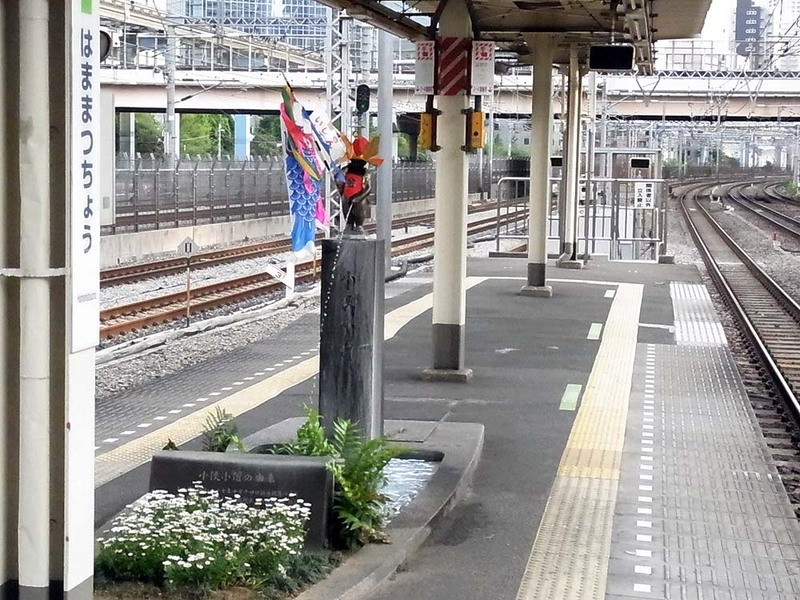 The opposite side of the platform is a flower bed. 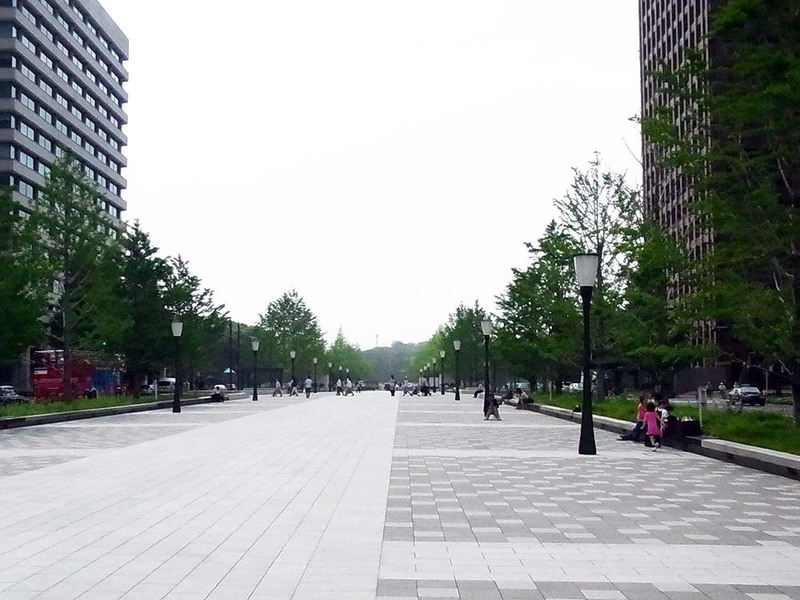 The boulevard in front of the station. Many apartments are lined along the boulevard. 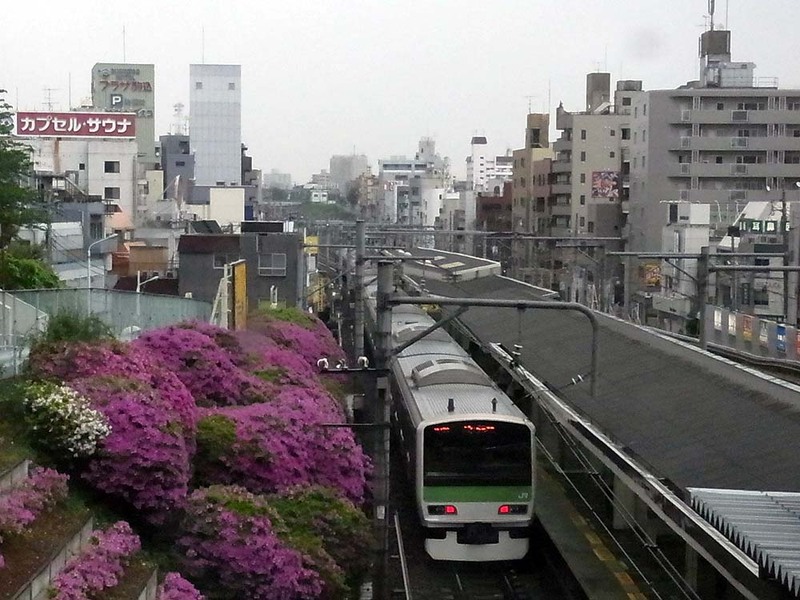 Rikugien Garden, Japanese style garden, is near the station. It is specified as a special place of scenic beauty. 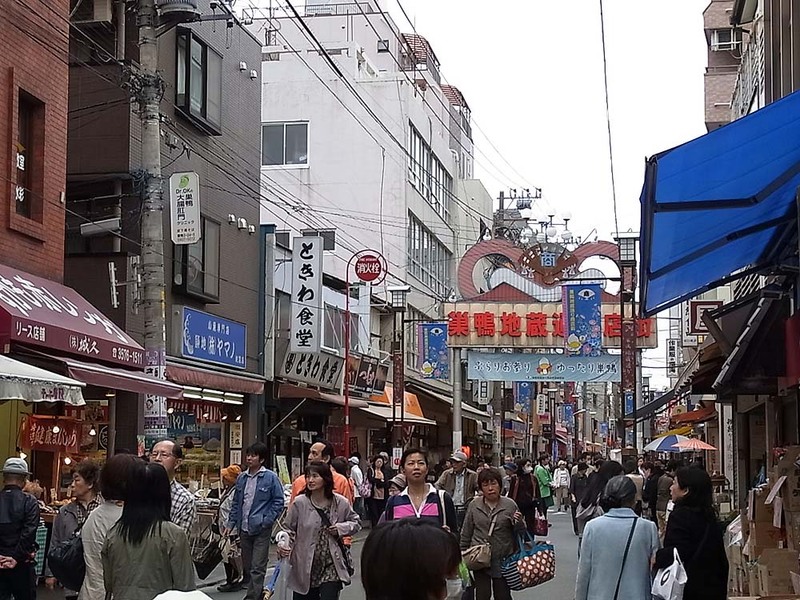 A shopping district with narrow streets in front of the station. 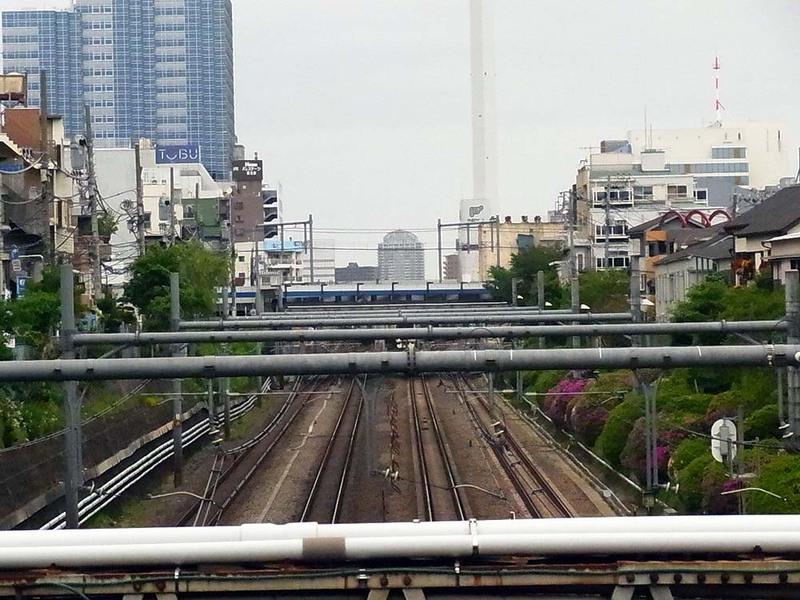 Seeing the east side from the station platform, we find a lot of train lines ahead. 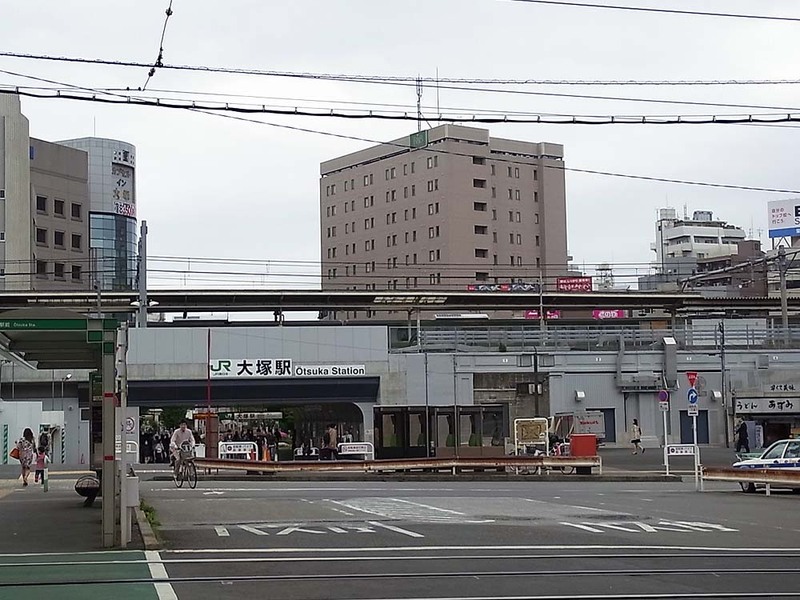 Nishi-nippori Station seen from the west side of the station. The west side is a hill. The west side seen from the station platform. Apartments are lined up along the street. Shops in front of the station. 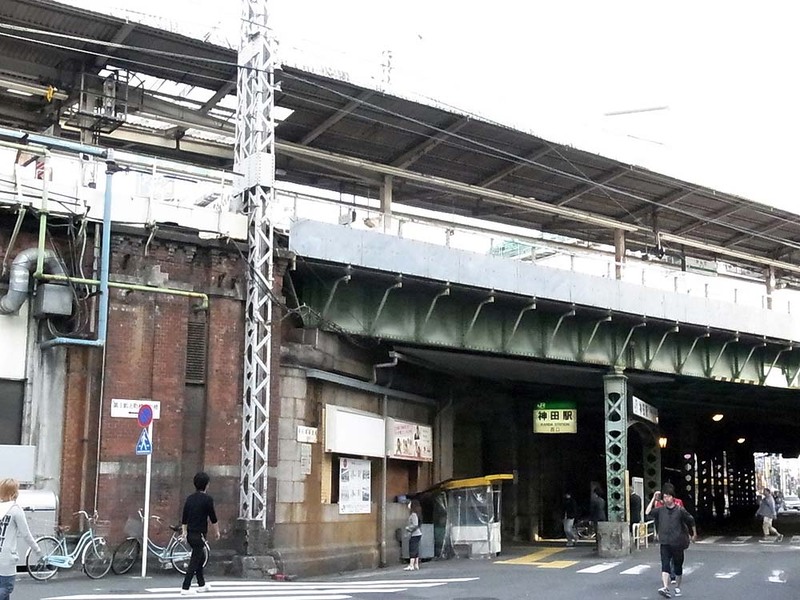 An overhead crossing of railway lines above the street in the east side of the station. A view from the hill in the west side of the station. 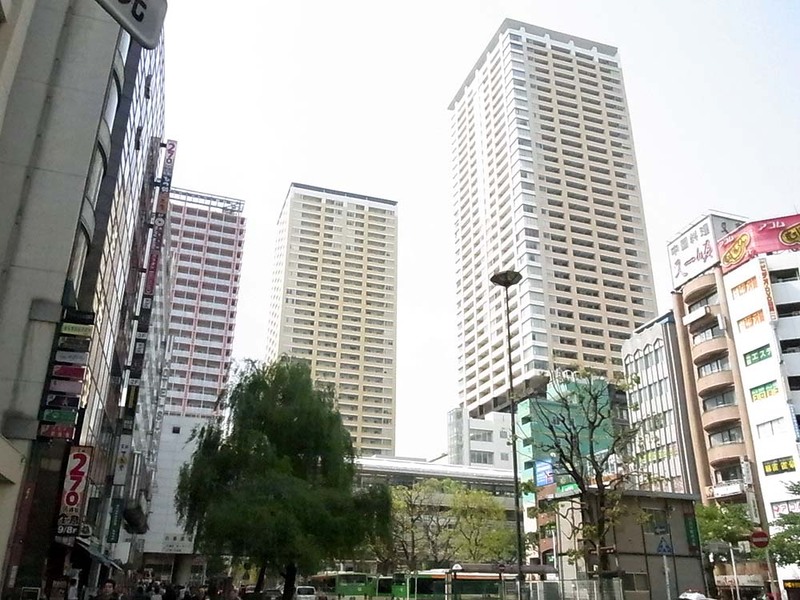 High-rise apartments to look up from the square in front of the station. 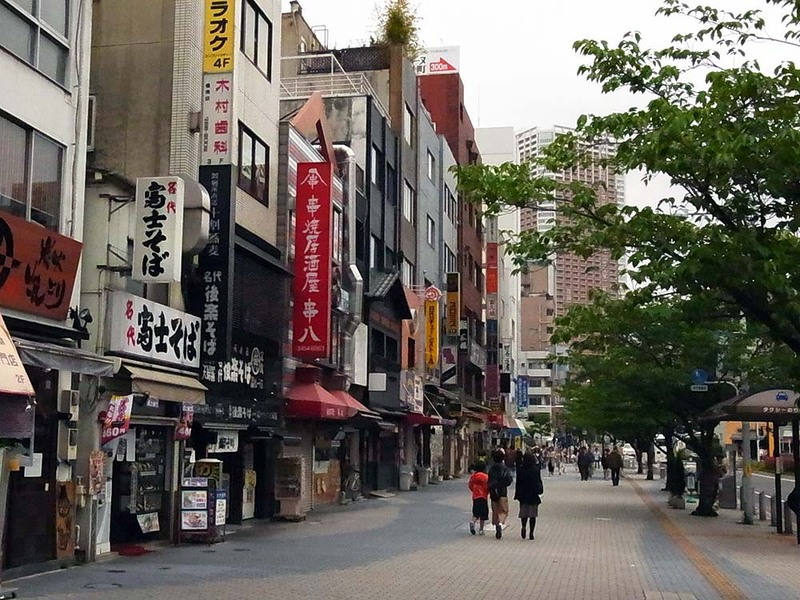 There is a shopping district that is old-fashioned on the downhill west of the station. 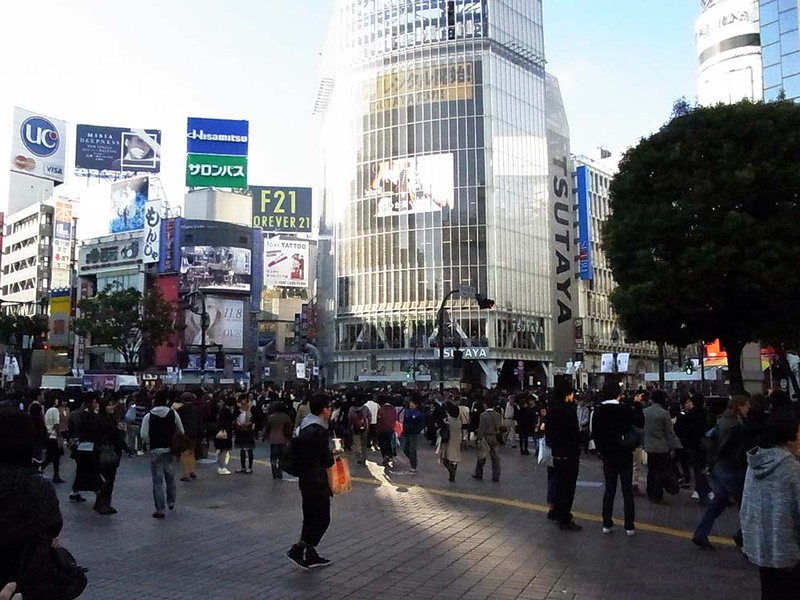 It is crowded with shoppers. 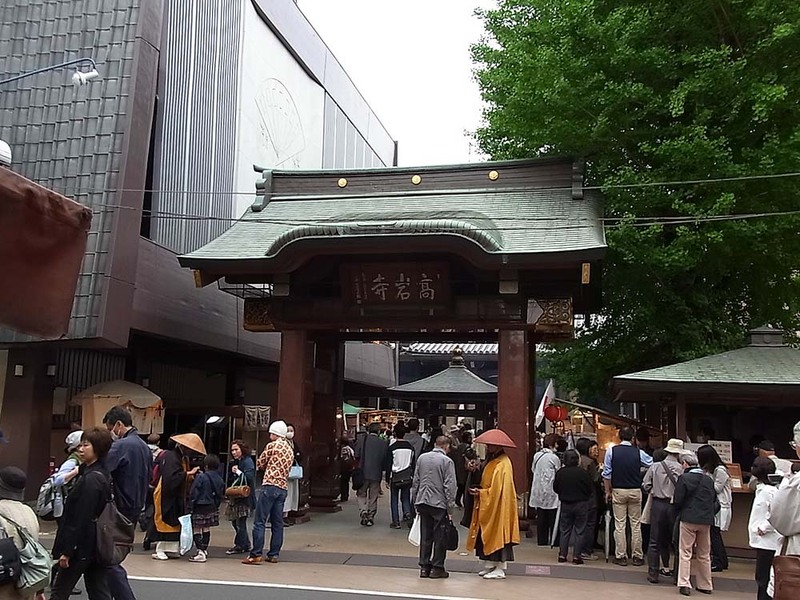 A temple stands near the shopping district. 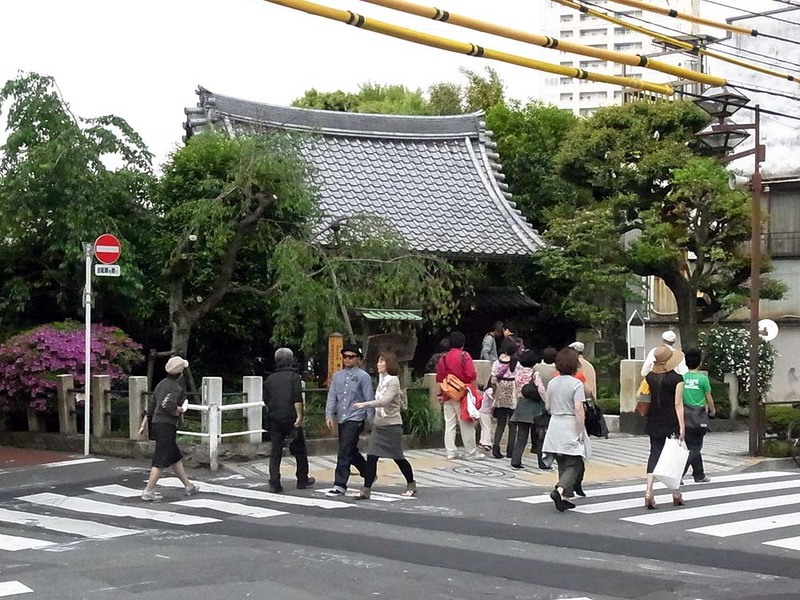 There are other temples in the neighborhood. 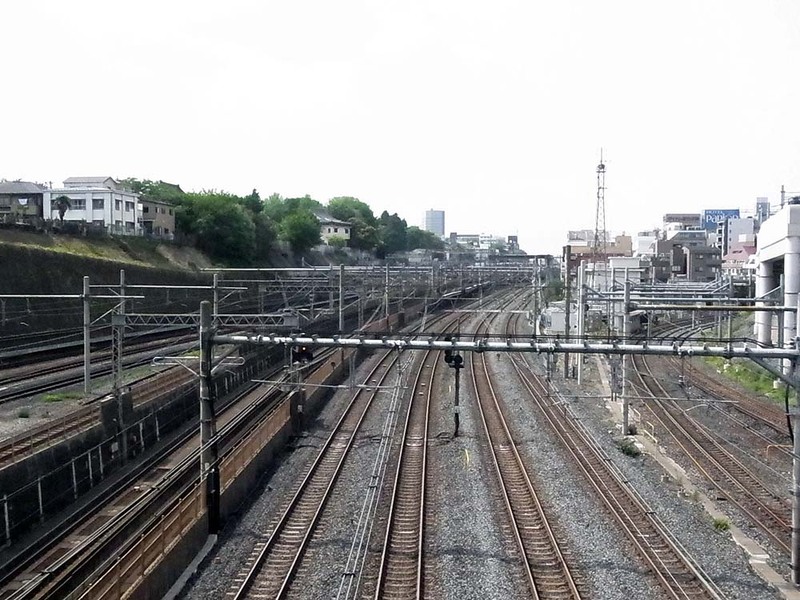 A landscape seen from the bridge in front of the station north exit. 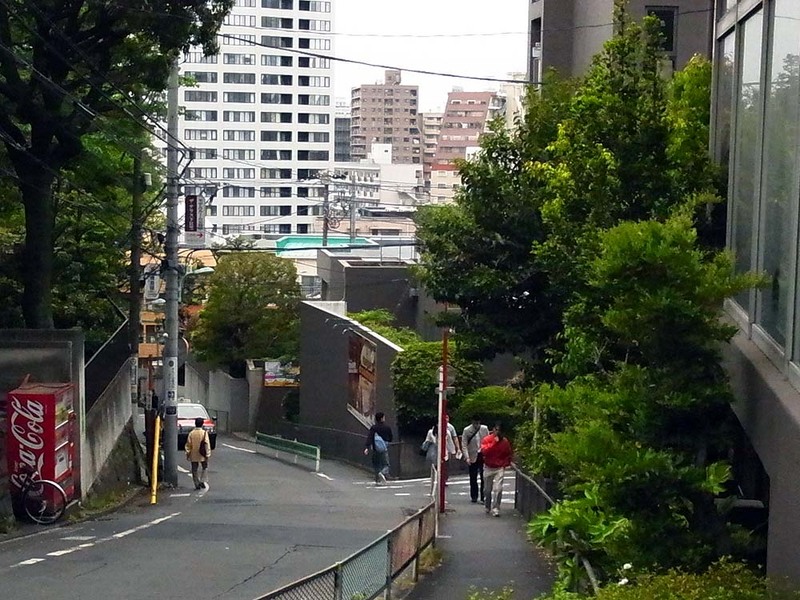 The left side in the photo is a hill and a residential area. 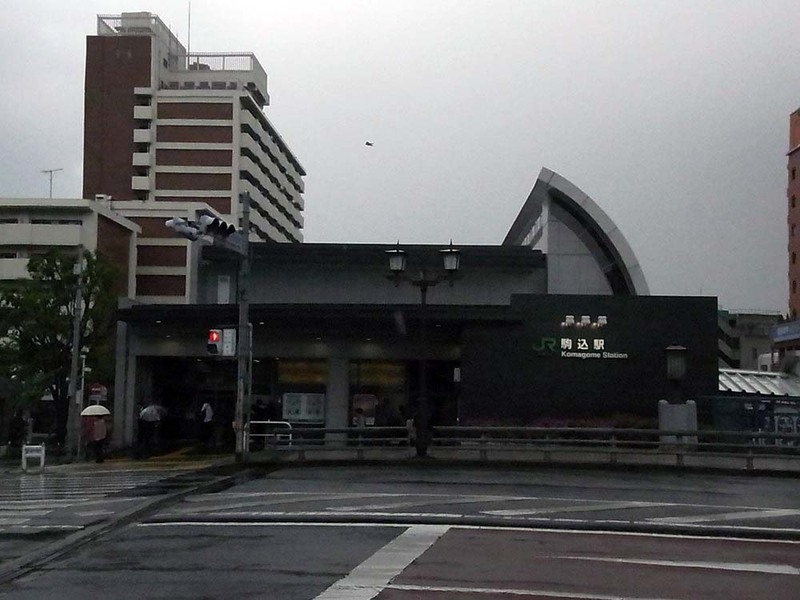 Uguisudani Station. 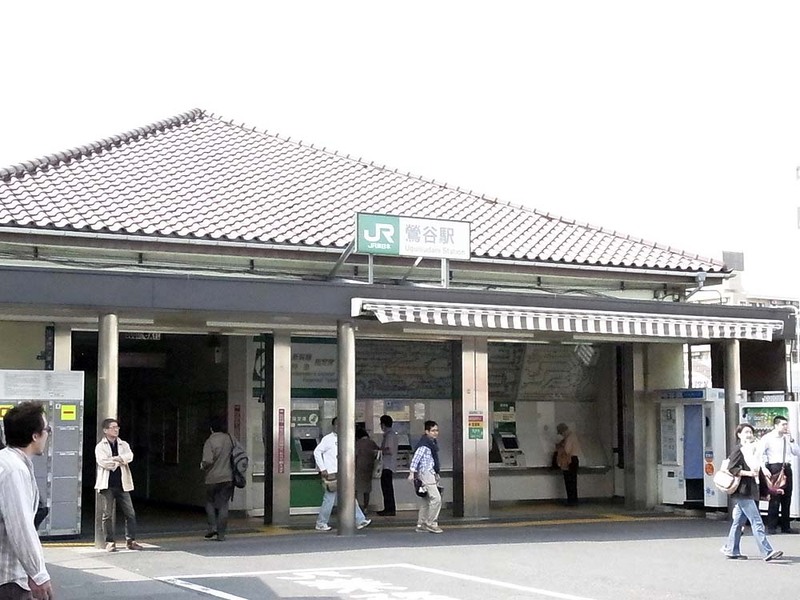 The tiled roof of the station is rare as station's roof. 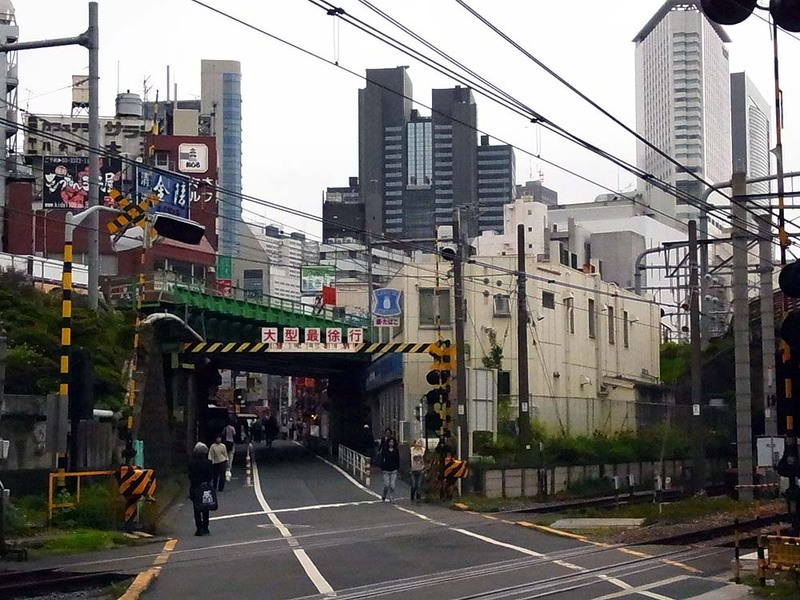 A view from the bridge near the station. 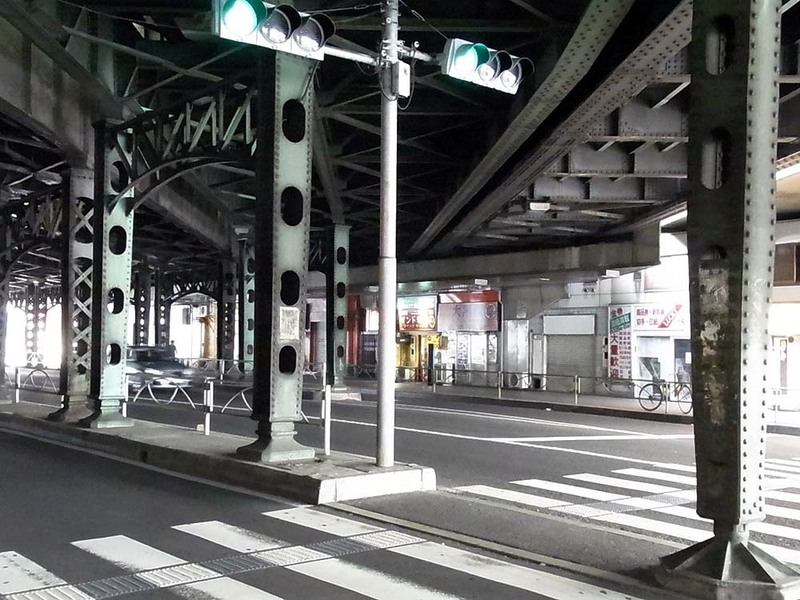 Under the bridge there are a lot of lines such as Yamanote Line, Tohoku Line, and Takasaki Line. 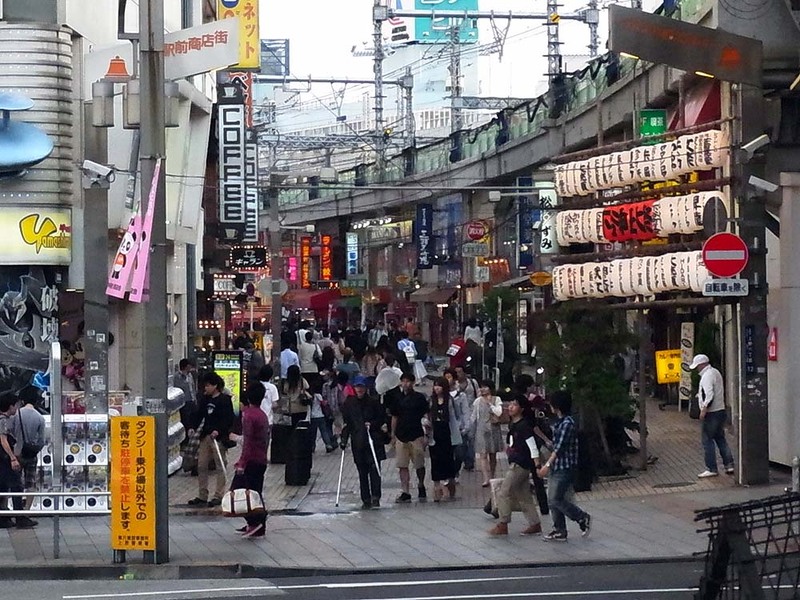 A street scene around the station. 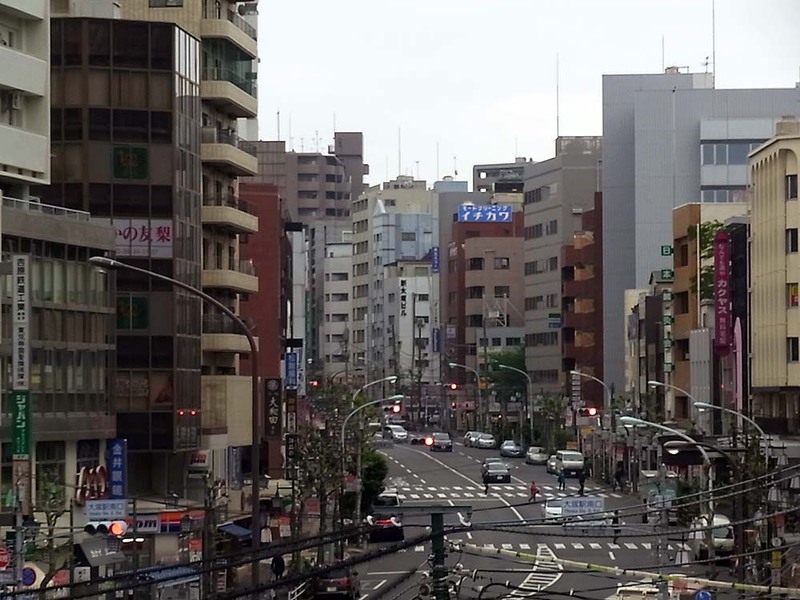 Here is a residential area. Commercial facility is small. 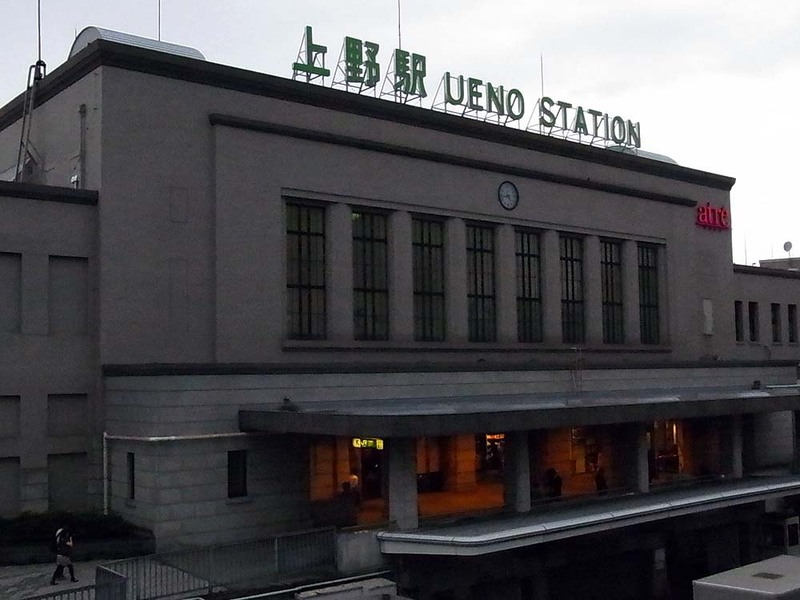 Ueno Station. 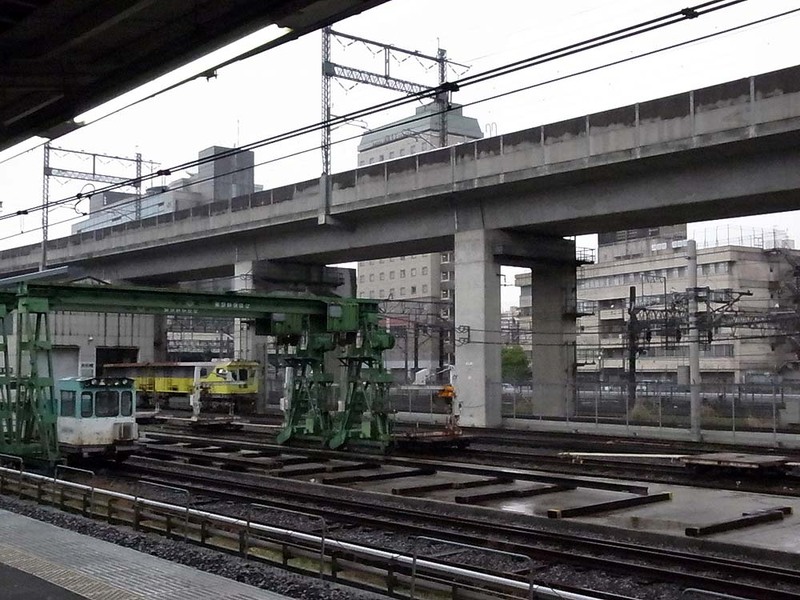 It is a large station that has a lot of platforms heading to and coming from east Japan. 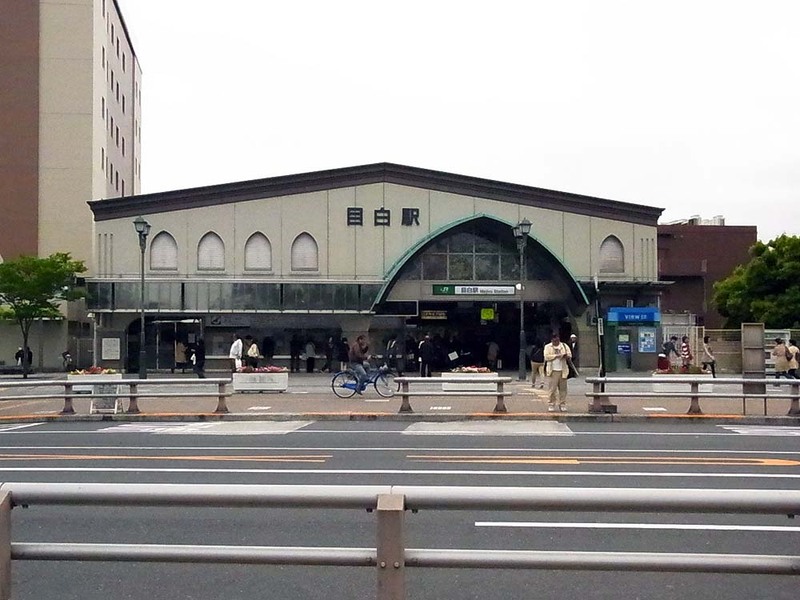 The exit in Ueno Park side of the station. 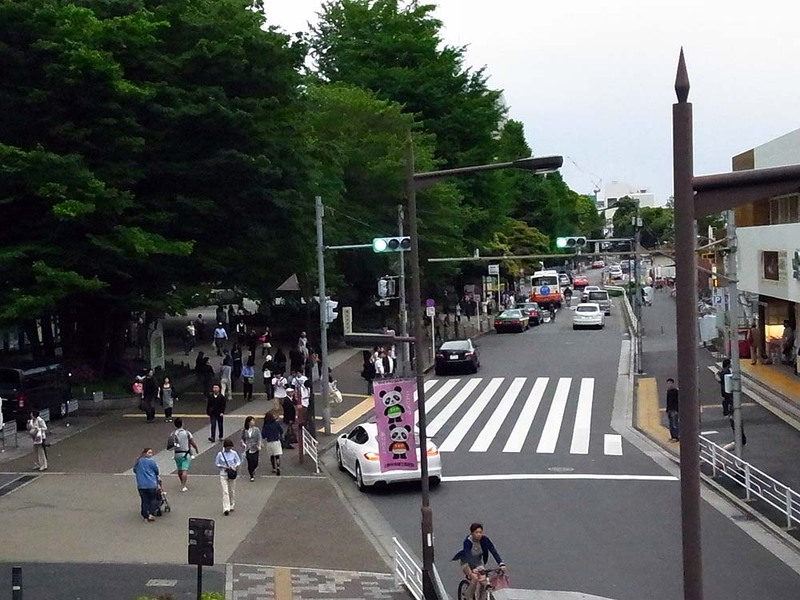 The left side in this photo is Ueno Park. 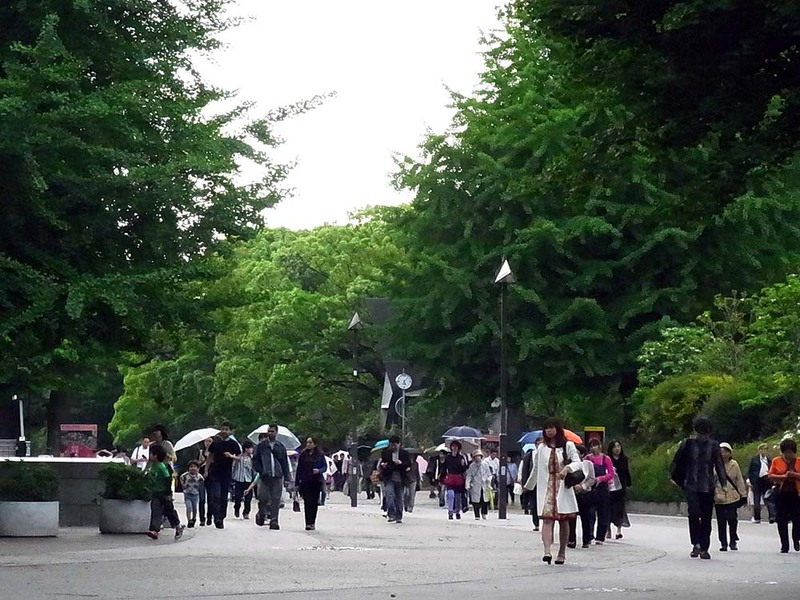 A scenery seen from Ueno Park side exit. The exit is located at a little high. 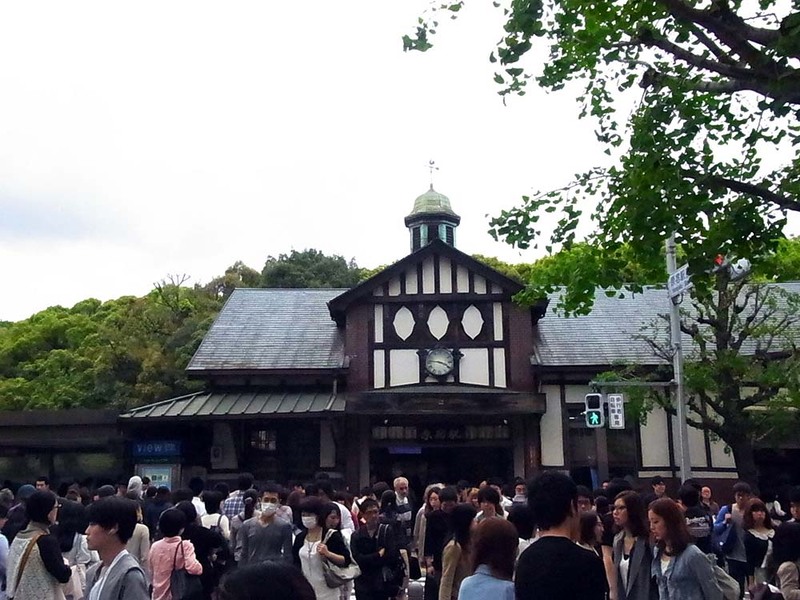 The entrance of Ueno Park. 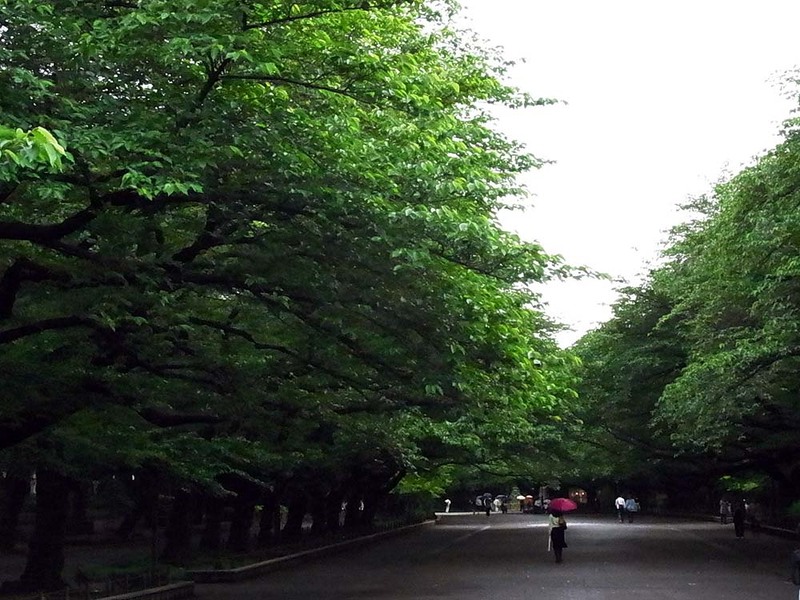 A scenery in the park. 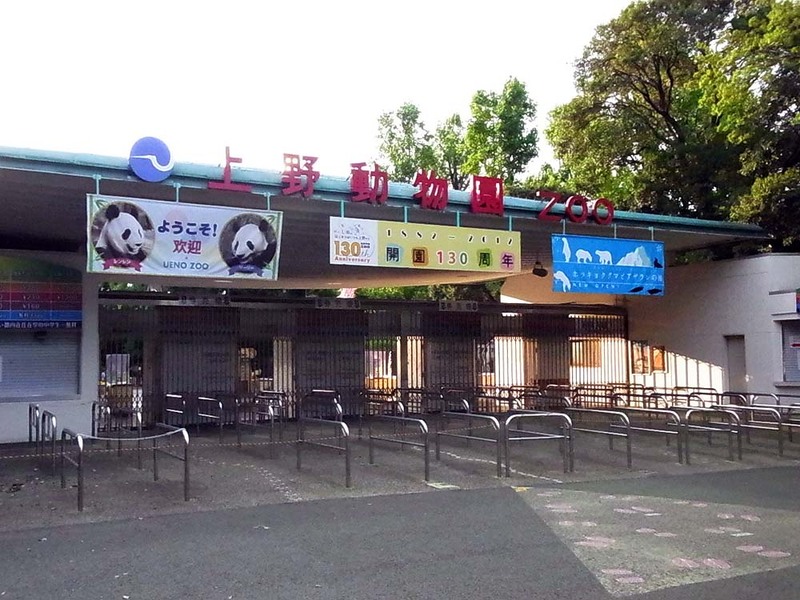 Ueno Zoo. 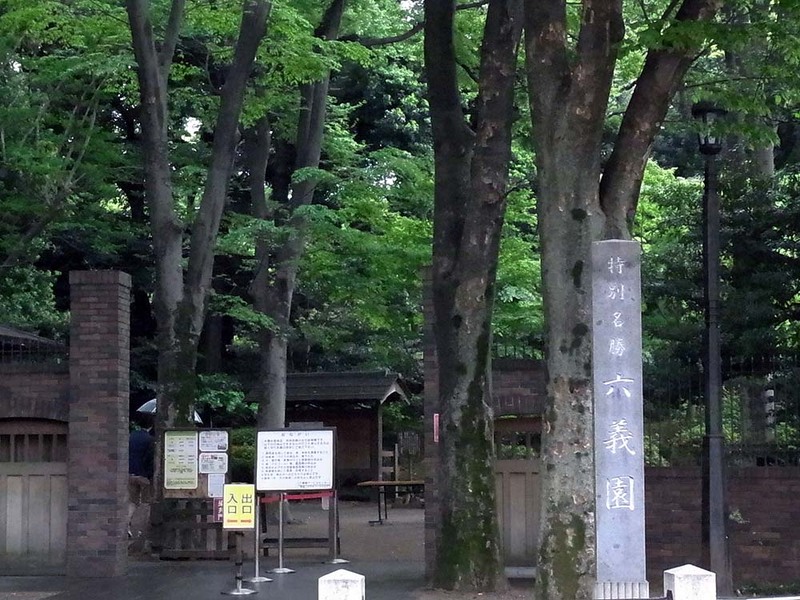 It is located at the very back of the park. 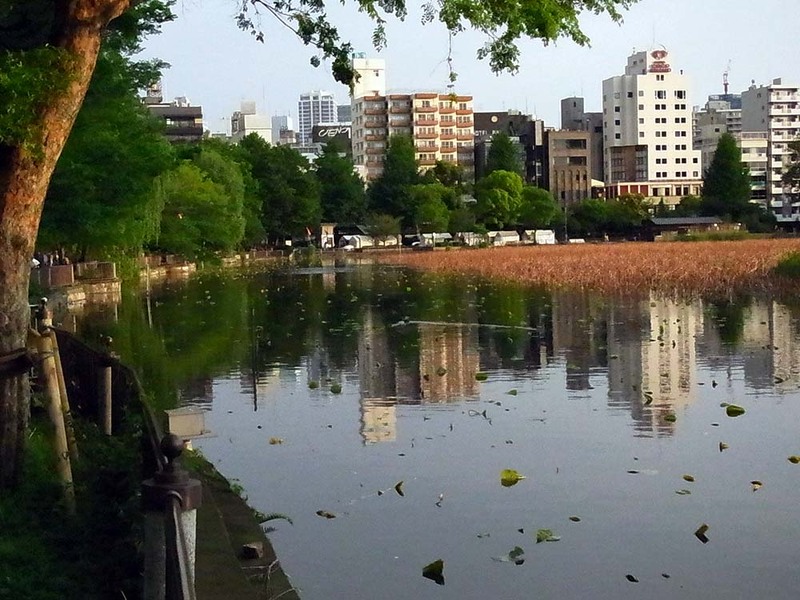 Shinobazu Pond in Ueno Park. 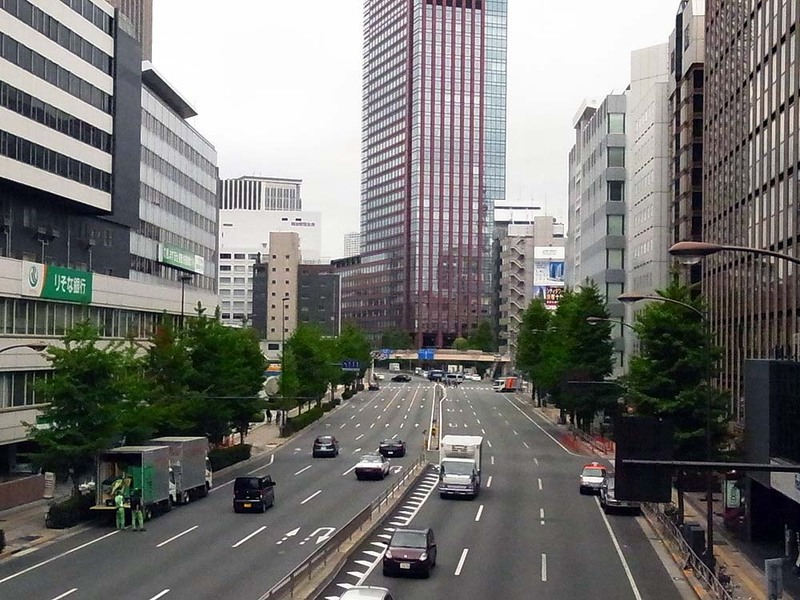 It is amazing that there is a place to open a free field of view in the center of Tokyo. 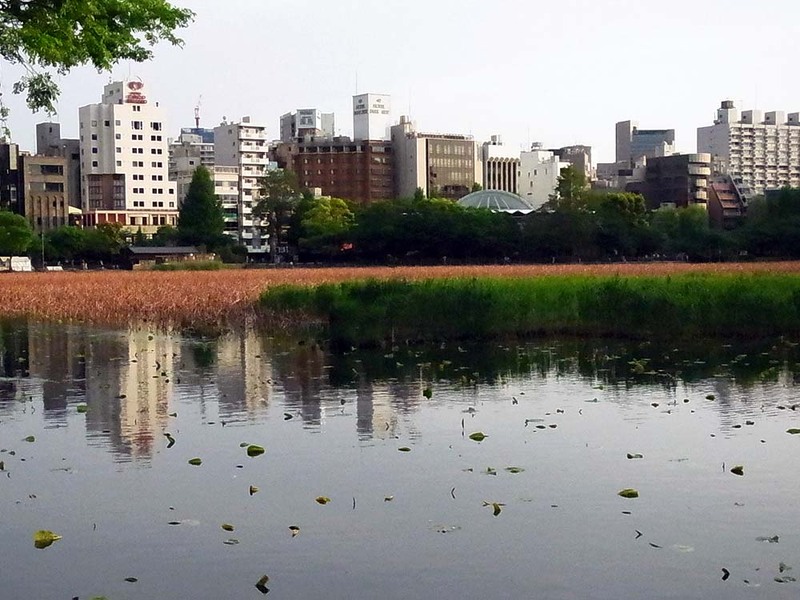 If you walk along Shinobazu Pond, you would feel you are standing in the big space of the big city. 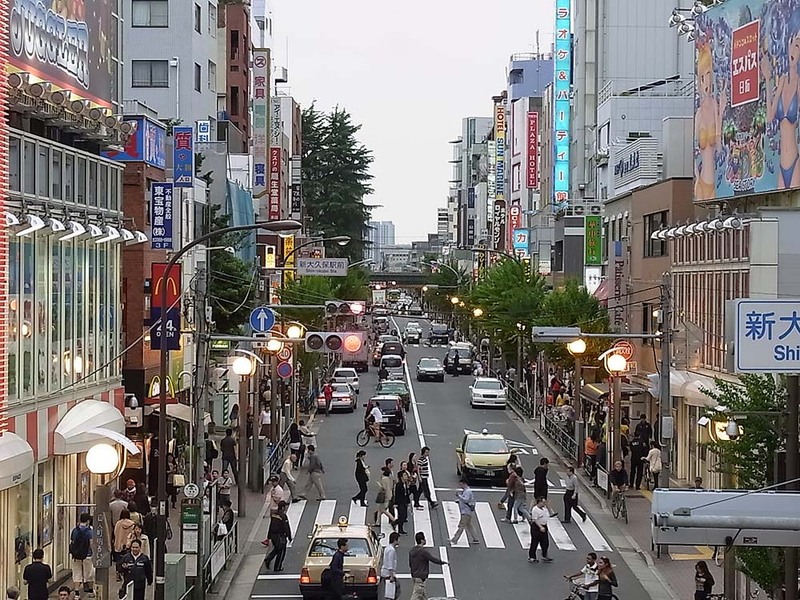 Ueno Hirokoji. 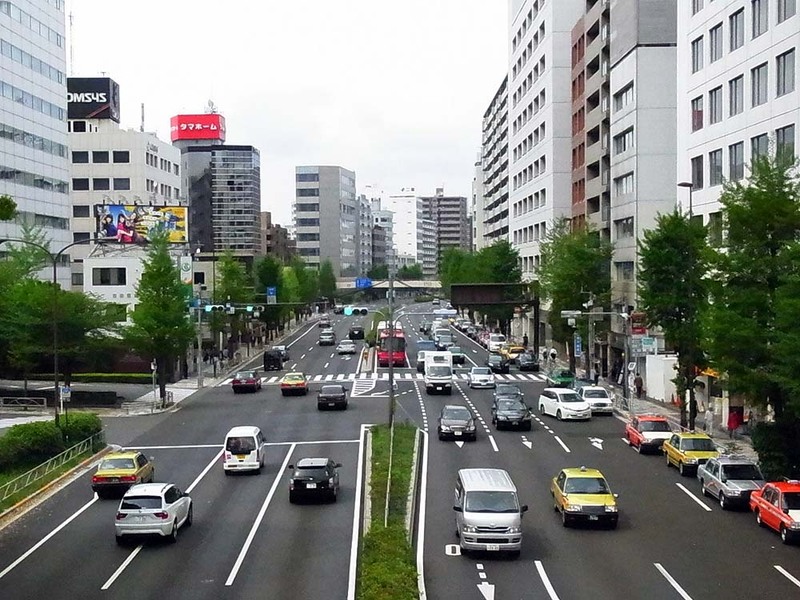 It is a commercial area in Ueno. 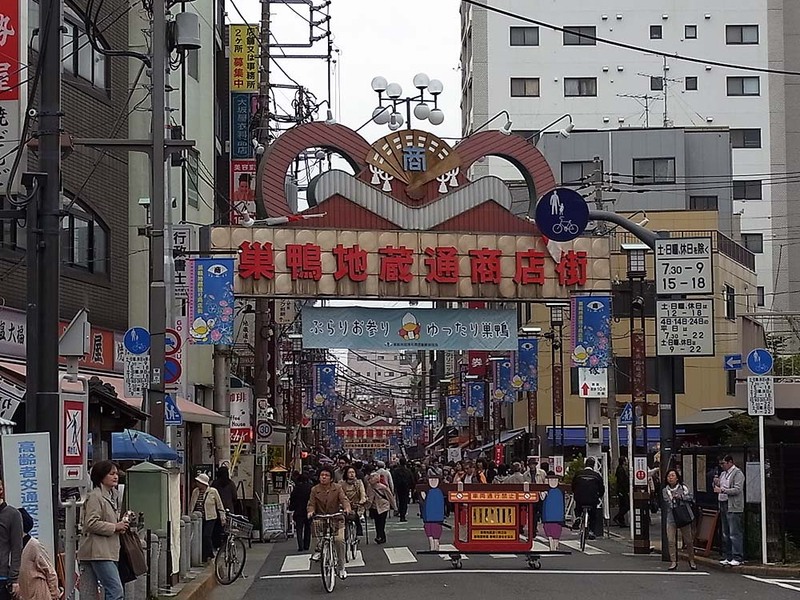 Ameya-yokocho Laneway entrance in front of Ueno Station. 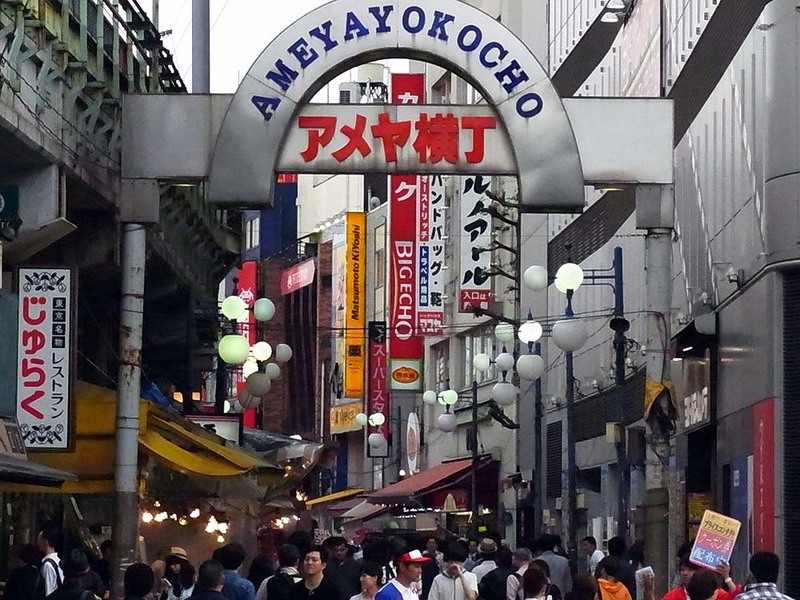 Ameya-yokocho Laneway has continued to Okachimachi. 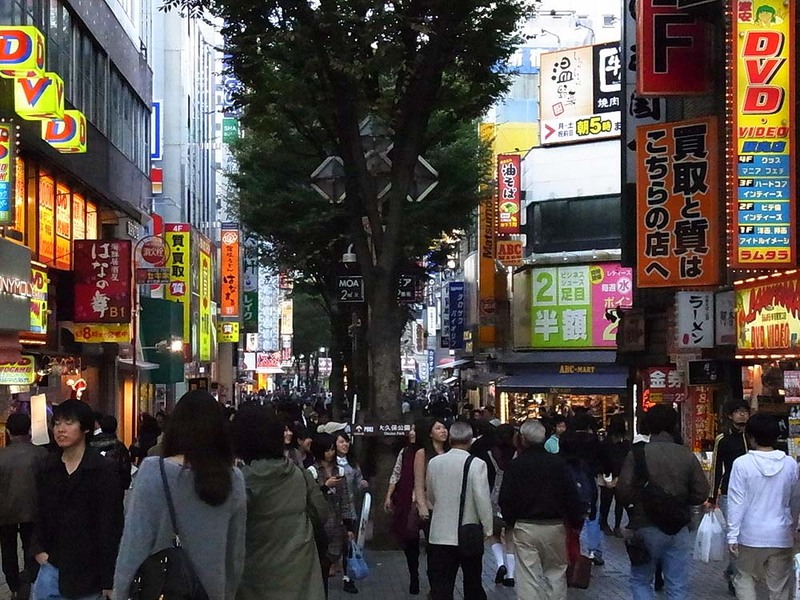 A bustling shopping street just along Yamanote Line in Ueno. 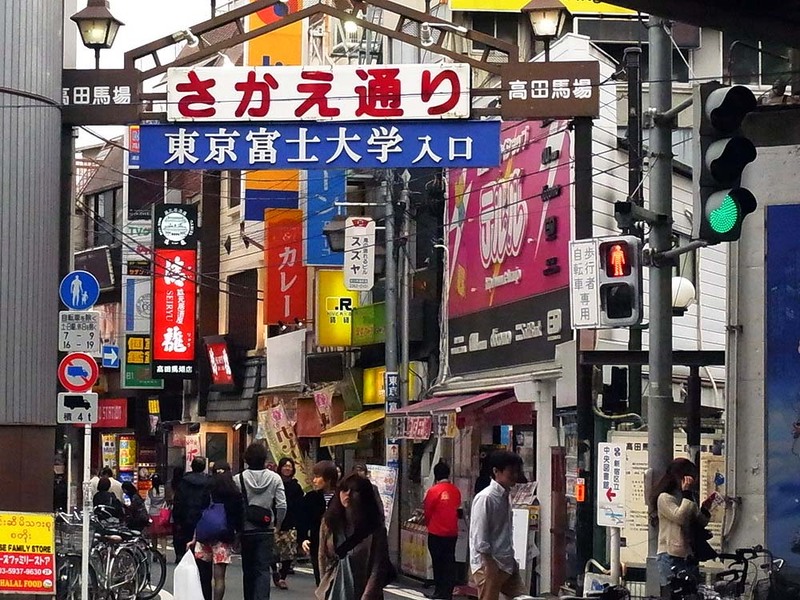 Ameya-yokocho Laneway entrance in front of Okachimachi Station. The main street in front of the station. 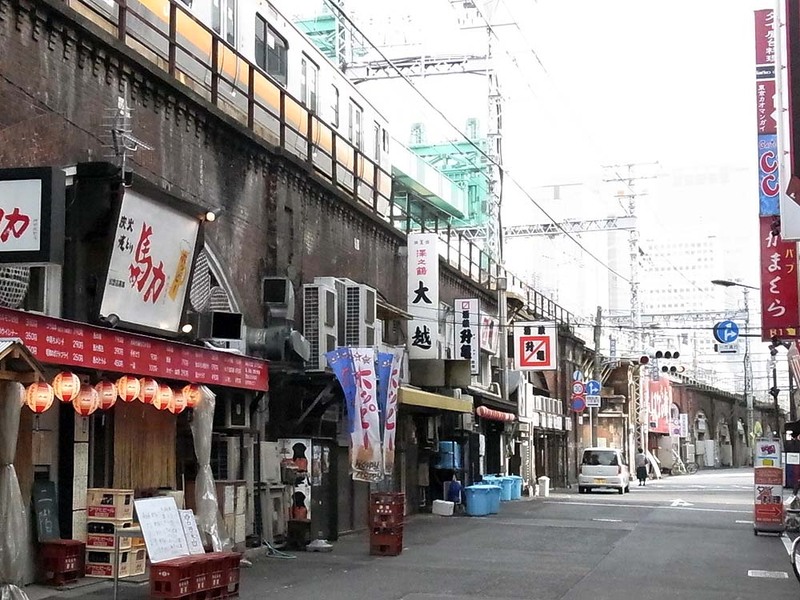 The entrance of a side street located in the east side of the station. Large buildings are lined along the boulevard which runs the west side of the station. 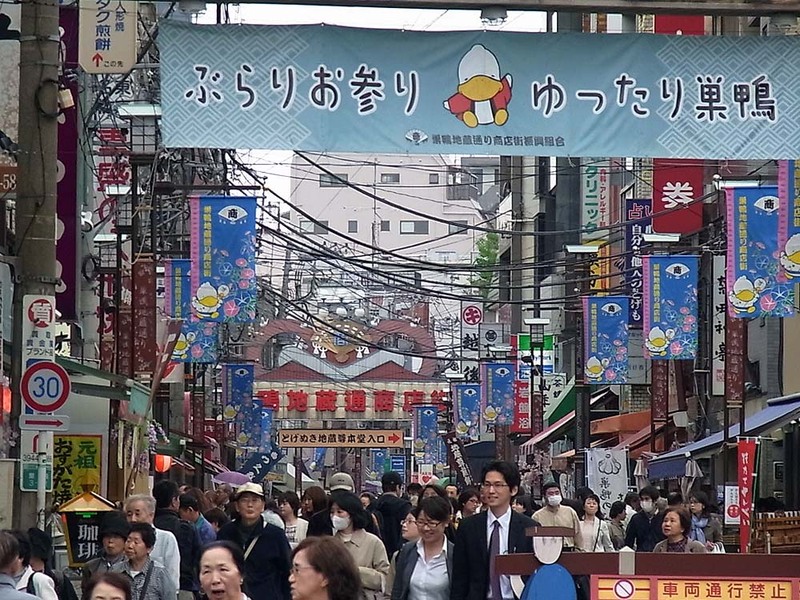 A scenery of Ameya-yokocho Laneway. 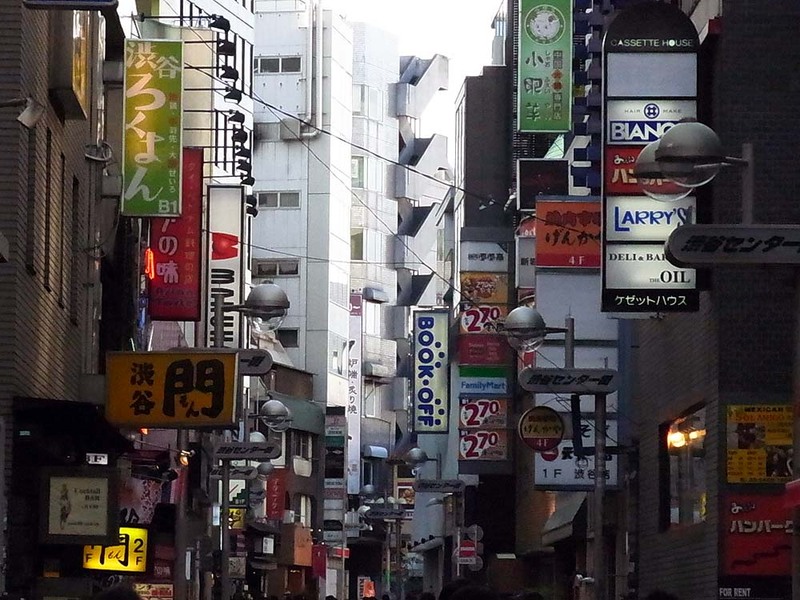 There are a lot of signboards. 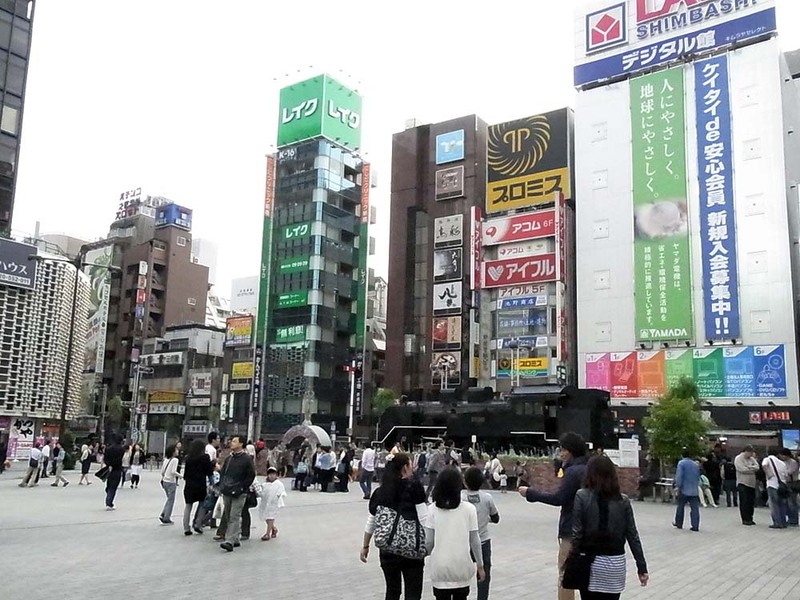 The north side of Akihabara Station. 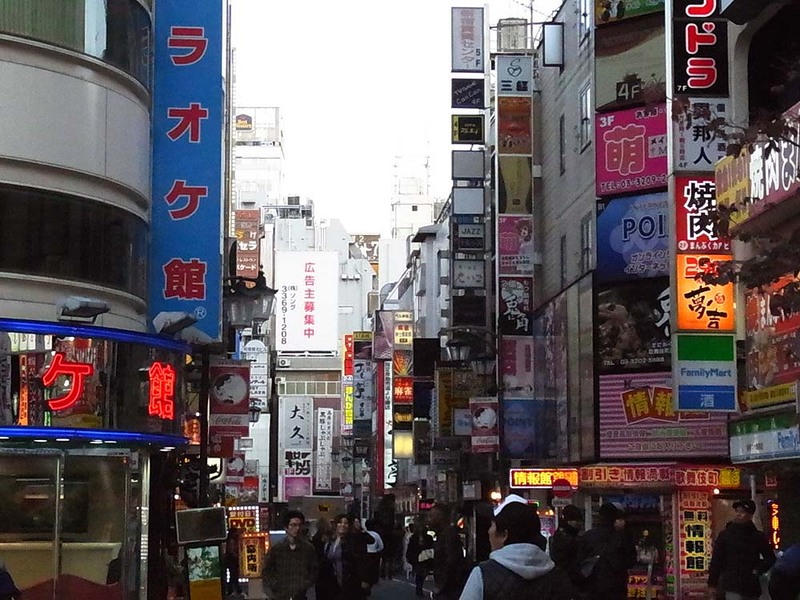 Akihabara Electric Town near the station. 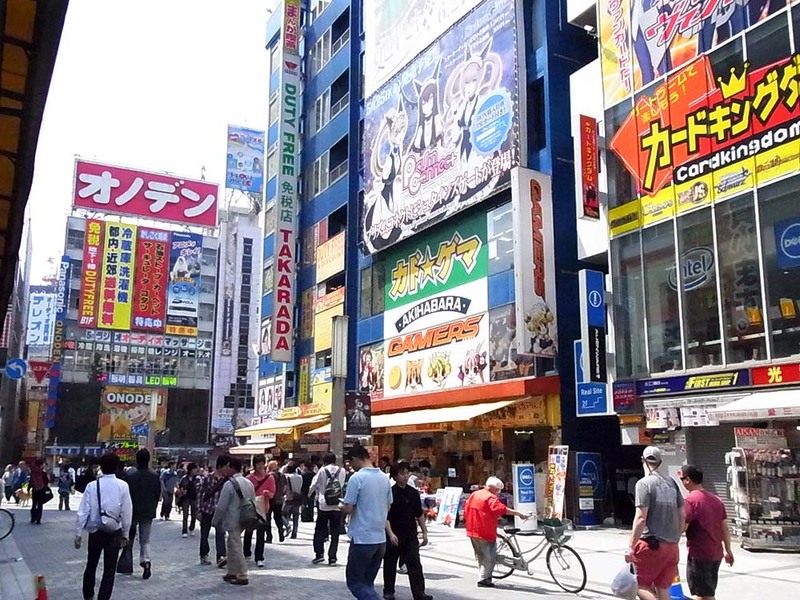 The main street which runs west of the station is the center of Akihabara downtown. 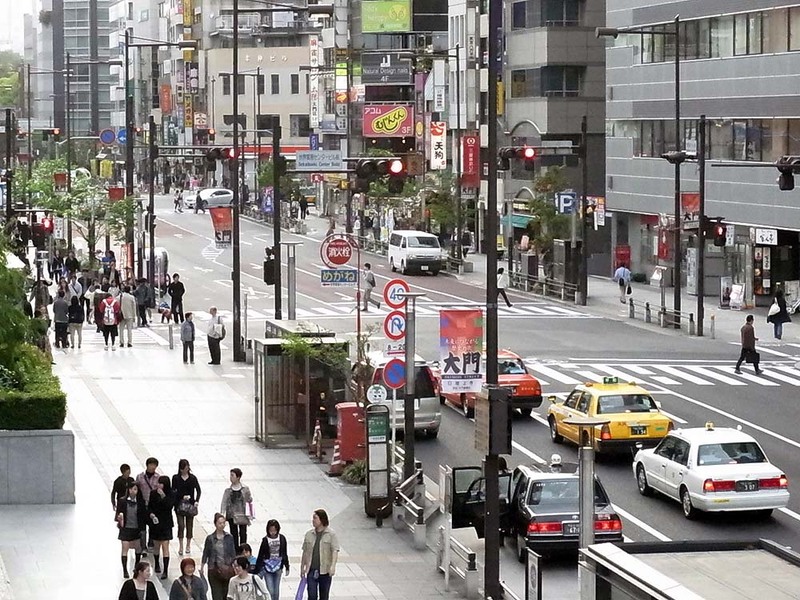 As it was a holiday, the street was a pedestrian precinct. The main street on the holiday. 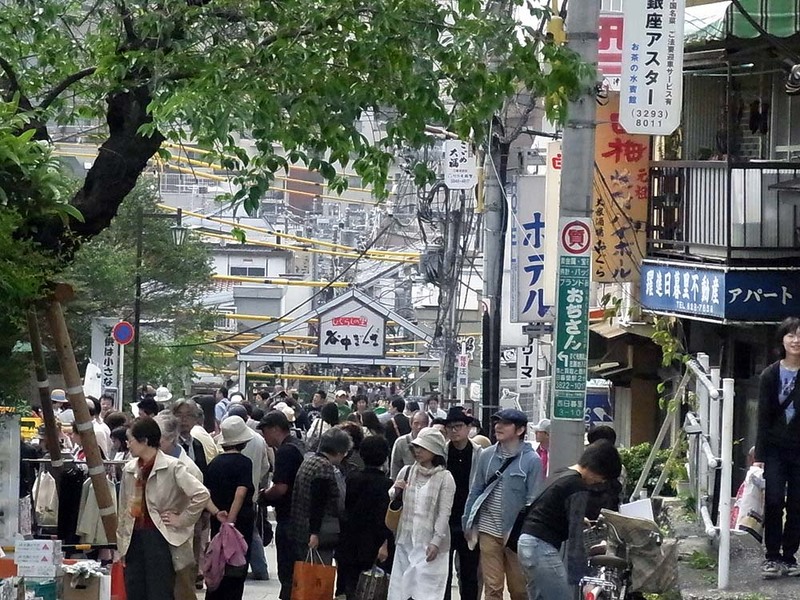 The main street was full of shoppers. 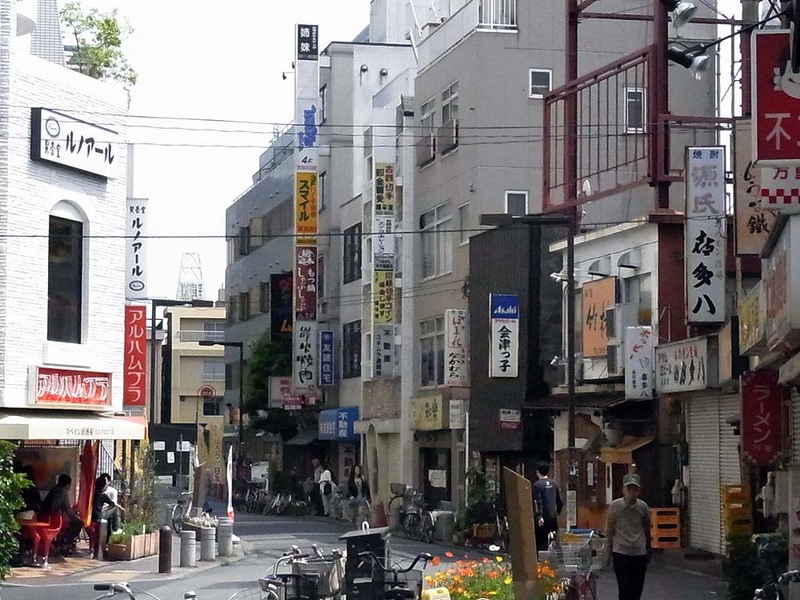 A scenery of the narrow side street away from the main street. 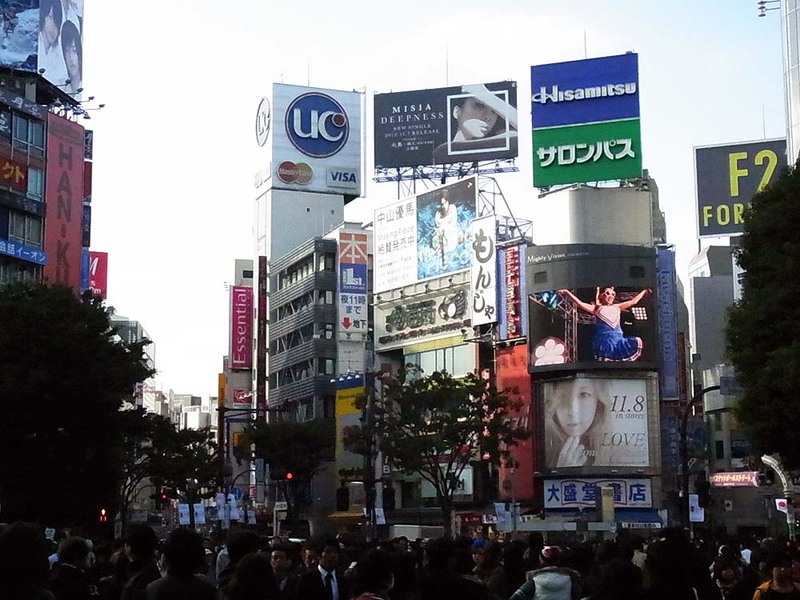 It is bustling with shoppers. 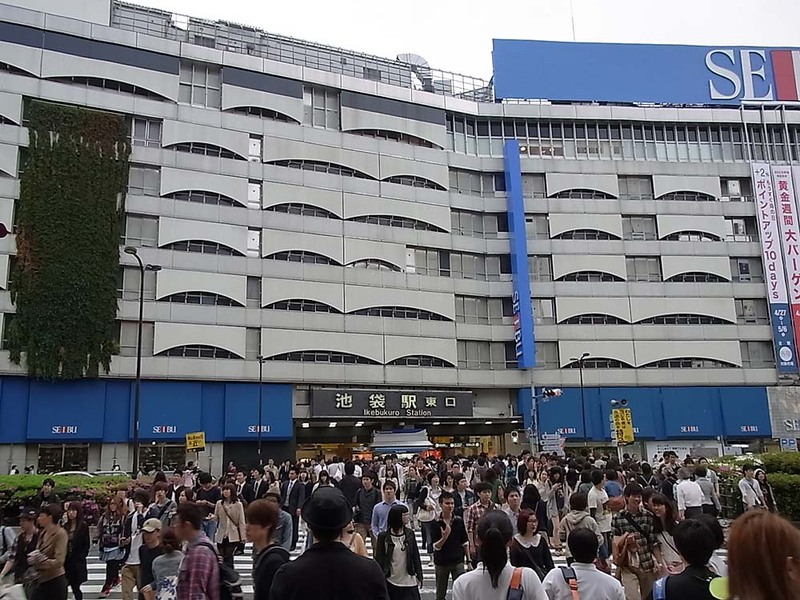 The north side of Akihabara Station. 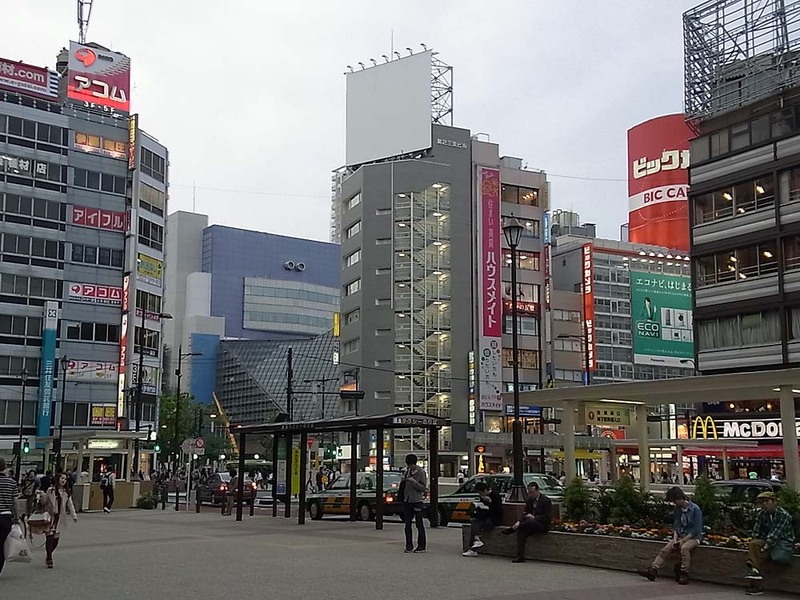 The area is a office area in contrast to Akihabara Electric Town. 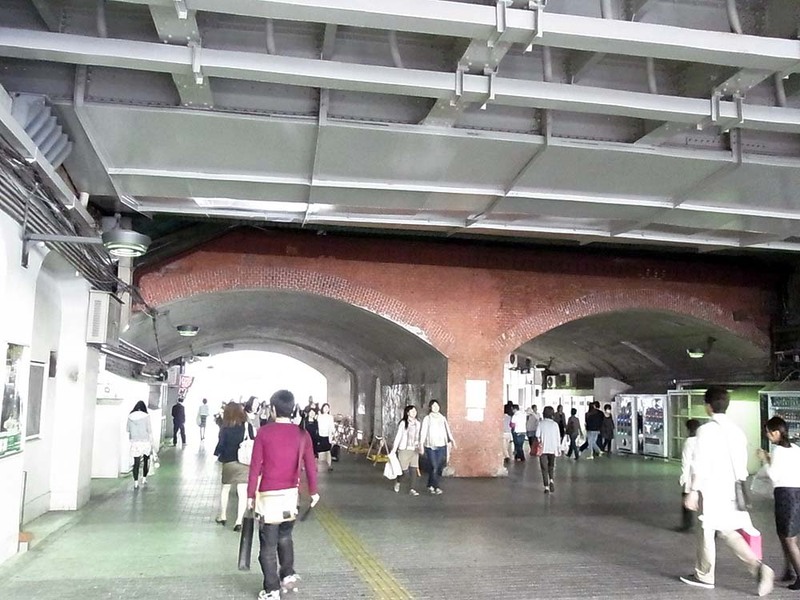 Kanda Station enterance is under the platform. 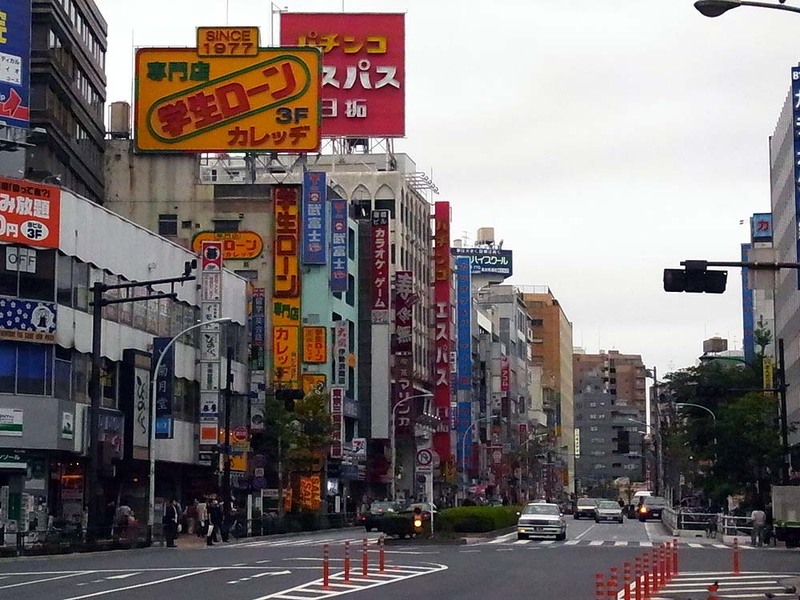 The main street near the station. 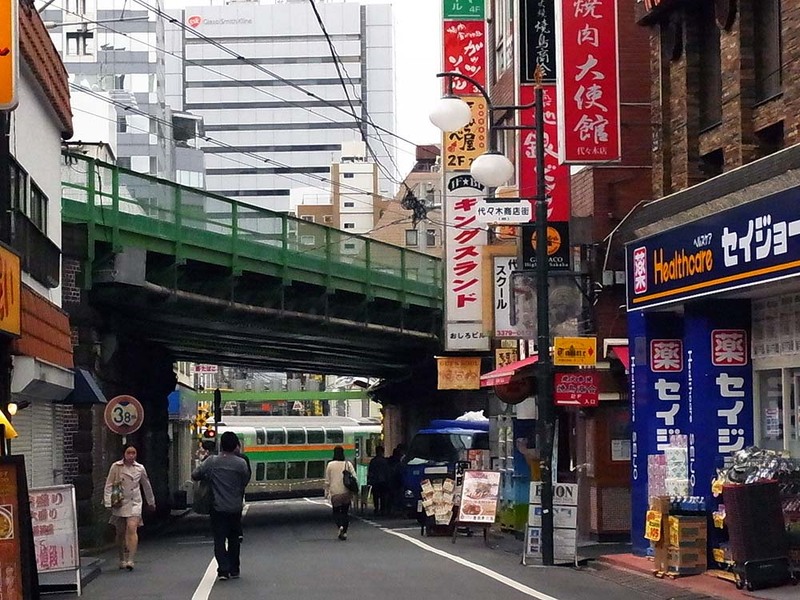 A scenery of the street just under Yamanote Line. 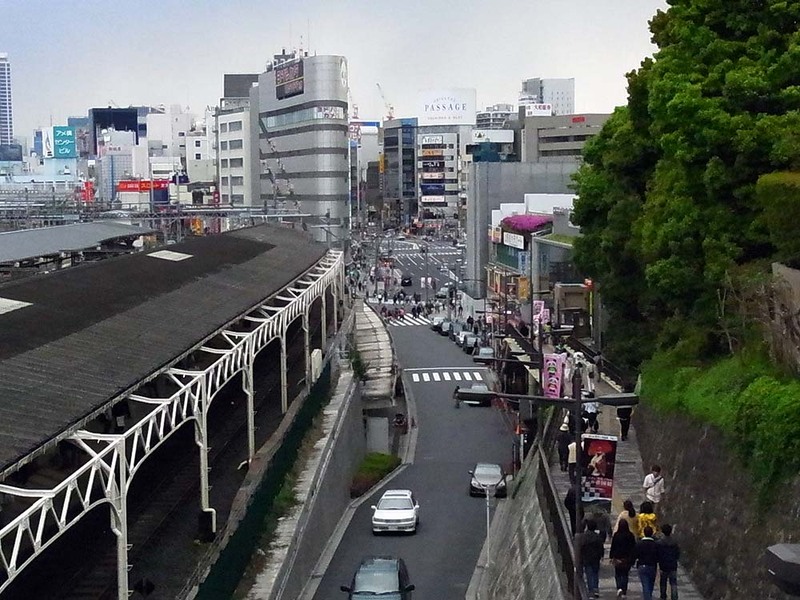 The shopping street that follows along the curved railroad line near the station. The bar street. 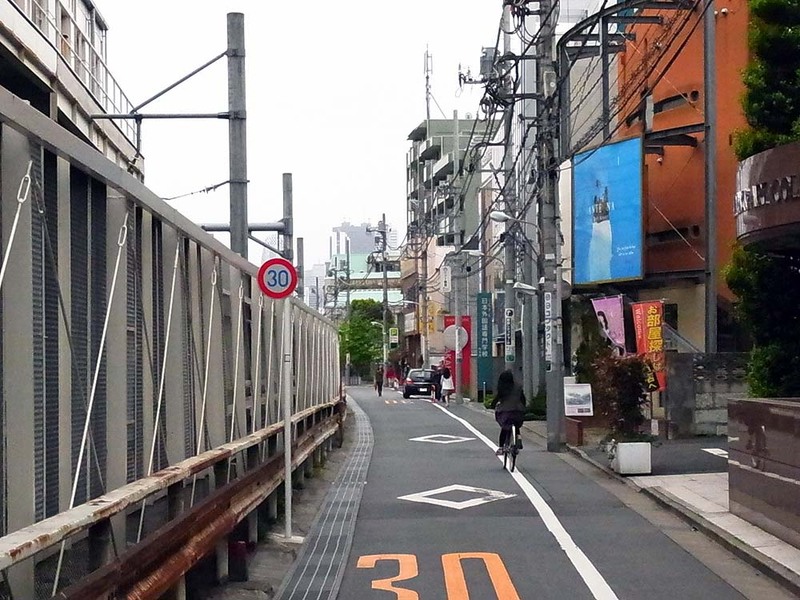 The bars stand under the railroad line. 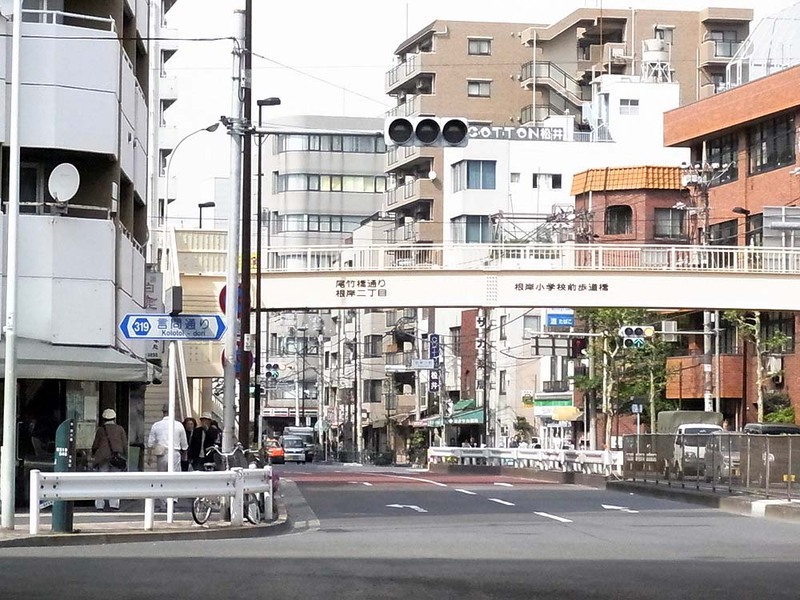 A scenery of the railroad line in Kanda.